This page has been viewed more than 130,000 times; thank you so much! The response to my LAX Through the Years photo essay has been overwhelming, and prompted me to create a similar page for the two main New York airports, La Guardia (LGA) and John F Kennedy International Airport (JFK), originally known as Idlewild (IDL), although its official name was New York International. I first visited LGA in 1956, on a father-and-son trip to Washington DC and Gotham City, but unfortunately took no pictures. It was another five years before my first landing at IDL; little did I imagine that it would become my domicile later in life, for the better part of 14 years. So here are the images; click on individual pictures for a larger view. I’ve taken the liberty of setting the stage with a few shots from others; the rest were taken by me, along with a sprinkling from my late brother Bob. I hope you enjoy them. My father flew into and out of La Guardia several years before I was a twinkle in his eyes, piloting DC-3s for American Airlines. Before he was assigned to the China-Burma-India theater during World War II, Dad was commander of the Air Transport Command (ATC) at La Guardia, so naturally that airport was of special interest to me. 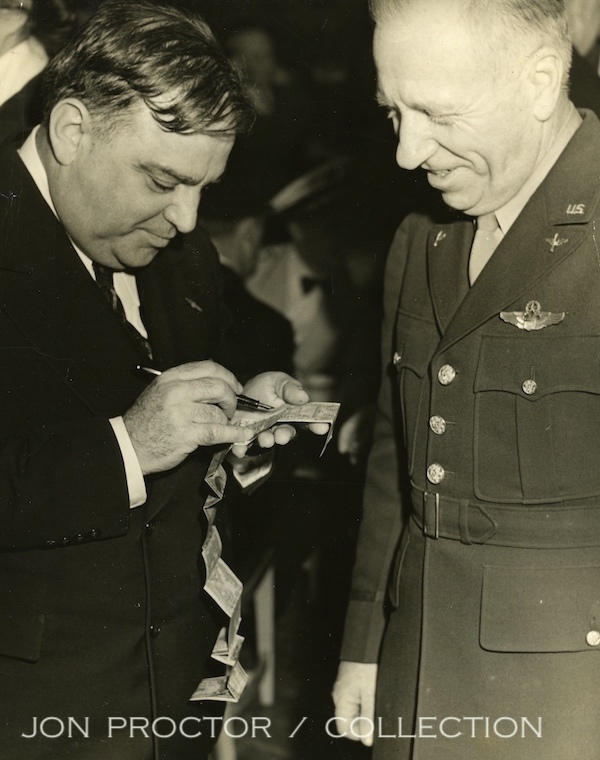 New York City’s Mayor F H La Guardia adds his name to the long list of famous signatures on the “Short Snorter bill” of Lt Col Willis H Proctor, commanding Air Transport Command installations at La Guardia Field, on the occasion of the airports fourth anniversary today (December 2, 1943). The Celebration at the airport Terminal Building honored the Army airline as the Municipal Airport’s newest tenant of nearly five month’s standing. Lt Col Proctor was formerly a chief pilot for American Airlines, another of the field’s tenants. “Short Snorters” are persons who have made trans-ocean flights. 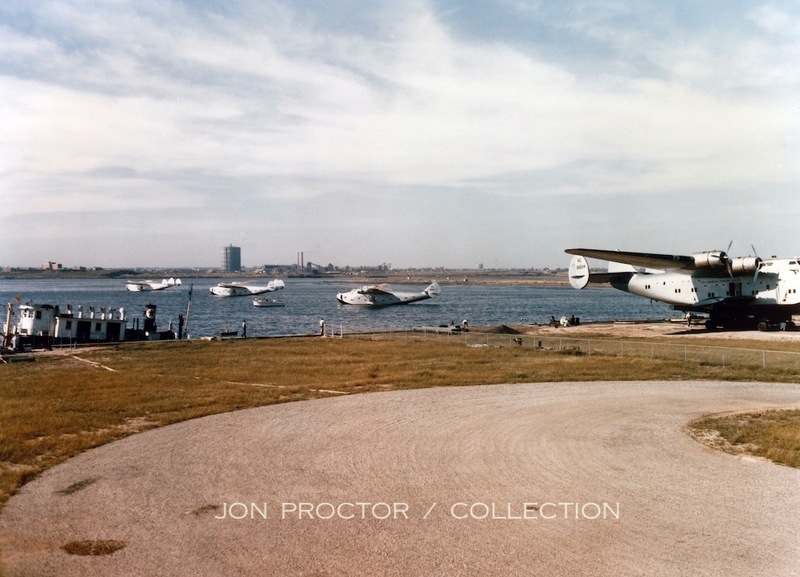 Few in today’s generation realize that Pan Am’s Boeing 314 Flying Boats called at La Guardia* from March 1940, when the Marine Air Terminal was dedicated. The huge Clippers formerly operated from nearby Port Washington. This picture, showing a substantial portion of the 314 fleet, was given to me with no photo credit indicated. It’s too beautiful to pass up! * Is it La Guardia or LaGuardia Airport? Most modern-day references use LaGuardia, but the field was named after New York Mayor Fiorello H La Guardia (above), who championed development of a real New York City commercial airport and once refused to get off a plane at Newark because his ticket read ‘New York.’ In deference to the good mayor, I use La Guardia throughout my website. 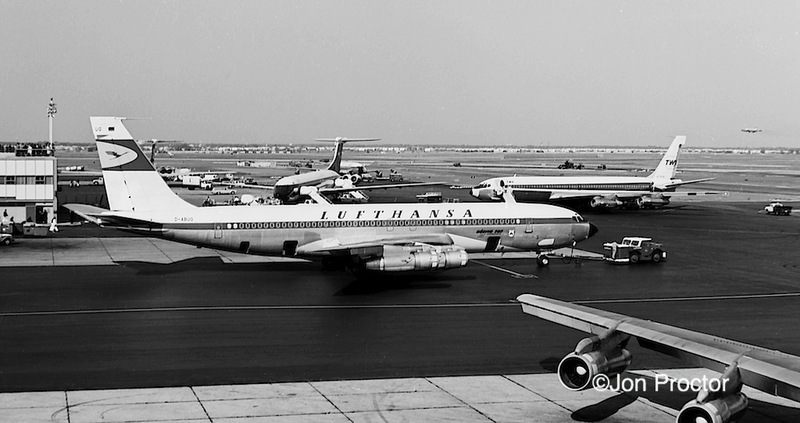 Probably shot from the control tower, sparkling TWA DC-4 N45346, The Acropolis, poses on the La Guardia ramp. This is actually a “civilianized” C-54 acquired by the airline at the end of World War II. A TWA photo, it was photographed shortly after the “C” was removed from “NC” registrations, right around the end of the 1940s. 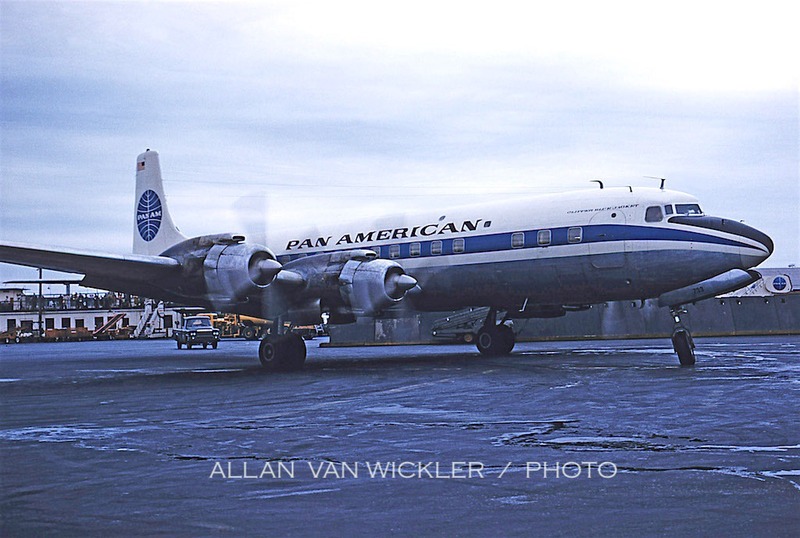 My good friend Allan Van Wickler, working for Pan Am at the time, caught these classic pictures at Idlewild. Above, passengers deplane from a Seaboard & Western 1049H Constellation charter flight on the southern-most ramp of the original 1948 terminal, where Saarinen’s TWA Flight Center terminal now stands. 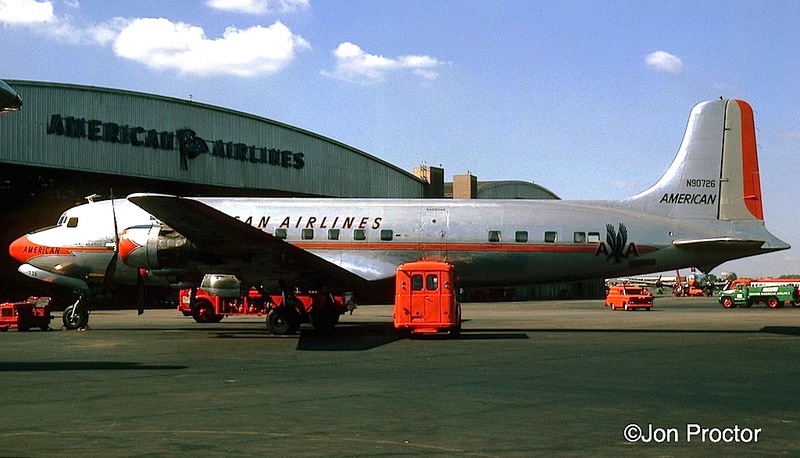 No, Pan Am wasn’t operating DC-3 passenger service in 1958. N54705 was used as a test bed for new and innovative electronic components before purchase and installation on the PAA fleet. Perhaps to reassure the traveling public, small “Instrument Laboratory” titles were applied, just below the window line. 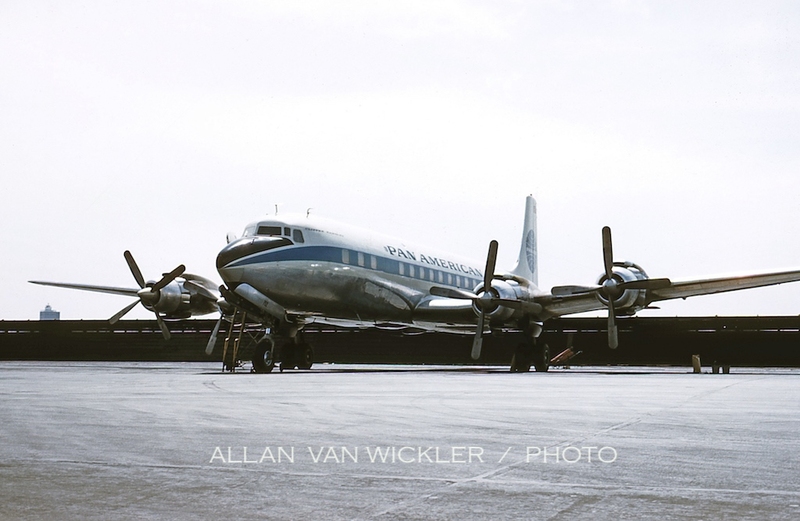 Van shot these April 1958 sequence photos in front of the Lockheed Air Service International (LASI) hangars, located on the Rockaway Boulevard/150th Street side of the airport. 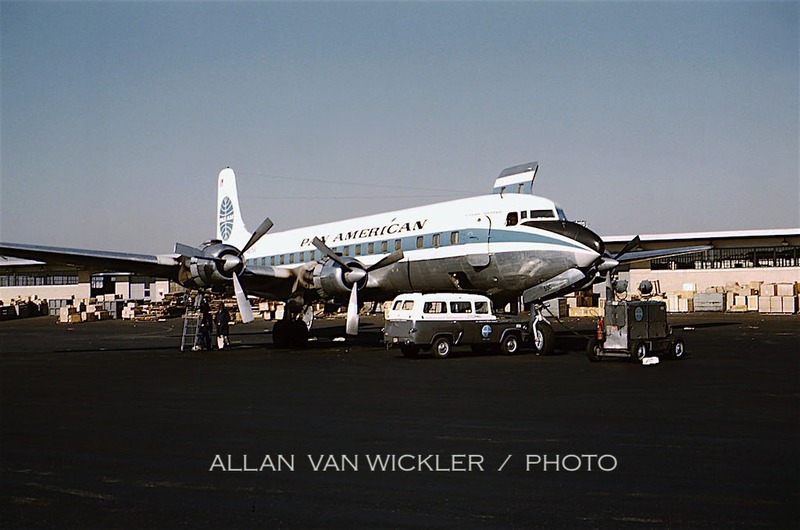 The first image shows a Pan Am DC-6B and Stratocruiser on the left. 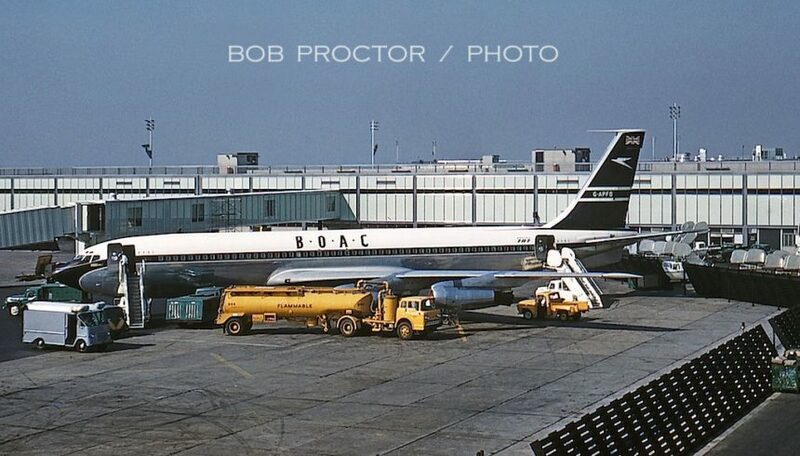 Farther down the ramp, a BOAC Britannia is hooked up to a ground power cart, ready for engine start. Another Pan Am Stratocruiser faces the camera, and what appears to be a BOAC Stratocruiser is on final approach to Runway 13 Left. From the second floor of an LASI hangar (or from the roof?) we see nearly head-on shots of the same Pan Am DC-6B and Stratocruiser as the BOAC Britannia taxis past. TWA’s Hangar 12 is barely visible in the distance, on the right. 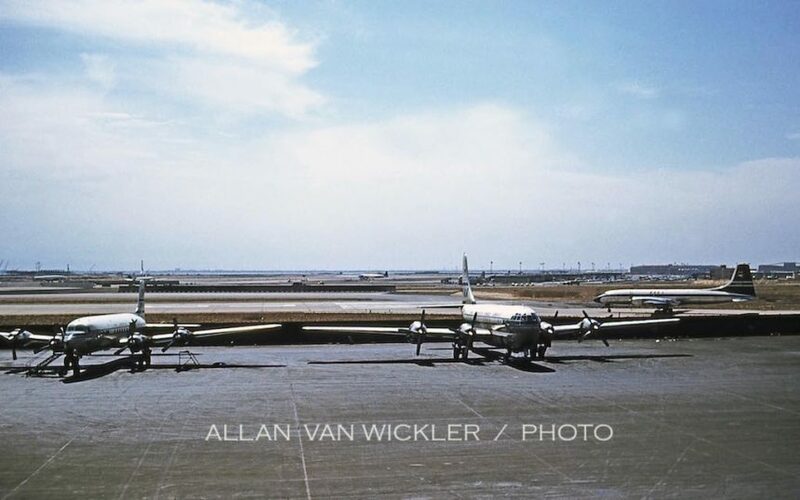 To the left, three Pan Am DC-7Cs sit between flight assignments. Behind them, a Pan Am DC-6B lifts off from Runway 13 Left, with the new control tower and International Arrivals Building (IAB) visible in the background. These structures were officially opened on July 31, 1957. Center aircraft in the above photo, N752PA, Clipper Rambler wears the new 707 “meatball” livery. 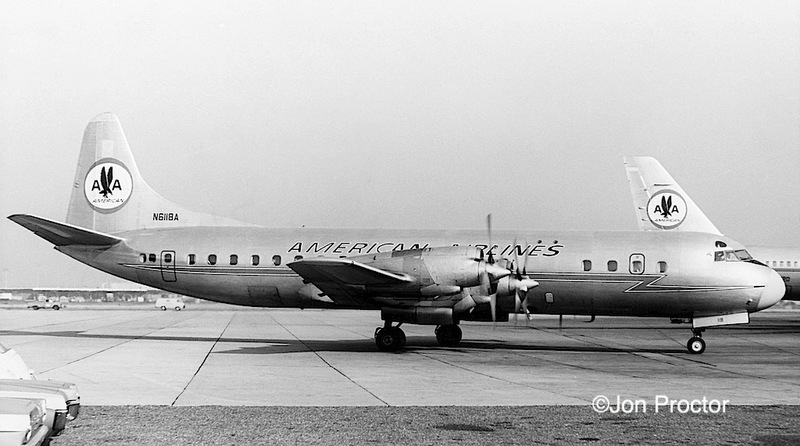 Like several of its sister ships, it was later modified to carry freight only, becoming a DC-7CF. 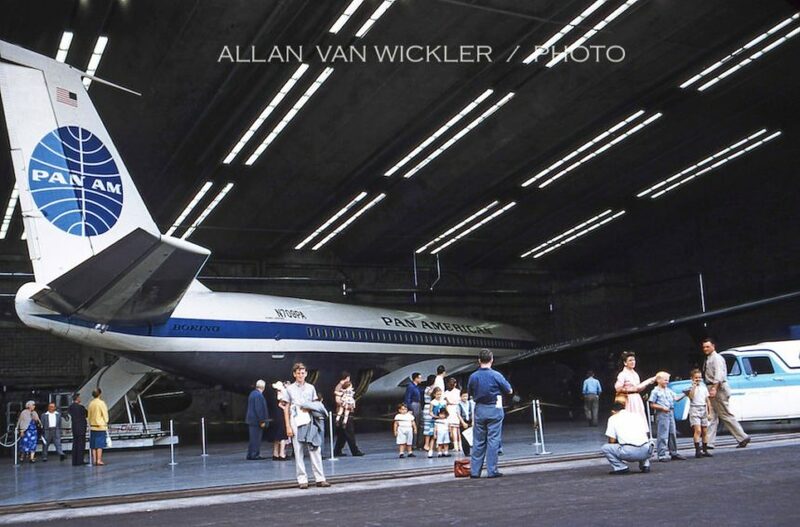 Above and Below: In September, Pan Am’s first-to-be-delivered 707-121 was placed on display in Hangar 14, allowing employees and invited guests an opportunity to see the Jet Age up close. Third off the production line, N709PA, Clipper America, later renamed Clipper Tradewind, was tragically lost five years later when struck by lightning over Elkton, Maryland. Here are three images from November 1959. At the temporary cargo facility (TCF), DC-6A N6259C, Clipper Jupiter takes on freight. 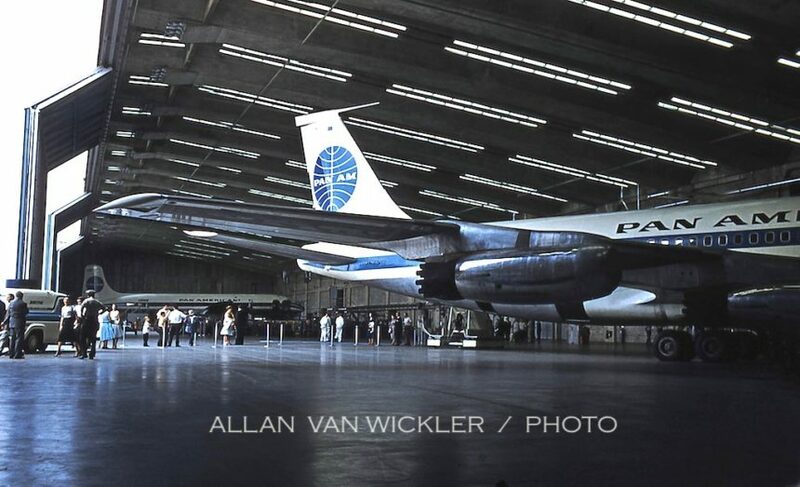 Pan Am only bought three of these convertible cargo variants, apparently for high-density passenger missions, as evidenced by the extra windows along and just ahead of the prop line, and acquired two more second hand. Jupiter was with the company the longest, six years. DC-7C N733PA, Clipper Blue Jacket departs from the TTB. Check out the crowded observation deck, partially visible under the starboard wing. This appears to be at the cargo terminal, but SABENA DC-7C OO-SFA looks to still be in a passenger configuration, perhaps parked there while awaiting a vacant gate on the crowded passenger ramp. 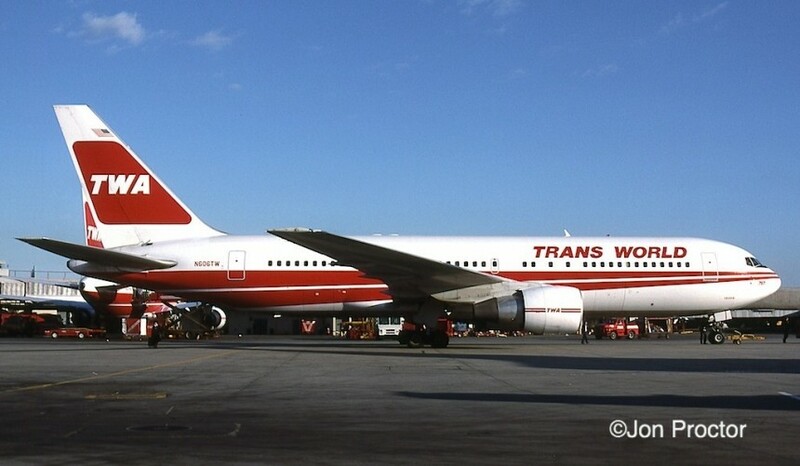 TWA’s first 707-331 Intercontinental, N761TW, is prepared for its evening departure to London, from the TTB. 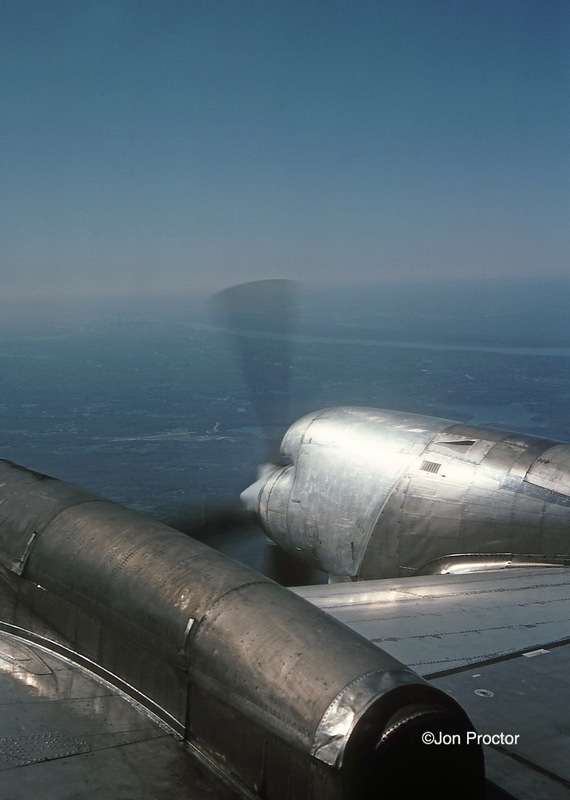 I picked this image up on an auction and the slide mount didn’t show a date, but I’m guessing it was taken shortly after the airplane entered service, on November 23, 1959. 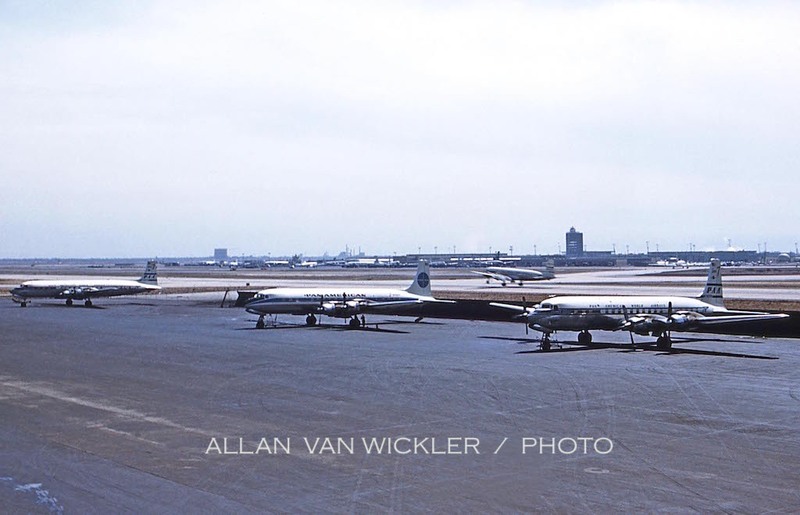 Van was headed for Detroit on a Northwest DC-6B in April 1960 when he took this sequence of three shots on departure from Idlewild. 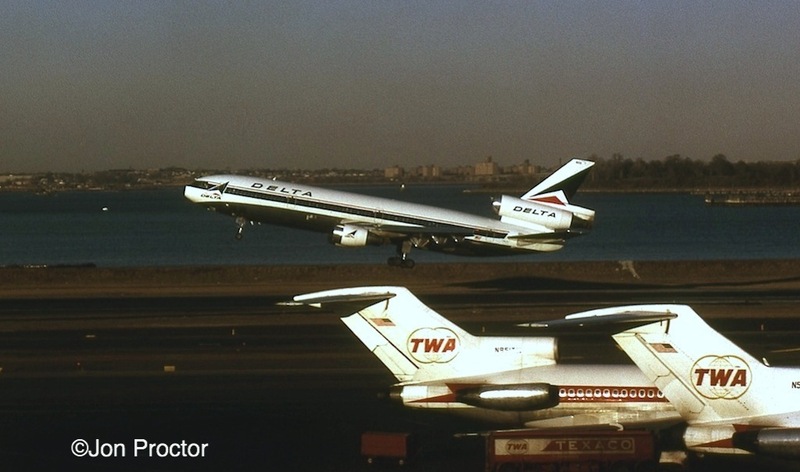 Turning onto the now-defunct Runway 25, a look back reveals a short lineup of airliners awaiting takeoff. Climbing out, the International Arrivals Building (IAB) reflects the usual mid-day lull in activity, with nothing but propliners visible. Next to the IAB, Pan Am’s new terminal complex nears completion. 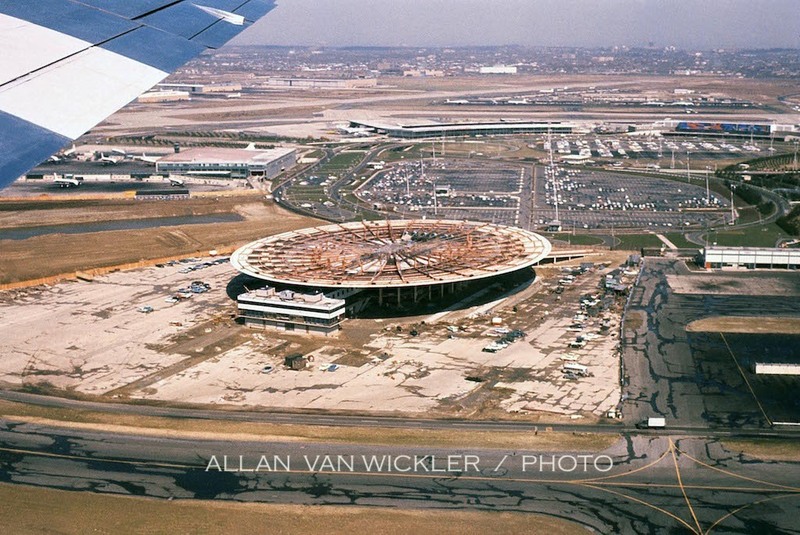 This truly historic building, renamed “Pan Am Worldport” in 1971, was finally demolished to make room for Delta Air Lines’ terminal expansion plan. Click here to learn more about its history. This is the first picture I took at, or should I say over IDL, on July 28, 1961. I was headed overnight to Chicago from the West Coast on an American pass and the LAX-ORD nonstop cancelled. The alternative was flying LAX-IDL – what would be my first of more than 500 transcon nonstops – and connecting to a morning flight back to Chicago, so I didn’t stay long. An overview of “Terminal City” is seen from 720-023B N7547A on climbout. Not all the buildings in were complete. The Northeast-Northwest-Braniff terminal, to the left of Pan Am’s terminal, is in the early stages of ground clearing and construction. In the lower right, TWA’s Flight Center nears completion, and the TTB, just above it, is still in use by several carriers. During that same month, brother Bob Proctor spent a day at IDL and took these six pictures. 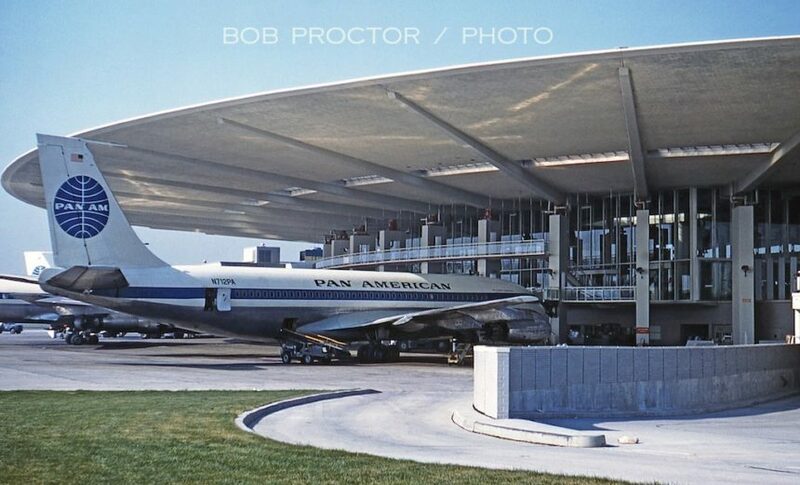 Pan Am’s terminal is seen during the light afternoon flight schedule. Sixth off the Boeing assembly line, straight-pipe 707-121 N712PA, Jet Clipper Washington, sits next to a DC-8-33 and another Boeing. It was later fitted with a ventral fin and heightened tail plus turbofan engines. At the adjacent International Arrivals Building (IAB), DC-7C PH-DSC Yellow Sea departs, possibly on a charter flight or a scheduled service to the Dutch Antilles as KLM was flying DC-8s between IDL and Holland by this time. Air France 707-328 F-BHSD, Chateau de Chenonceaux, in service just seven months, is fueled for its return trans-Atlantic flight. 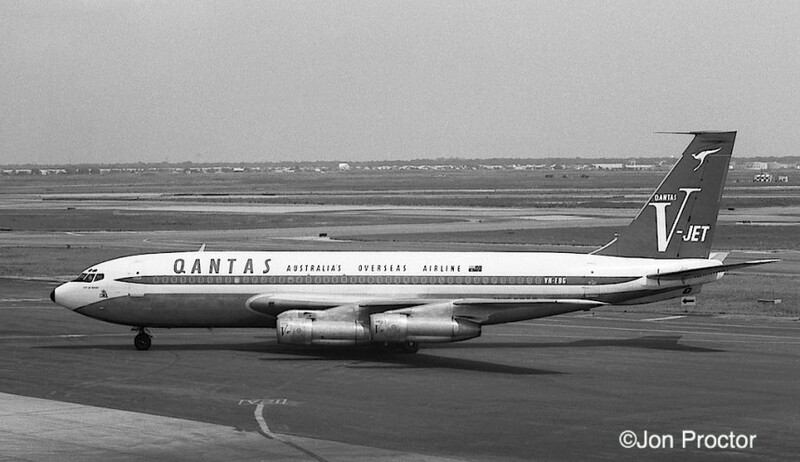 With a fuselage slightly shorter than the Boeing 720, the 707-138 was built exclusively for QANTAS. EH-EBG, City of Hobart, transits IDL on an around-the-world schedule. Behind it, a BOAC DC-7C appears ready to accept passengers. 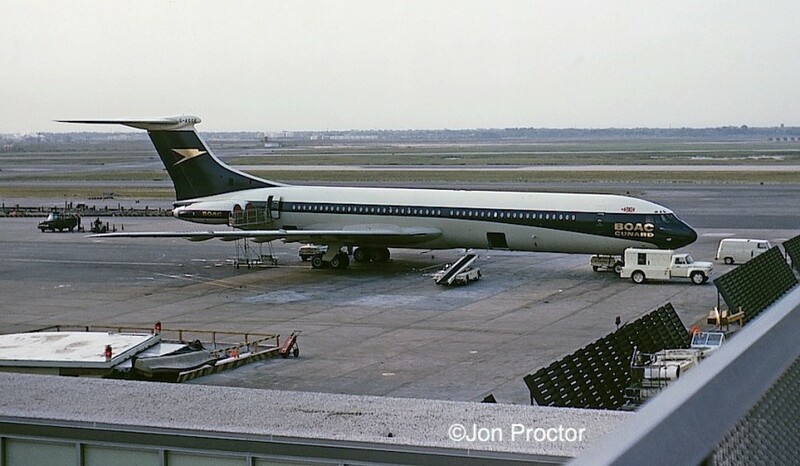 BOAC’s classic livery appears on Rolls-Royce 707-436 G-APFD, being refueled the old-fashion way, before underground hookups at the IAB. 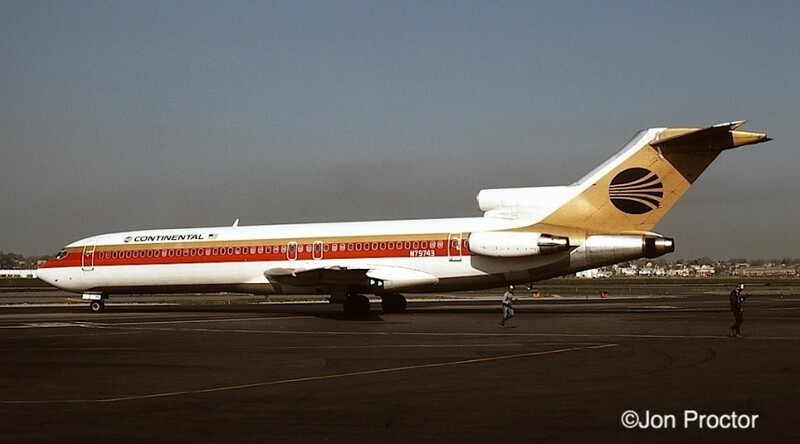 This airplane went on to fly for Air Mauritius and was finally broken up at Fort Lauderdale in 1986. I flew to Chicago via New York again on Christmas night but this time it was on purpose, to log another nonstop and hopefully get some pictures at Idlewild. 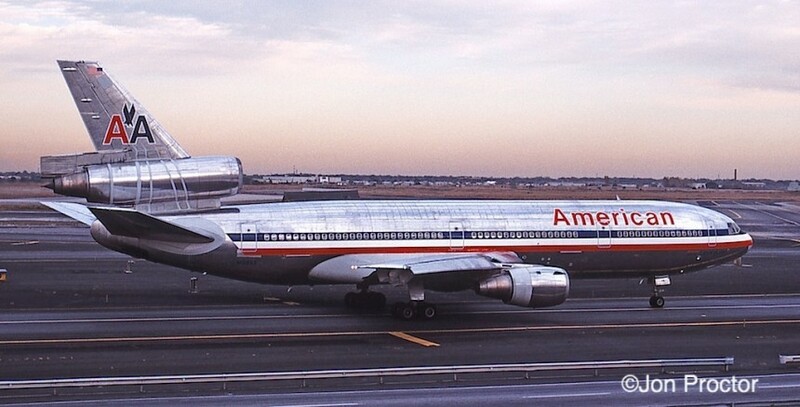 American Flight 10 arrived just before daylight on December 26. 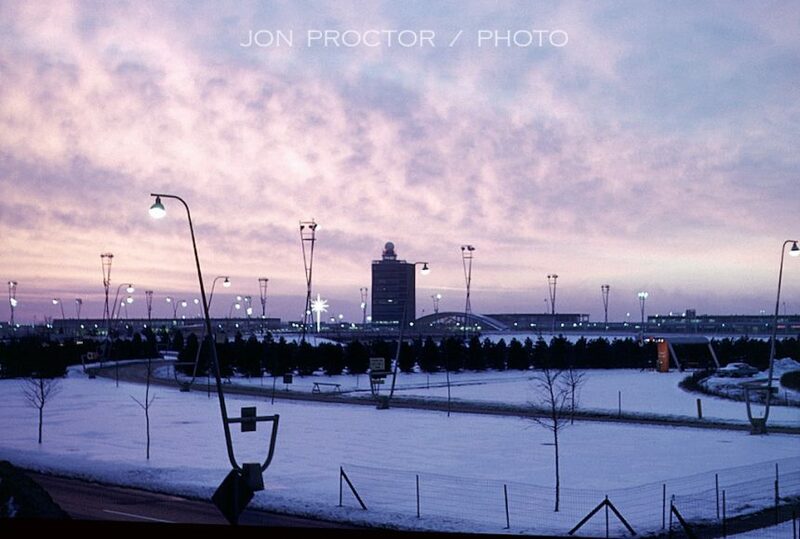 I shot this picture from AA’s terminal at 6:45 a.m., looking towards the IAB and tower, just as the dawn was breaking. As you can probably tell, it was cold! Wandering over to the International Arrivals Building, I took this image in the lobby, where friends and relatives greeted passengers. Each airline had a small counter to assist arriving customers, mostly with connecting flight information. A close look reveals carriers no longer in business, including Northeast, National and Pan Am. 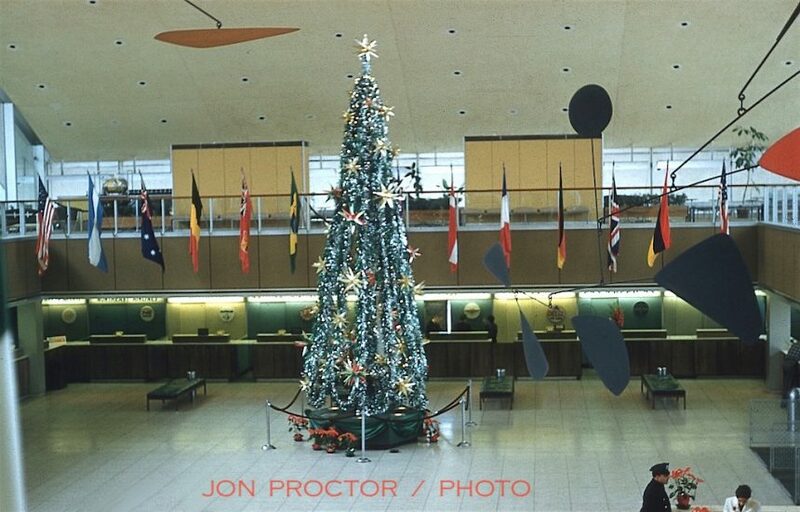 The iconic Calder mobile that normally hangs in the center has been moved around a bit to accommodate the Christmas tree. This picture is out of chronological order, taken January 4, 1963, but shows part of the IAB lobby from the opposite side of the balcony. The airport control tower and offices can be seen out the window to the left. Trembling in the sub-freezing weather, I did manage to get this shot from the Eastern Air Lines observation deck, of DC-6B N3025C, with a DC-8 and 720 in the background. Based on the lack of ramp activity during the early hour, these airplanes were awaiting later departures, not uncommon during the quiet morning after Christmas. I continued to carry both a 35mm camera for color slides and an old Kodak Tourist model for black & white images. Back in color and a bit further down the obs deck, I caught this Eastern 720-025, being serviced for its first assignment of the day. A pilot approaches the forward boarding door while catering is loaded in the front galley. 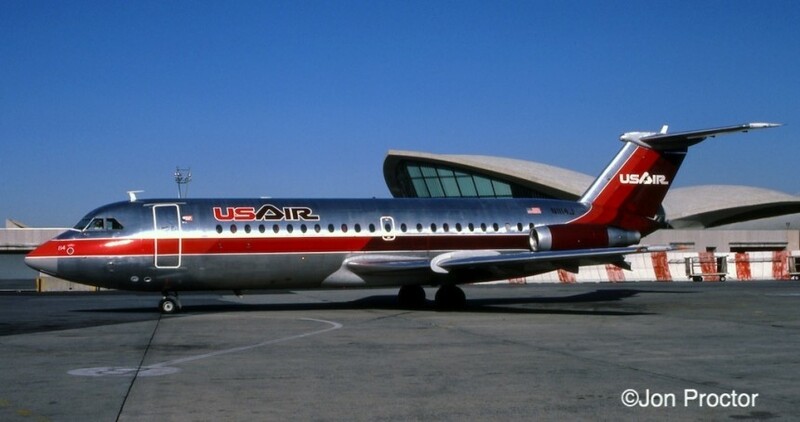 Northeast Airlines acquired six Convair 880s built for TWA when Howard Hughes became entangled in a financing dispute with General Dynamics. 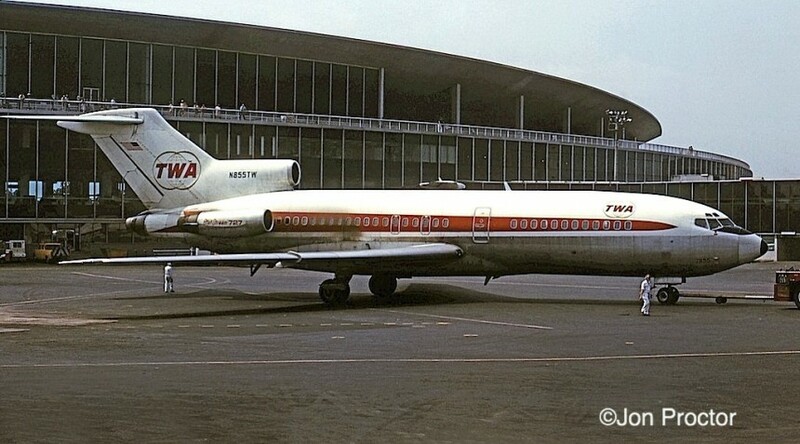 Delivered to NE in January 1961, N8478H finally joined TWA in September 1963 and was re-registered N804TW. 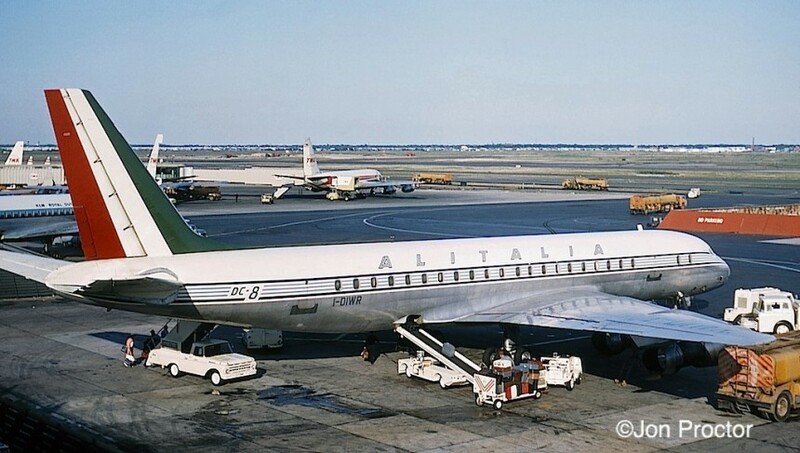 On the morning of July 27, 1961, I arrived at IDL, again nonstop from LAX, en route to visit my Uncle Bill and Aunt Fran in Syracuse, New York (Summer 1962 trip here). It was a beautiful summer morning, perfect for a quick visit to the IAB observation deck. Avianca 720-059B HK-724 has likewise arrived on an overnight trip and awaits servicing before its return flight to Bogota. 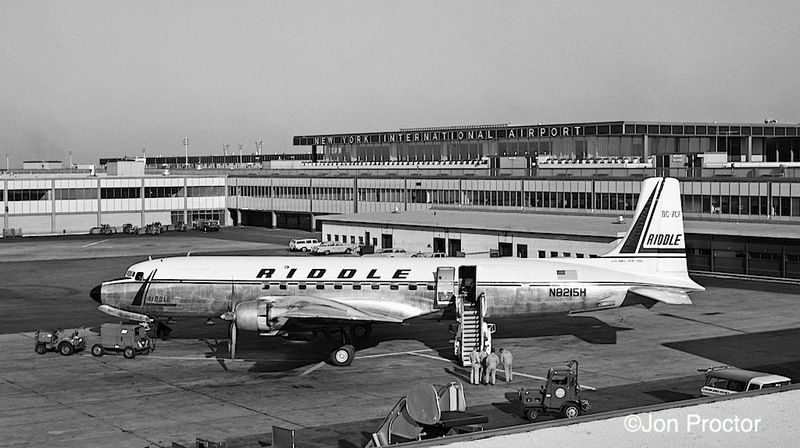 A freight and charter operator, Riddle’s fleet included DC-7CF N8215H, which had been purchased from SAS (as LN-MOF) two years earlier. The company name was changed to Airlift International in 1965. Sister ship to G-APFD seen earlier, 707-436 G-APFE appears in this striking pose adjacent to one of the few Jetway gates at the IAB. Its livery differs only with the addition of small BOAC titles on the engine mounts. “Foxtrot-Echo” broke up in clear-air turbulence near Mount Fuji, Japan on March 5, 1966. 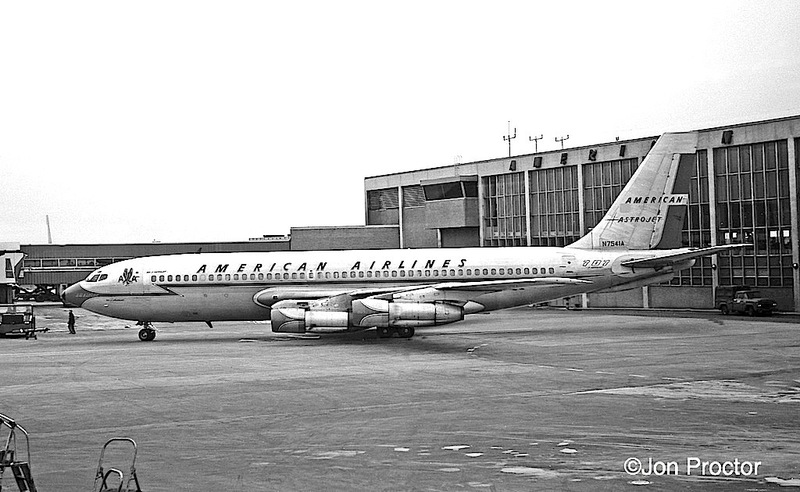 After my brief photo shoot at Idlewild, I headed over to La Guardia to board American’s Flagship Memphis, DC-6 N90726, for the short ride up to Syracuse. Climbing out from La Guardia, I caught a glimpse of Manhattan in the distance. Just to the right of the Empire State Building look closely and you can see the new Pan Am Building under construction. 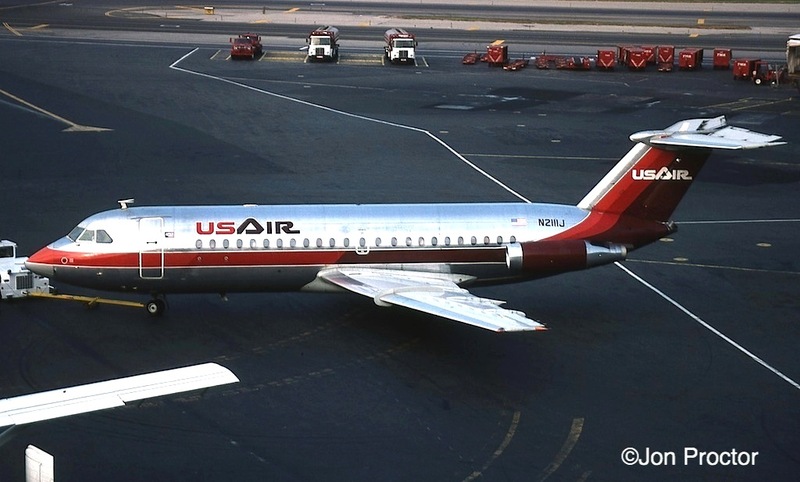 A day later I came back through New York in order to get a Convair 990 ride. The inboard engine nacelle on American Astrojet N5608 is visible during a downwind departure from Runway 31-Left at Idlewild, heading southeast before turning back onto a westerly course for Detroit. Compare this image with the one taken just a year earlier to notice the construction progress. Both the Braniff-Delta and TWA terminals are now complete. 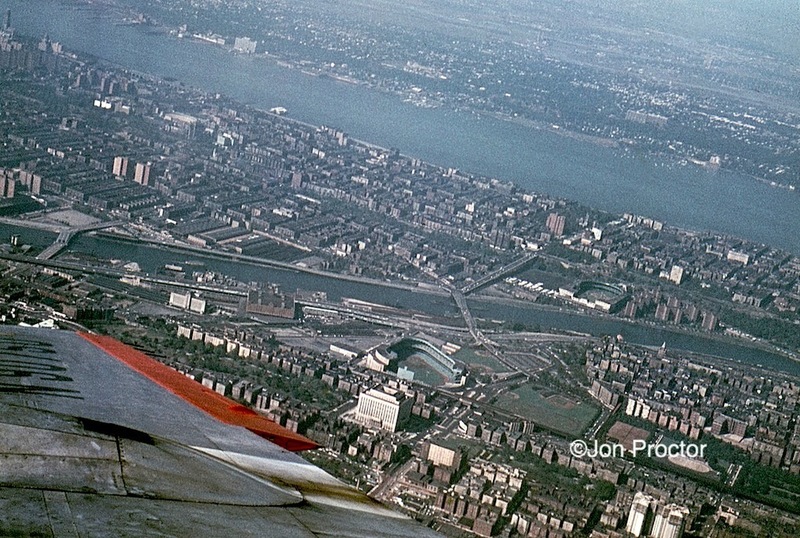 Here’s a September 29 shot by brother Bob, who was also coming from Syracuse and approaching La Guardia. Yankee Stadium is visible just off the wing of American DC-6 N90750. Across the Harlem River sits the Polo Grounds, where the Mets played through the 1963 baseball season. Except as noted, all the 1963 pictures I shot on the morning of January 4 at Idlewild, which was surprisingly devoid of snow on the ground. 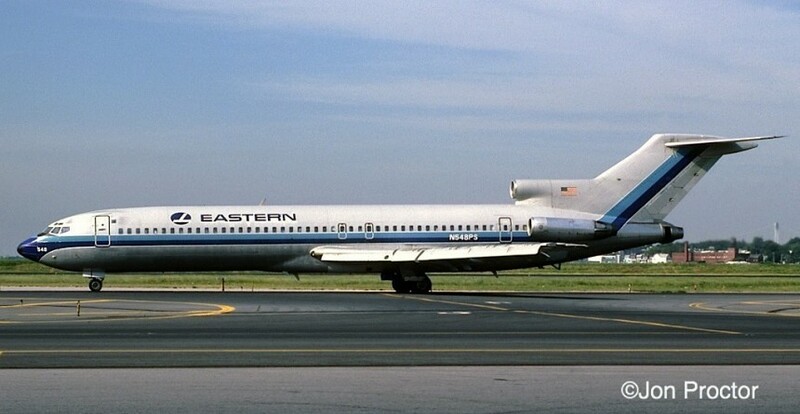 The first aircraft type to be delivered to Eastern in this, my favorite EAL livery, was the Boeing 720-025. N8707E receives attention in preparation for its first assignment of the day. I apparently ran out of color slide film after the earlier shot and switched to black & white. 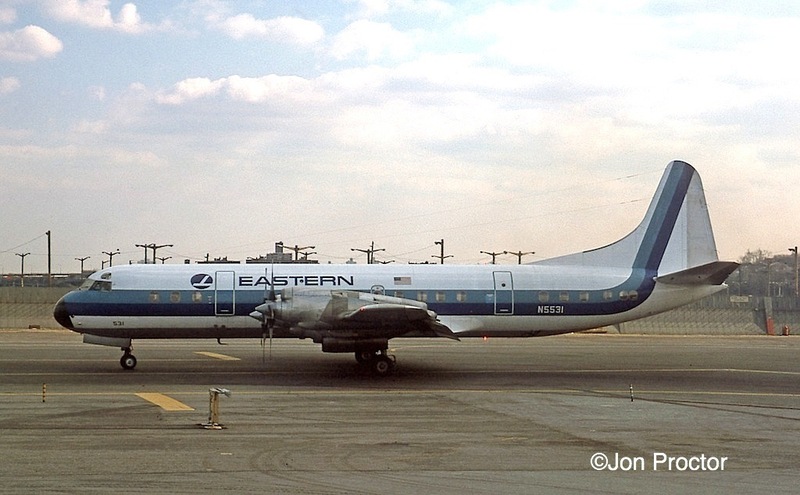 On the same observation deck I got a nice shot of Eastern 188 N5507 in its Super Electra livery, which was applied to the fleet as each came out of LEAP modifications at Burbank to correct whirl mode issues associated with two accidents. 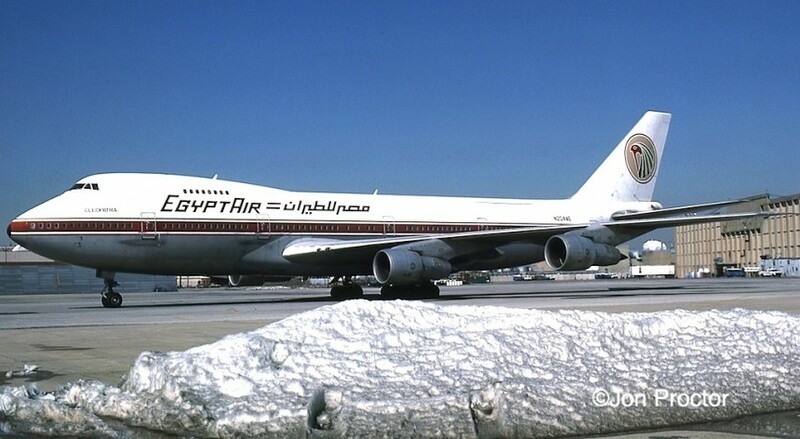 After just 12 years with its first owner, N5507 was withdrawn and later became a freighter for Zantop International. While walking from Eastern over to the TWA Flight Center, I caught the graceful lines of Super-G Connie N7104C by walking around to the side of the terminal. 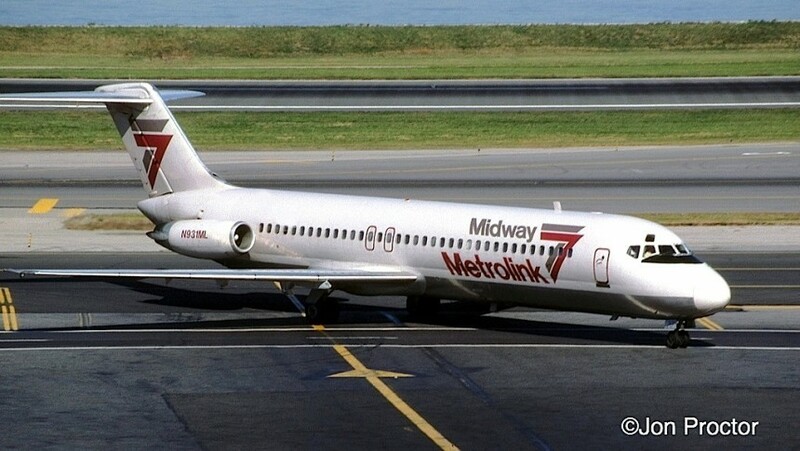 Oh, for the days when you didn’t get in trouble for sneaking out onto the ramp! Shooting through the waiting area glass in the main terminal, I caught TWA 707-331 N771TW. 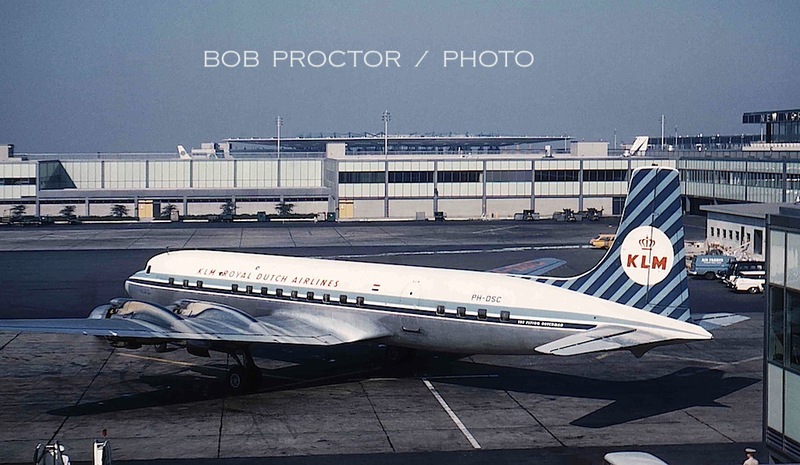 Seen at the same gate, Convair 880 N808TW shows its graceful lines. But with this picture comes somewhat of a mystery. My negative envelope says it was taken on January 4, 1963, but look at the LD-3 baggage container in the foreground, designed for the Boeing 747 that didn’t come along for another 7 years! Also, a National Airlines jet, barely seen under the horizontal stabilizer, is wearing a color scheme that didn’t appear until several years later. Compare this picture with the 707 above and they appear to be taken the same day. 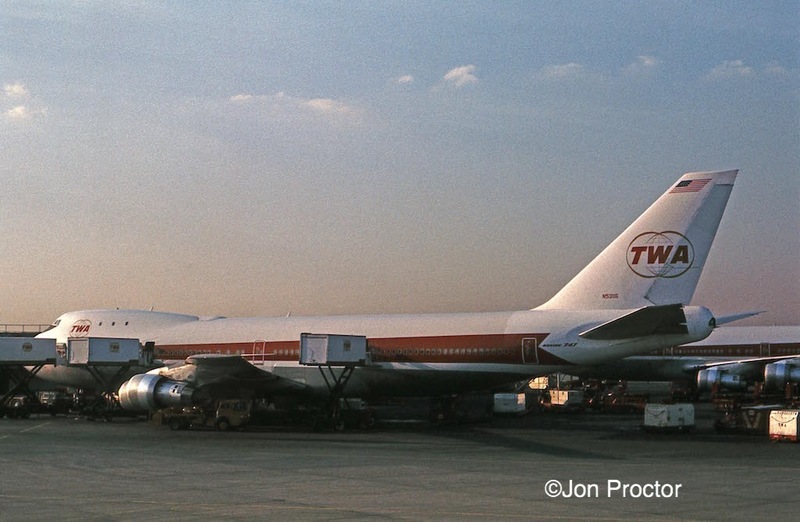 However, the tail behind N771TW partially reveals the TWA logo without surrounding globes; all were repainted by 1964. At American’s terminal, 720-023B Astrojet N7541A has been pushed back for departure. 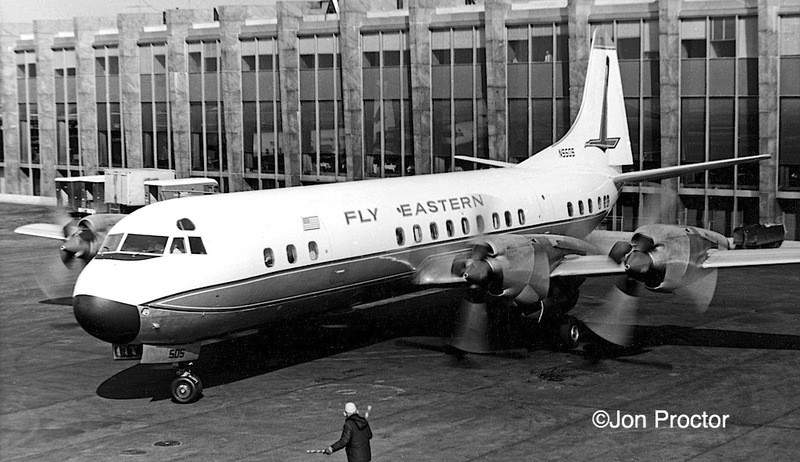 It went on to fly for MEA-Middle East Air Airlines, then became an engine testbed for Pratt & Whitney Canada. Outliving most 720s it was not retired until 1995. 707-123B N7508A is about to depart from an adjacent gate. 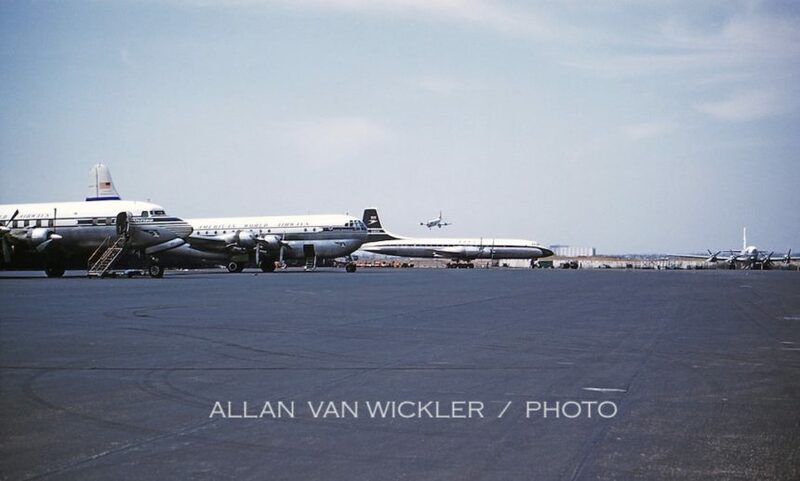 The tail of a Convair 240 is visible on the left, still in service well into the 1960s for short runs. 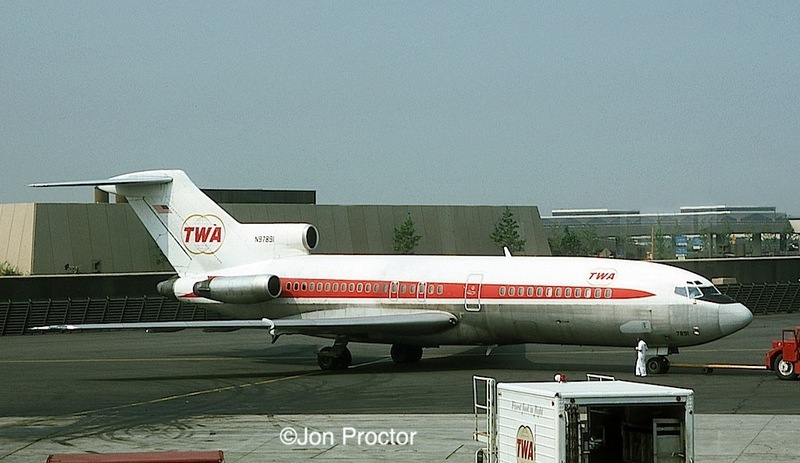 Having joined TWA in April 1964, I didn’t have pass privileges for a year, hence no visits to New York. I made my first trip back in May 1965 and ran into cloudy weather, but snapped this one photo, of BOAC-Cunard Super VC10 G-ASGE. Called “the great iron duck” by crewmembers, the Vickers-built aircraft came after the 707 and saw limited success, but was well-liked by passengers for its low cabin interior noise level and smooth landings. BOAC-Cunard was a subsidiary formed in 1962 with 30% ownership by Cunard Steamship company. BOAC bought out Cunard’s interest in 1966 and its name was removed from aircraft markings. In June I returned to visit the New York World’s Fair, with adequate time set aside for picture taking from the IAB observation deck. Here’s another BOAC-Cunard example, this time 707-436 G-APFO, being towed to the gate in heavy afternoon traffic. 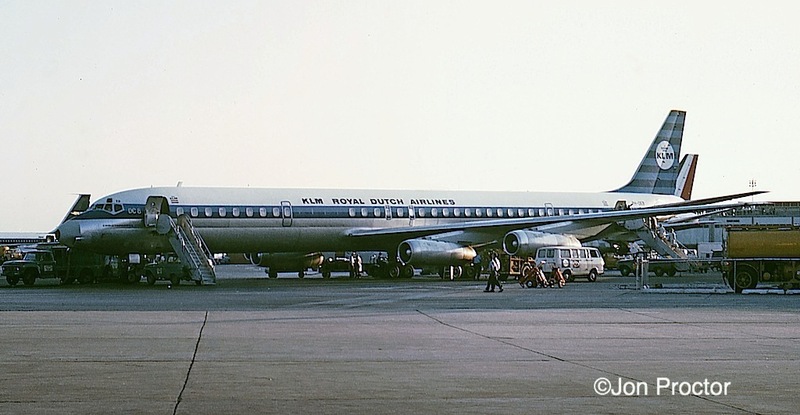 Close behind the Boeing, KLM DC-8-55F PH-DCT, Pierre de Coubertin, arrives after a trans-Atlantic flight from Holland. 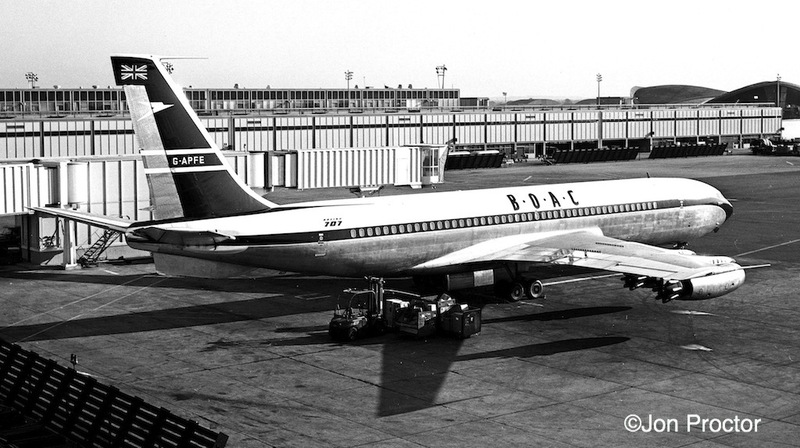 British West Indies Airways – BWIA – operated 727s between New York and the Caribbean. 9Y-TCP needs a tail wash. Passengers walk past TWA 707-331 N770TW as they deplane from an adjacent aircraft. 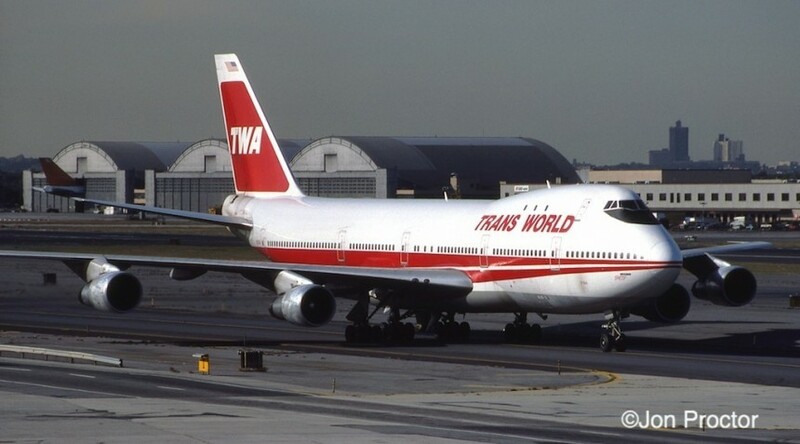 Once the Commissary truck is unloaded, this Boeing will be towed to TWA’s domestic terminal next door for another departure, probably back to Europe. 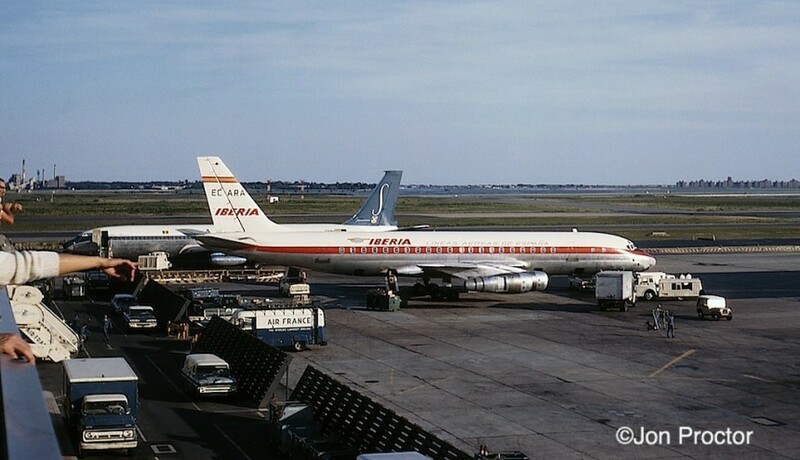 Air-India’s Rolls-Royce powered 707-437 VT-DJI, named Nandi Devi, is serviced for a return trans-Atlantic flight. The Boeing was destroyed on takeoff at Bombay January 23, 1971 during a training exercise; there were no fatalities. 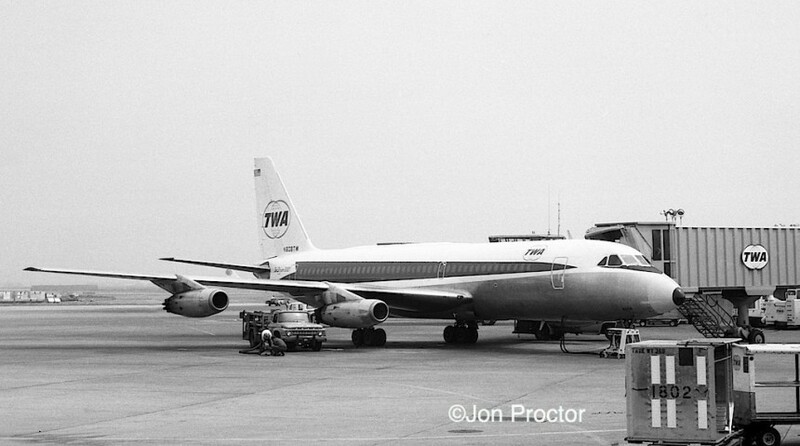 Registered N810PA, Pan Am DC-8-33 Jet Clipper Intrepid is slightly blurred in this picture, again too good to pass up. 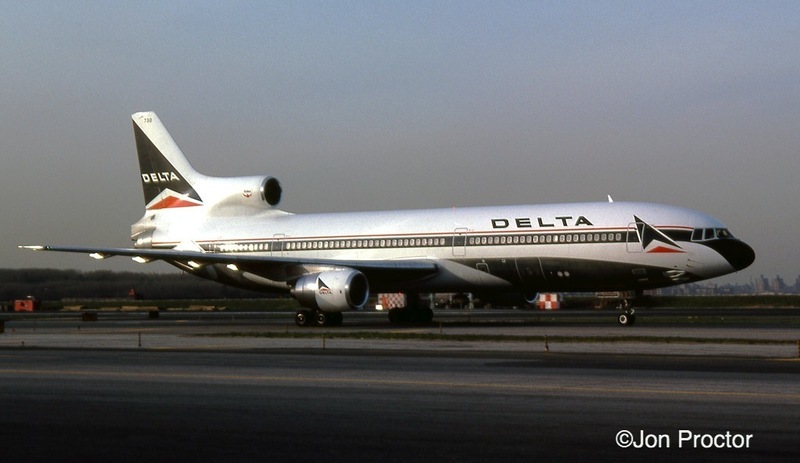 Juan Trippe shocked the industry in 1955 when he split a 45-plane order between the 707 (20) and DC-8 (25), effectively becoming the launch customer for both types, although Delta was first to operate the Douglas jet. 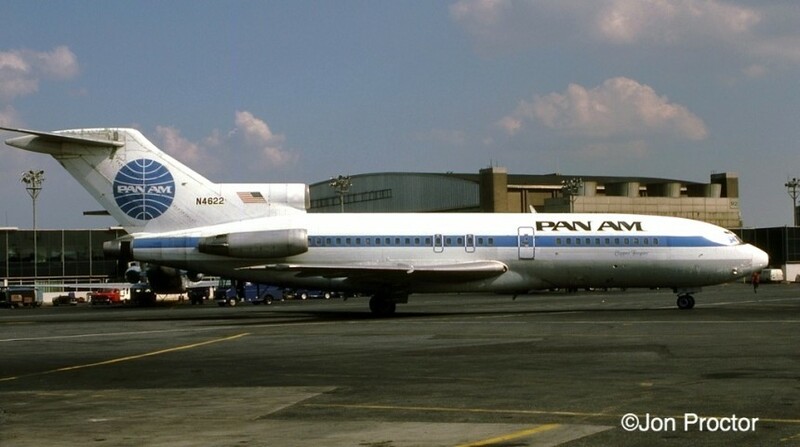 Only 18 DC-8s were actually delivered to Pan Am, then sold off relatively early as the 707 fleet built to more than 100 airplanes. Check out the crowded observation deck! 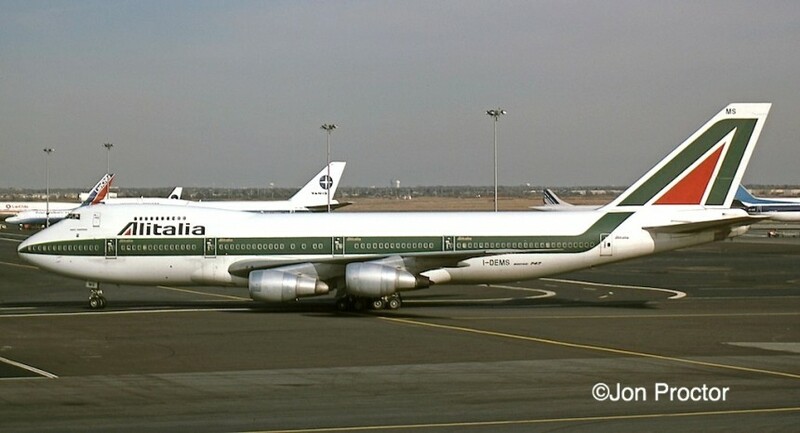 Alitalia DC-8-43 I-DIWI Giovanni de Varazzano appears wedged in between aircraft and Jetways as it rests between ocean crossings. Alitalia sister-ship I-DIWR accepts passengers. With two aircraft departing, perhaps one was bound to Rome and the other Milan? This DC-8-43 was named Nicoloso da Recco and soldiered on until 2001, ending its flying days with Miami-based Fine Air. With a Sabena 707 behind it, EC-ARA bore the name Valalquez and was the Spanish flag carrier Iberia’s first DC-8-52. Aircraft spotters appreciated the large registrations on the tail! The aircraft later flew for Aviaco and was lost on a ferry flight en route to the Canary Islands on July 6, 1972. 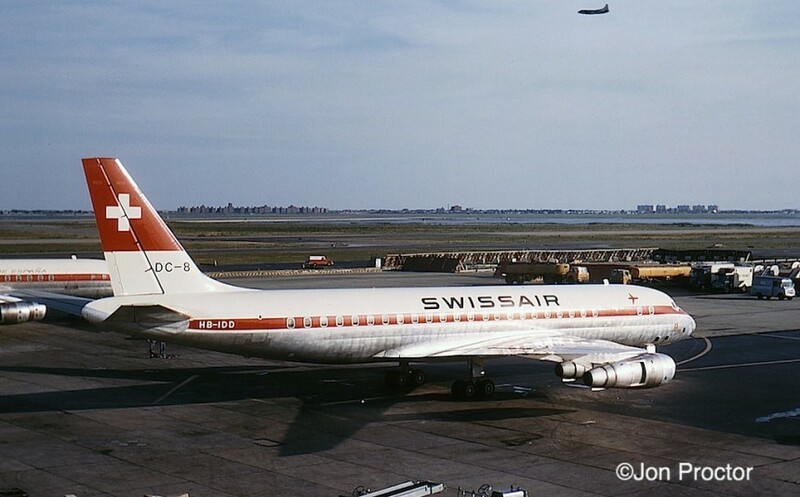 Immaculate Swissair DC-8-53 HB-IDD, Nidwalden, pulls out of the adjacent gate. 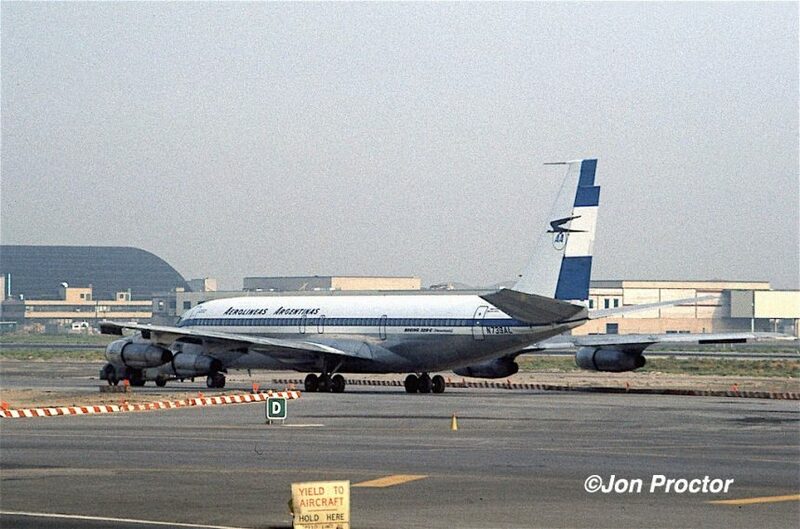 It was one of three jetliners hijacked to Dawson’s Field, a remote airstrip in Jordan, and blown up by Palestinian terrorists on September 12, 1970. Above it, what appears to be a Mohawk Martin 404 departs. I made a quick, one-day trip back to New York at the end of the year, probably to use up a pass. The weather was not conducive to photography on December 17 but I got off one shot from the IAB featuring Varig 707-441 PP-VJA, being readied for its morning departure to Rio. One of those TWA 707s in the background took me back to LAX and more hospitable weather. 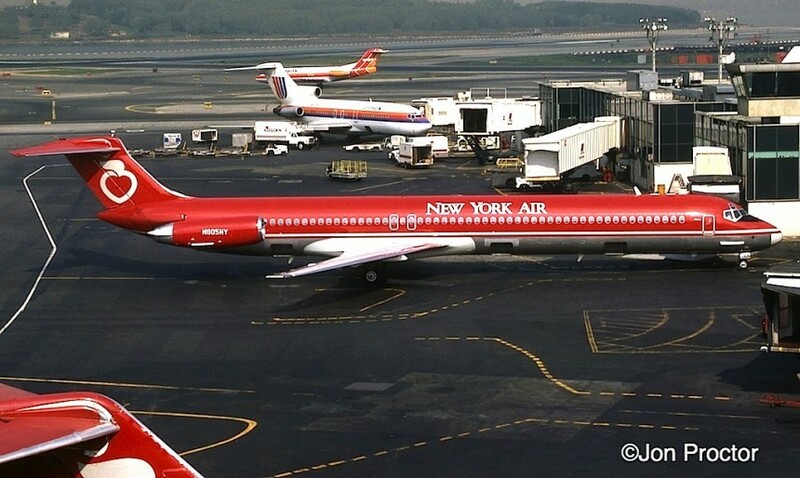 Here’s a wonderful picture from the collection of one of my best friends, the late Terry Waddington, showing DC-9-14 N1051T at La Guardia, in early December. 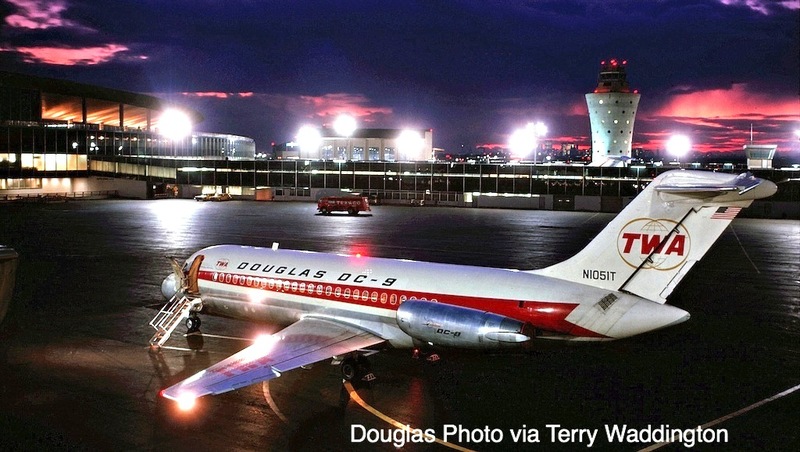 The airplane, still Douglas-owned, stopped at LGA during a nationwide sales tour. TWA began DC-9 service on March 17, 1966. I spent a good portion of 1966 at the Kennedy Space Center, so NYC photography was scarce this year. 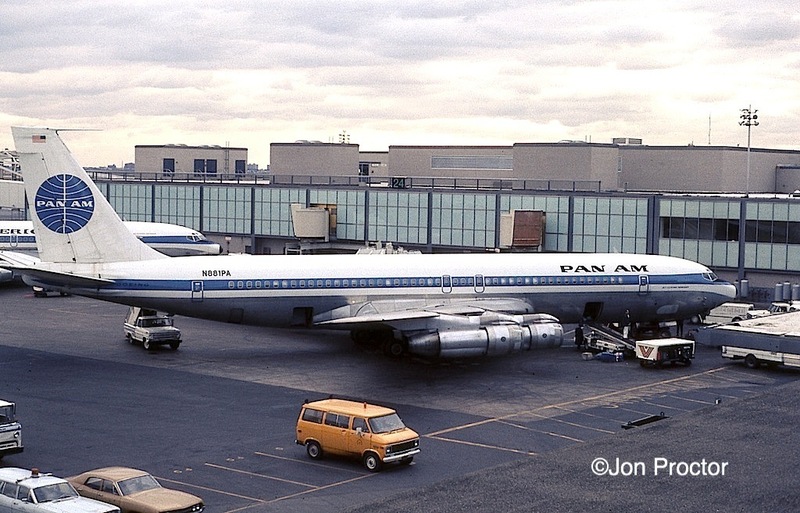 But here’s a truly historic airplane I caught on April 23, Pan Am’s ceremonial first Boeing jet, 707-121 N707PA, although it was actually second off the assembly line. Originally Jet Clipper Maria, it no doubt wore several other names and was converted to turbofan power as shown, in 1964. Sold off 10 years later, the airplane flew for Turkish carrier THY, among others, and was finally stored at Miami. After a failed attempt to find a museum for its preservation, the Boeing was sadly broken up in 1988. In addition to the LGA shot at the top of this page, my old friend Peter gave me a bunch of 35mm black & white negatives. He lived a few miles from JFK and shot these images at various times during the 1960s, but no dates were provided on the neg envelopes. Here are a dozen from that batch. Pan Am acquired two 707-139s originally built for Cubana, including N778PA. They were first leased to Western Airlines. 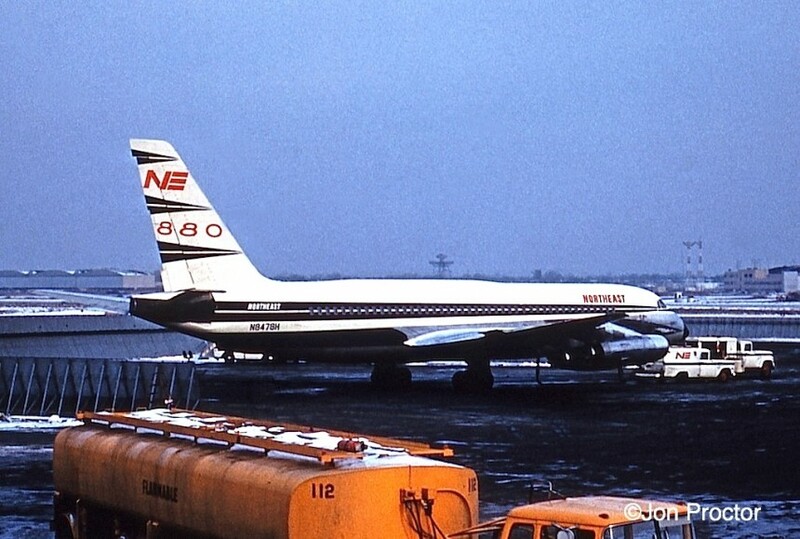 The second aircraft, N779PA, overran the runway JFK on April 7, 1964; click here and scroll down for a picture of it in WAL colors. 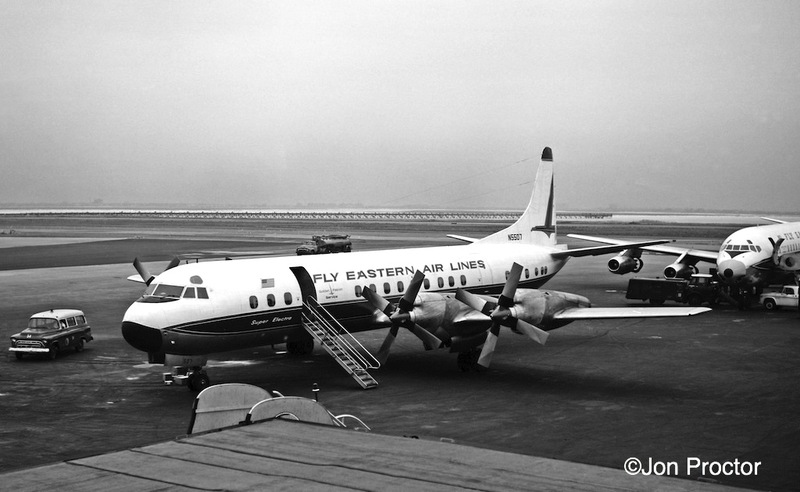 Meanwhile, Jet Clipper Skylark, earlier N74613 and seen here, was converted to turbofan power in 1964. It went on to fly for many operators before finally being parted out at Davis-Monthan AFB in Arizona in 1986, with some of it components used for upgrade of KC-135 military tankers. 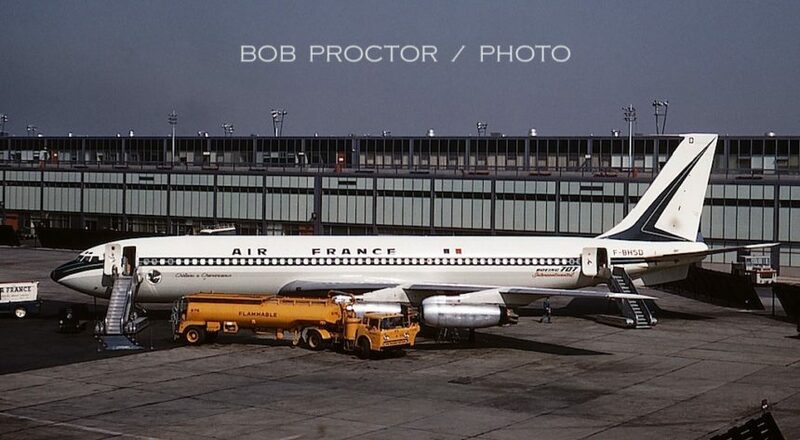 707-321 N727PA, Jet Clipper Mohawk, was 98th off the Boeing assembly line. It is seen taxiing under power into an IAB gate. 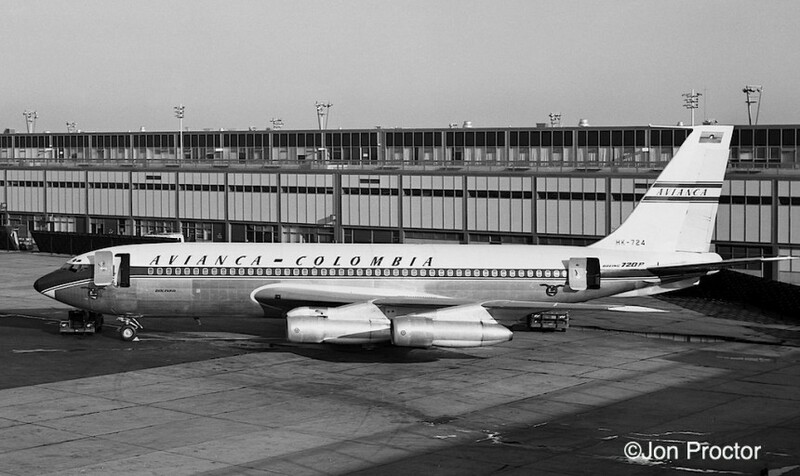 After serving a wide variety of airlines, it was destroyed by fire on landing at Bogata in 1980 while with Aerotal Colombia. Pan Am’s early 707s were replaced by new-build intercontinental 707 turbofan-powered Boeings, including 707-321B N419PA, Jet Clipper Gem of the Skies, seen being pushing back at the IAB, on its way to another departure from the nearby Pan Am terminal. 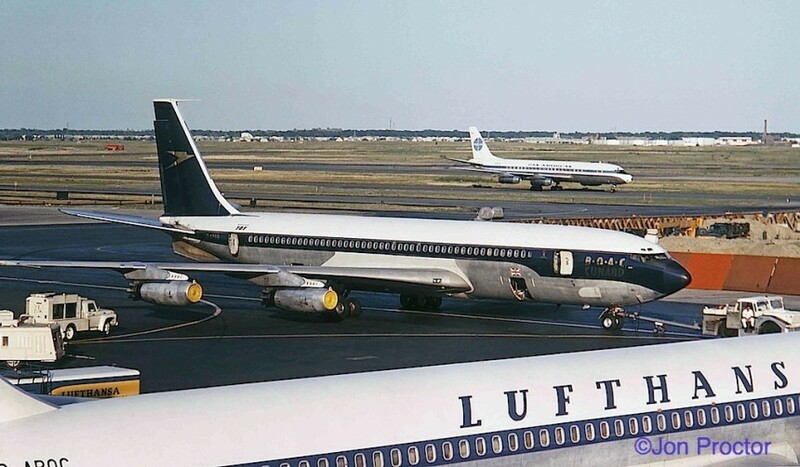 Rolls-Royce-powered Lufthansa 707-430 D-ABOG is seen in tow, wearing its delivery colors. Named Bonn, It served the German flag carrier for 15 years. 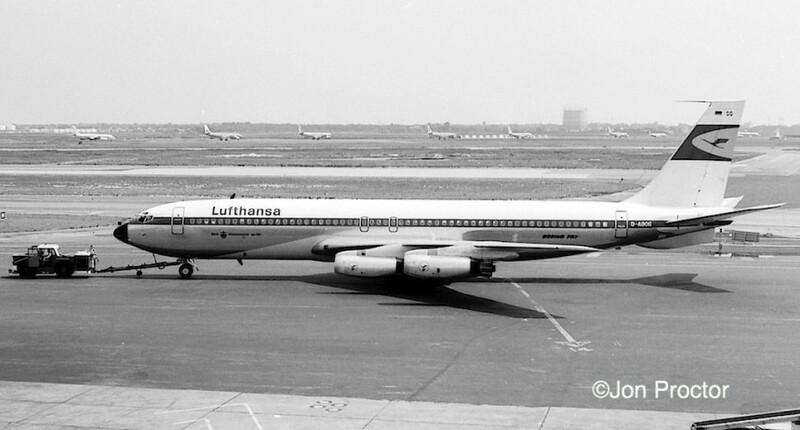 In the same early livery, turbofan-powered 707-330B G-ABUG, Essen, joined Lufthansa in 1966 and was leased out to German charter airline Condor in 1970 before being sold to Air Zimbabwe. It was retired in 1988. The same QANTAS 707-138 seen in 1961 appears again, this time after conversion to JT3D turbofan engines, making it a 707-138B. That “V-JET” reference on the tail came from the Latin “vannus,” meaning fan. Eastern Air Lines operated 50 DC-7Bs, with some of the variants serving well into the mid-1960s. Based on the small fleet number on the nose gear door, this appears to be N837D. It wears Eastern’s “hockey stick” livery as the passenger steps are manually pushed up to the airplane. Pulling away from the terminal Eastern 188 Electra N5505 wears a modified “Super Electra” livery. It’s too bad this isn’t a color picture, as the cheatline hue is a bit light to be blue. 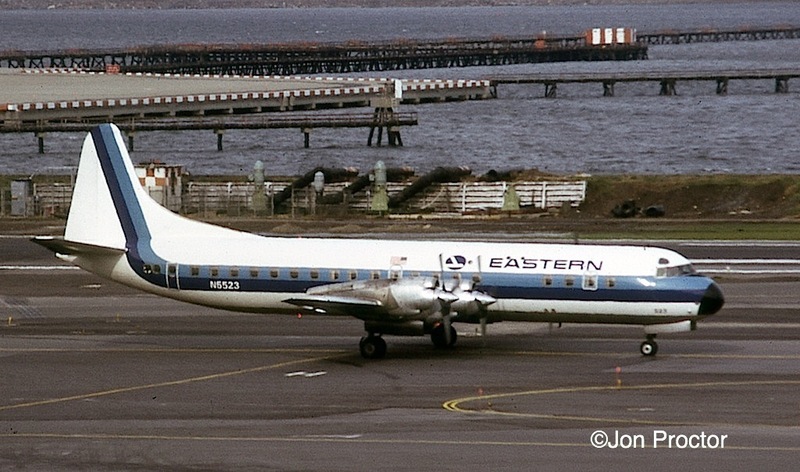 Airline folklore holds that at least one EA Electra wore red trim to match the 1049 Constellations used in Eastern Air-Bus and Air-Shuttle service. I’ve never seen a picture of it in color, but this airplane could be the one. 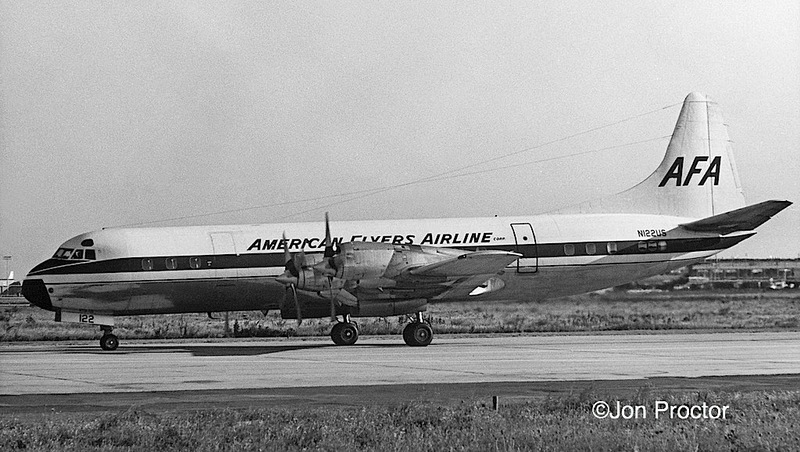 Charter operator American Flyers Airline-AFA acquired 188C Electra N122US second-hand from Northwest in June 1966. Four years later it went to went to Holiday Airlines. American first adopted this “circle logo” livery in 1964 It marked an end to its practice of assigning Flagship names, which began disappearing with conversion of its 707 fleet to turbofan “Astrojets.” 188 Electra N6118A, originally Flagship Hartford, turns into its assigned gate next to a company Convair 990A. After several owners, the turboprop was converted to a freighter and finally joined the Argentine Navy in 1983. 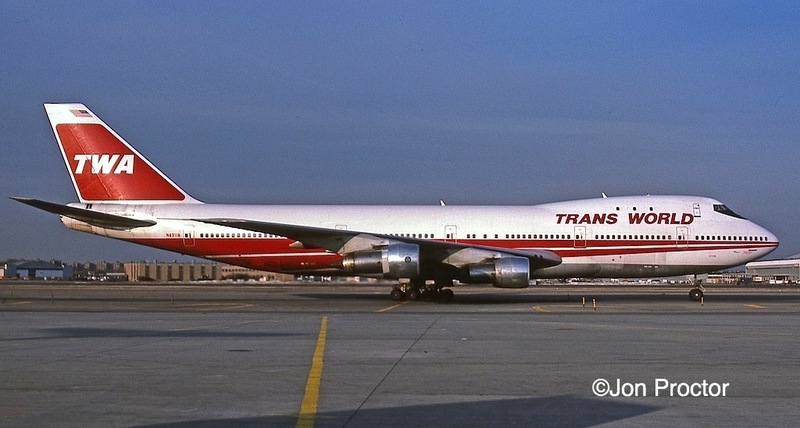 Trans International became the first US charter airline to operate pure jets when it acquired the prototype DC-8 in June 1962; by then it had been converted to turbofan DC-8-51 standards. The pictured new-build DC-8-55F “Jet Trader,” N3325T, was delivered May 18, 1965. 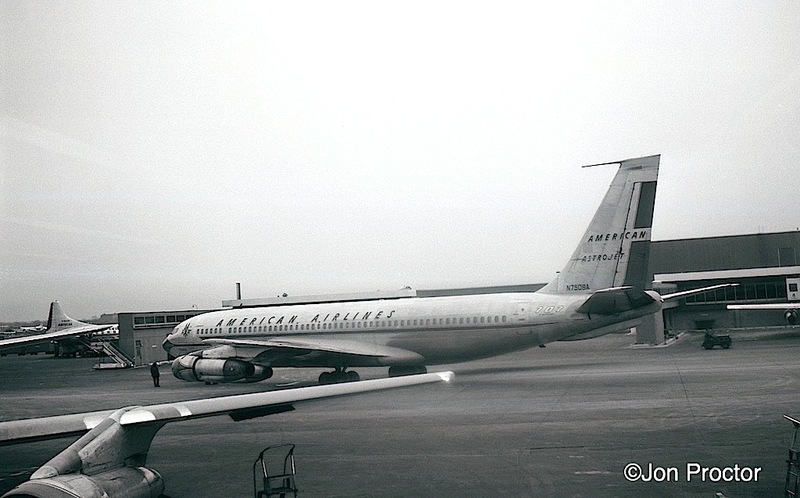 Stretched DC-8s later became the preferred type with TIA, renamed Transamerica in 1968. 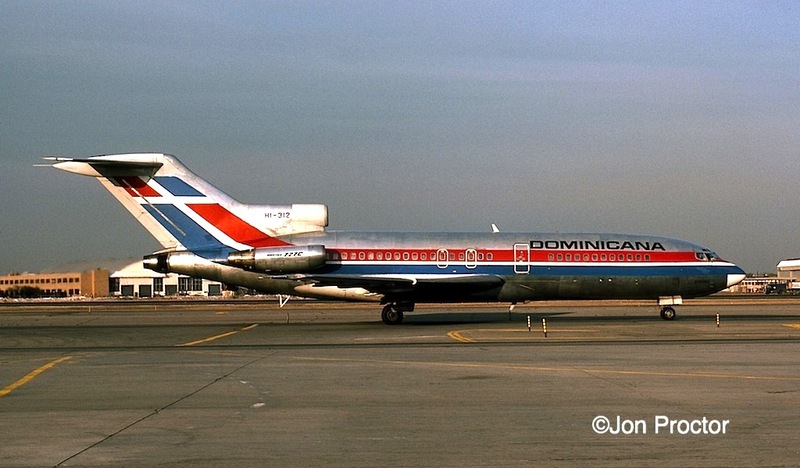 Founded in 1945, Trans Caribbean flew nine DC-8s between New York and the Caribbean during the 1960s, including -54F N8785R, which was operated in passenger service. The airline was acquired by American Airlines on March 3, 1971 and the Eights were sold off shortly thereafter. Braniff International’s colorful DC-8-62s, part of the airline’s “End of the plain plane” advertising program, were particularly well-suited for South American routes. N1805 was delivered in September 1967. Following the airline’s 1982 demise, it flew with Rich International and was broken up in 1997. 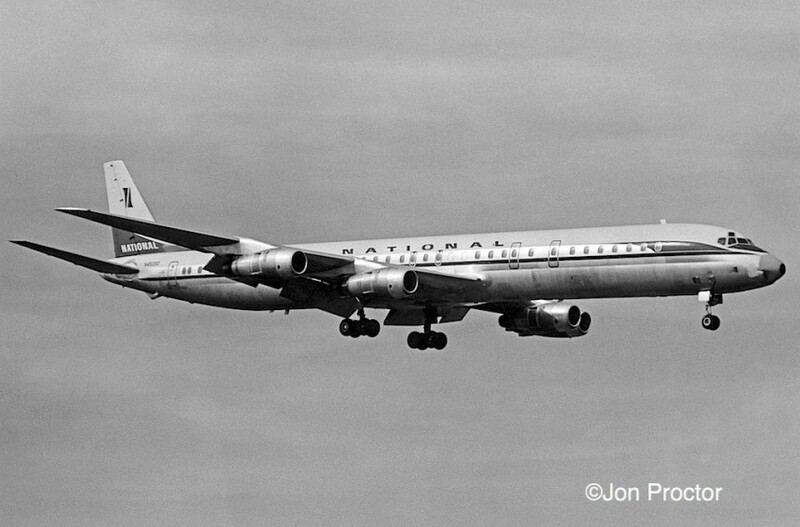 This picture must have been taken in Fall 1967, shortly after National took delivery of N45090, its first of two DC-8-61s, just as the airline was about to adopt its “Sun King” livery. The second airplane, N45091, arrived unpainted and became the first to wear the new livery. Still in the older colors, N45090 was resprayed soon thereafter; go to http://jonproctor.net/lax-through-the-years/ to see how it looked after repaint. KLM DC-8-63 PH-DEB is serviced at the IAB gate nearest the TWA Flight Center, where I was departing from on my way back to LAX on August 12, 1968. I must have slipped out onto the ramp for this shot, perhaps down the Jetway steps. 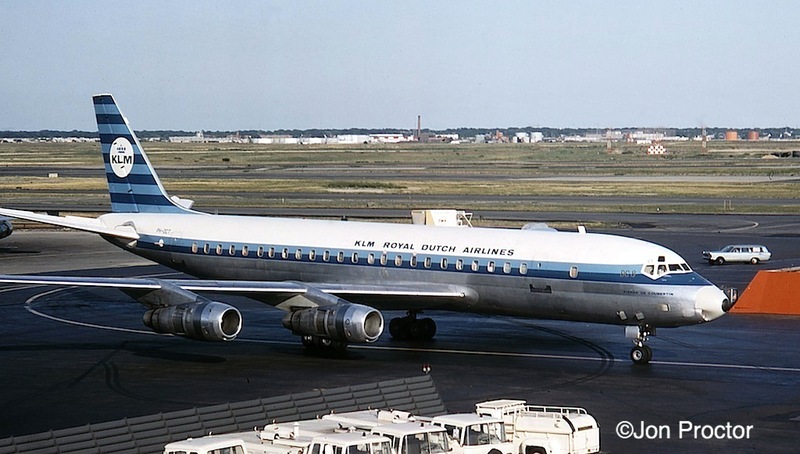 Named Christophorus Columbus, the big Stretch Eight was a year old by then and flew a relatively short career with KLM, leaving the fleet at the end of 1984. 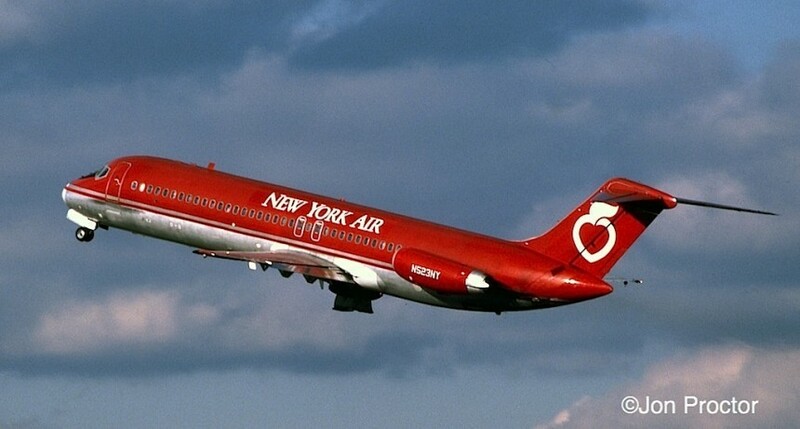 Its last owner was Airborne Express as N827AX, which operated it as a pure freighter. It was lost in an accident near Narrows, Virginia in December 1996 during a test flight following maintenance. “Ladies and Gentlemen, we’re number 28 for takeoff.” In the late ’60s, long lineups of airliners waiting to depart were fairly common, especially at JFK in the evening hours as heavy overseas traffic piled up. I took this picture August 12, from TWA Flight 1, headed for LAX. My logbook says we took a 1-hour, 15-minute delay yet were only 15 minutes late arriving on the West Coast, probably due to a lack of headwinds and the captain’s heavy hand on the throttle. Fuel was much cheaper back then! Fast-forward a few years. When this picture was taken in May, I was still on my sabbatical to Pan Am but not for long. 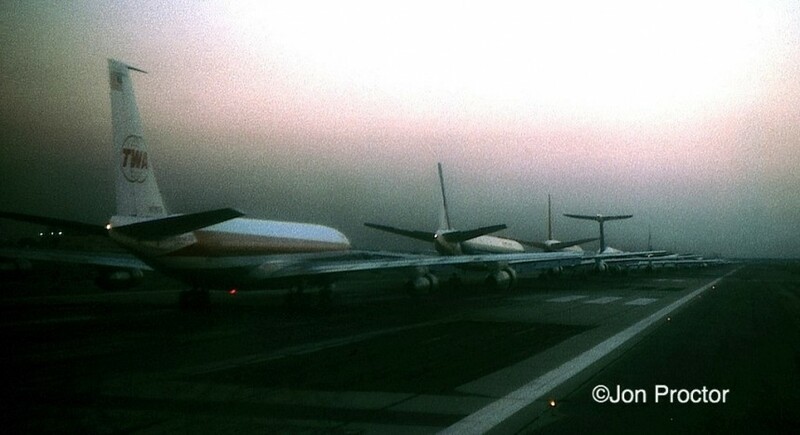 During the evening rush at JFK, 747-131 N53116 gets the full turnaround treatment with three catering trucks. This particular gate had Jetways that reached the starboard side of the airplane. 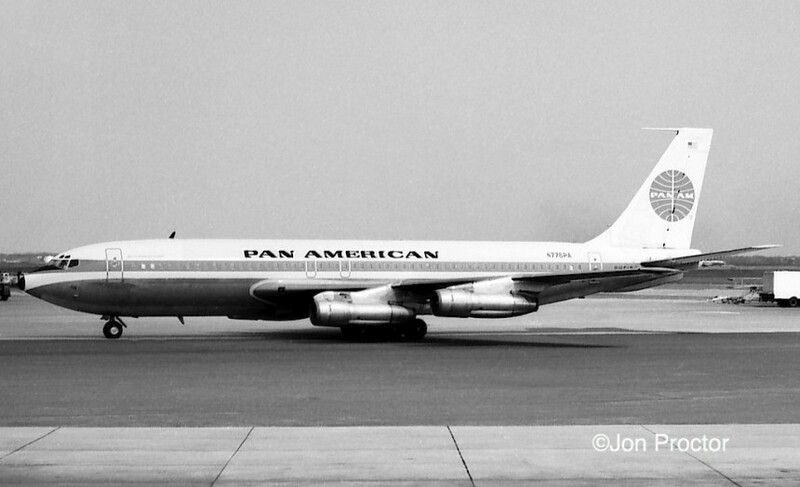 Speaking of Pan Am, here are two images shot on August 30. 747-121 N750PA, Clipper Rambler is under tow wearing its delivery colors and titles. That wing on the left belongs to a Finnair DC-8-62. From nearly the same spot, I caught 720-023B N781PA on arrival. It turns out I photographed Jet Clipper Flying Arrow at LAX seven years earlier. 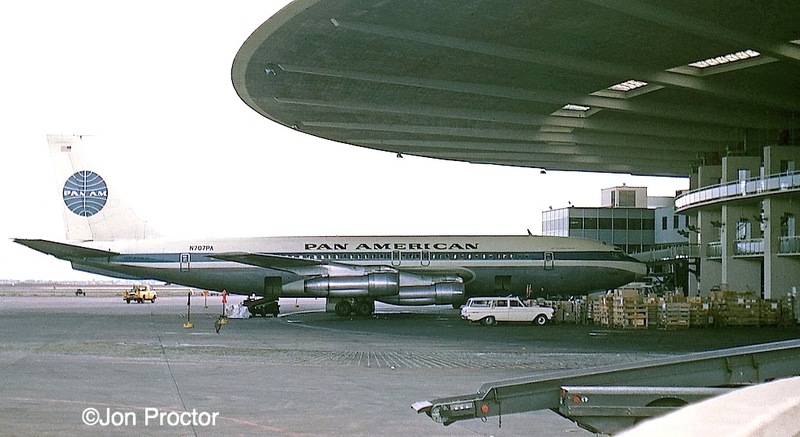 Originally N7550A with American Airlines, Pan Am sold it off to Ecuatoriana in 1975. 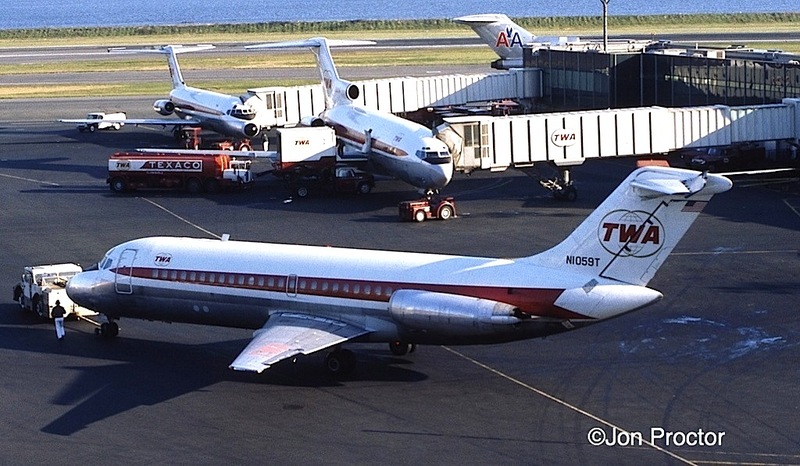 I was about to board a TWA 707 for LAX when National 727-35 N4615 posed for my camera, ready to depart from the airline’s adjacent “Sundrome” terminal. Later taken over by TWA, then JetBlue, the facility was torn down in 2012 to make way for JetBlue’s continued Terminal 5 expansion. One of National’s two 747s is visible in the background; both were later sold to Northwest Airlines. Aerolineas Argentinas leased 707-372C N739AL from Airlift International, seen under tow. In the late-afternoon November sun, 747-131 N93109 pulls into its assigned gate. 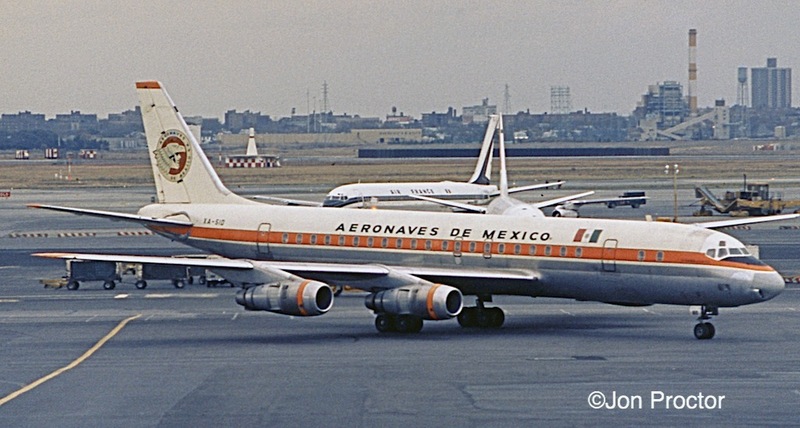 Taken with Ektachrome slide film, Aeronaves de Mexico DC-8-51 XA-SID isn’t razor sharp, and the gray November sky doesn’t help, but the airplane soldiered on for the next 30 years in passenger service, then as an air freighter. Its last operator was Miami-based Fine Air. 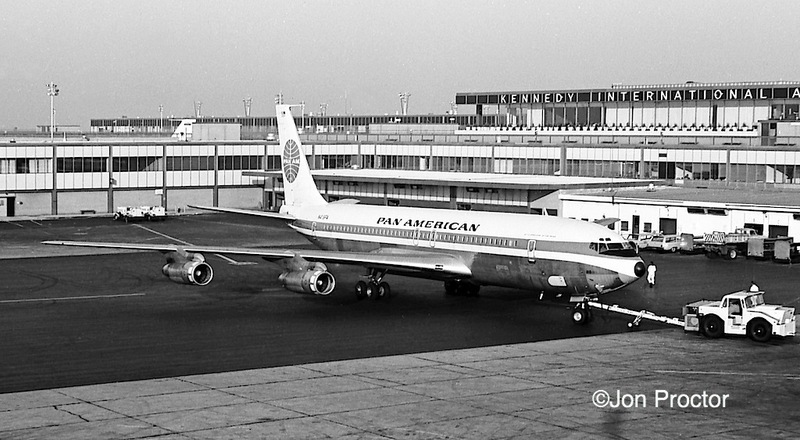 I caught Pan Am 707-321B N881PA at the IAB on November 22, nine years to the day after the assassination that would result in the airport’s name change to JFK. 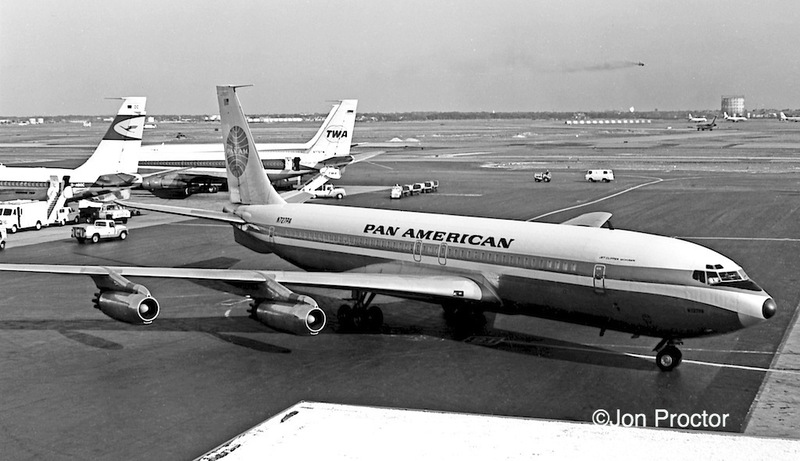 In the background, another 707 still wears full “Pan American” titles. Over at La Guardia on November 11, and taken from the camera-friendly observation deck, a view of TWA’s concourse includes a pair of 727s and departing DC-9-15 N1059T. 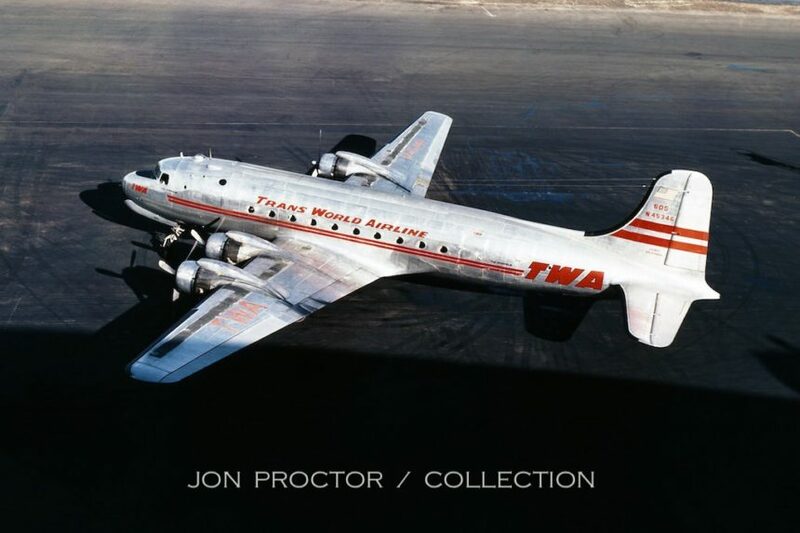 An early Douglas twin-jet customer, TWA flew the type on short-haul routes from Wichita to Boston and most stations in between. Northwest’s 727-251 N256US climbs smartly into the afternoon sun. Having transferred to Chicago in April 1972, I didn’t get a whole lot of shooting in back east, at least this year. But here are a couple of exceptions, taken at La Guardia that month. First, 727-31 N855TW is towed out and away from Gate 22. That brown smudge above the wing was caused by exhaust from the auxiliary power unit (APU). A later mod to the exhaust port finally eliminated the problem. From this angle it looks like I was shooting from the window of another airplane. United 727-22 N7065U looks to be sitting idle at the adjacent concourse on a non-Jetway gate. The tri-jet was leased to Alaska Airlines briefly sold to FedEx in 1989 and converted to a freighter. It was finally donated to Owens Community College in Toledo, Ohio for use as a trainer in the school’s Center for Emergency Preparedness. 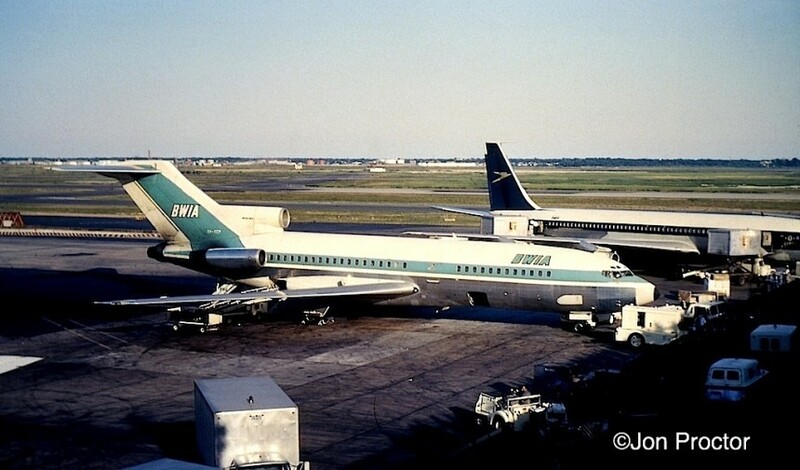 On the same concourse Braniff’s 727-191 N300BN, also sans Jetway, looks to be without activity. This airplane was first delivered to Frontier Airlines in 1967 and returned to Boeing two years later; Braniff then leased it until 1982, when it went to work for Burlington Northern as a freighter. It was last reported with the Djibouti government in 2001. Well-worn Eastern Electra N5523 taxies toward its gate on November 9. Sold to Zantop in 1977 and converted to a freighter, it broke up in flight seven years later near Chalkhill, Pennsylvania. Here’s one shot I caught over at JFK during rush hour; count the airplanes! I always liked Finnair’s clean lines and titles. 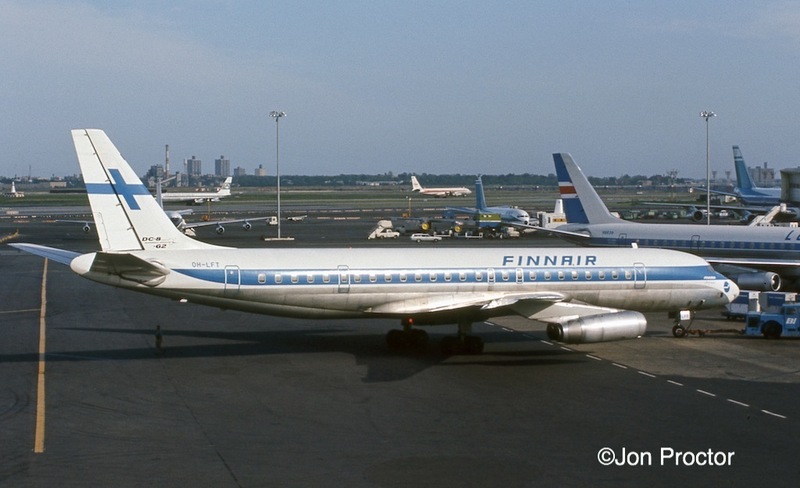 DC-8-62 OH-LFT, Pavlo Nurmi, was later sold. 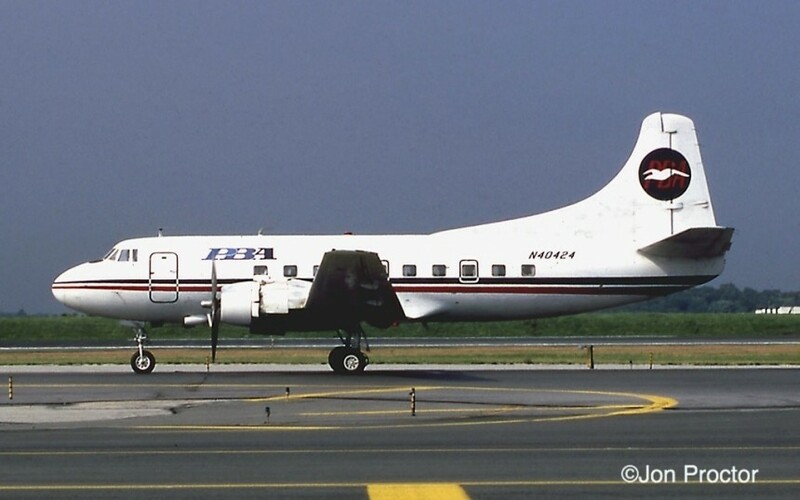 Converted to a freighter with upgraded engines, it became N721CX with Air Transport International (ATI). A nice pair of sequence images show Delta DC-10-10 N603DA departing in near-perfect, late-day sun at La Guardia on February 13, 1973. The tri-jet lifts off Runway 31, above. Switching to a telephoto lens, I caught her climbing out, as shown below, no doubt headed for Atlanta. 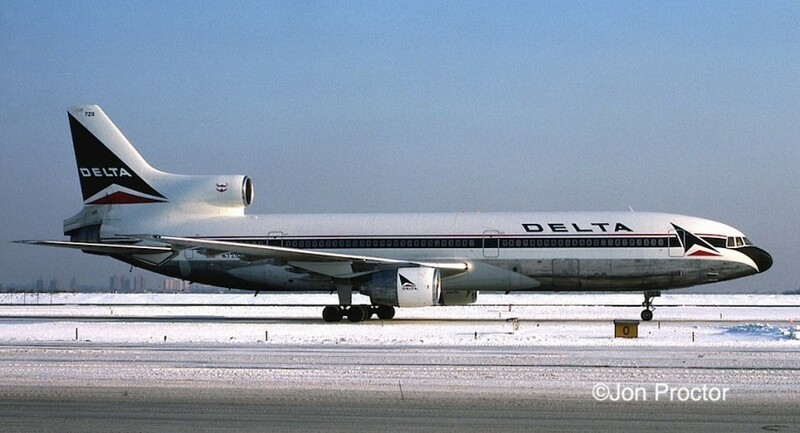 Delta leased five DC-10s beginning in late 1972 while awaiting delayed Lockheed L-1011 TriStars. 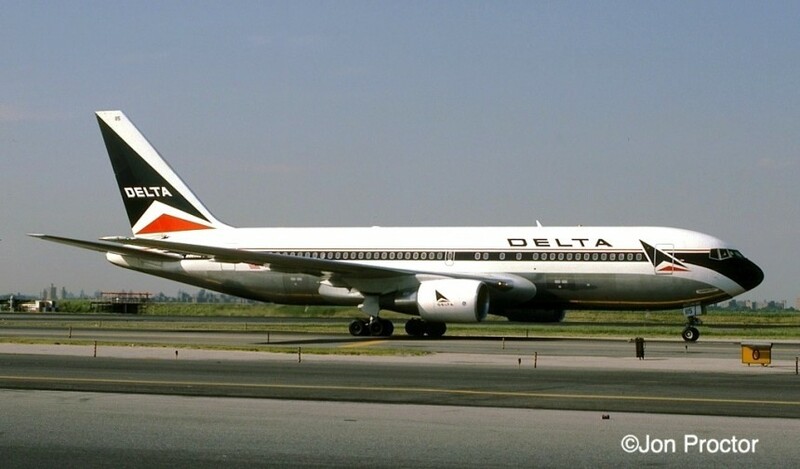 In 1975, all went to United but nine more joined the fleet 12 years later when Delta acquired Western Airlines. 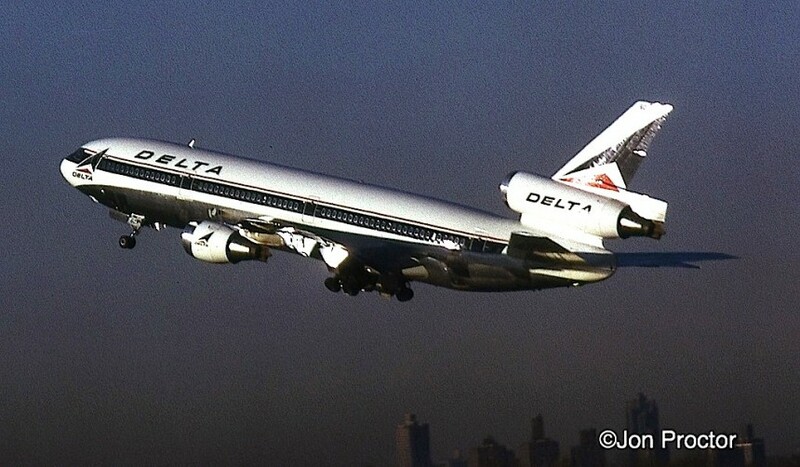 They stayed less than three years as by then Delta was amassing the world’s largest L-1011 fleet. 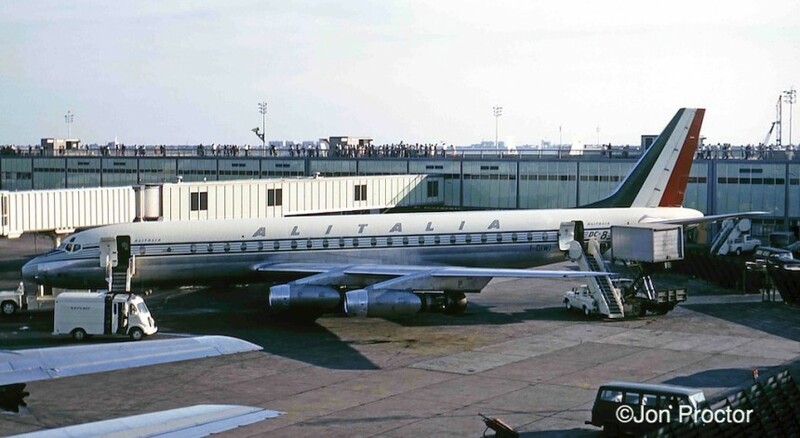 Walking across the ramp at La Guardia after getting off an Eastern Shuttle Electra in the late afternoon on April 25, 1974, I came upon the perfect opportunity for a profile shot of L-1011 N315EA, utilizing some empty ramp space between assignments. The TriStars were not part of EAL’s shuttle schedule. I was aboard a United 727, headed for Minneapolis/St Paul on April 13 when, just by chance, Eastern Electra N5531 appeared in my camera lens. A year later it was destroyed at Boston, the victim of a bomb detonation while parked in the middle of the night. 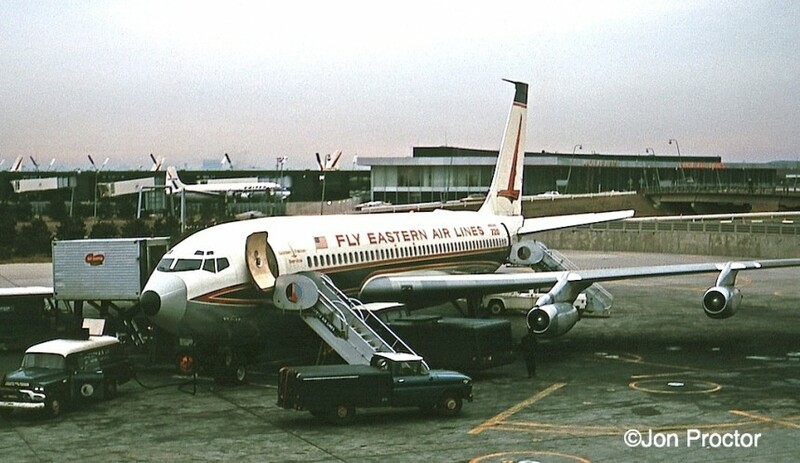 During my stint working for TWA in the NYC corporate offices, I traveled to Boston on an infrequent basis, and when possible utilized the Eastern Shuttle. At the time, Electras were used in back-up service. I tried to get as many rides as possible on the venerable turboprops. On October 31, 1975, I lucked out and caught a ride on N5504 BOS-LGA. To avoid inevitable ATC issues, Electra pilots filed VFR and cruised at 10,000 feet to get around the delays. Approaching New York, White Plains Airport (KHPN) is visible between the engines and that’s the Hudson River above. By then in its 16th year of service, the well-worn Electra was still more fun to ride than a DC-9-31, and roomier. Some of them still had split first/coach layouts and you could score a wide seat. One of the very few pictures I took a Newark includes 727-31 N98791, seen after pushback from the gate. This was one of four late-purchase, standard-body 727s that TWA acquired more than a year after its first 727-200s began arriving. Here’s a class EWR picture I can’t pass up, of Delta’s Golden Crown Convair 880 N8809E, taken in November 1962 by David Anderton. Check out the businessmen heading out for another day on the road. This particular airplane was later sold to Elvis Presley and re-registered N880EP. It now resides in Memphis, adjacent to Graceland. Boeing 727-31 N844TW occupies close-in Gate 22 at La Guardia on October 16, 1975, wearing its then-new twin-stripe, TRANS WORLD livery. 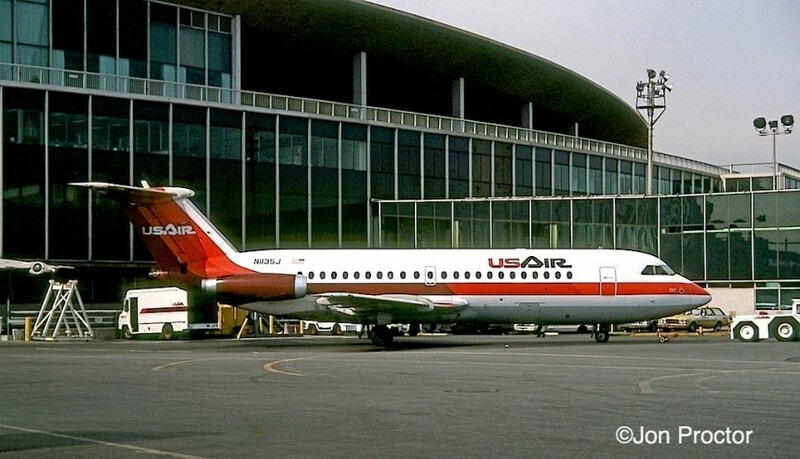 Only 727-100s and DC-9s could get into Gate 22, which later had a Jetway installed. There’s a sizable gap in my photography here, while I was Chicago-based then working in Manhattan and finally on assignment with Saudi Arabian Airlines. But I was able to shoot DC-9-14 N1054T as it arrived at the same close-in gate, perhaps from Pittsburgh. 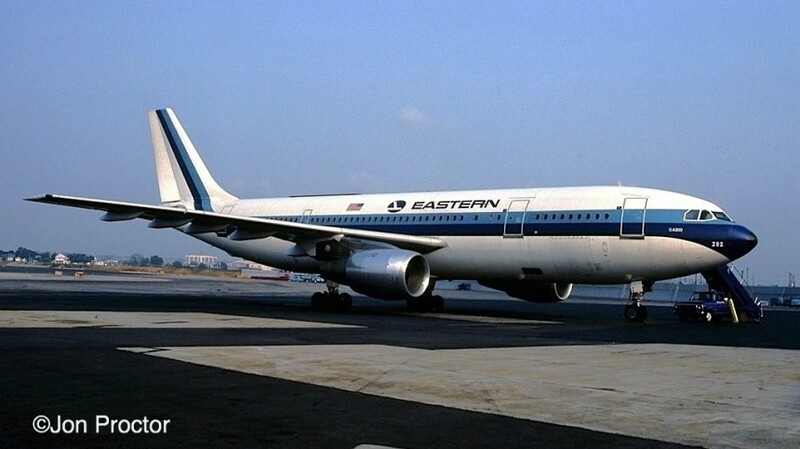 In addition to its regular fleet of A300s, Eastern acquired two specially configured for its Air Shuttle service from La Guardia to Boston and Washington National, but was unable to get permission to operate the type into National. However, LGA-BOS flights were implemented. 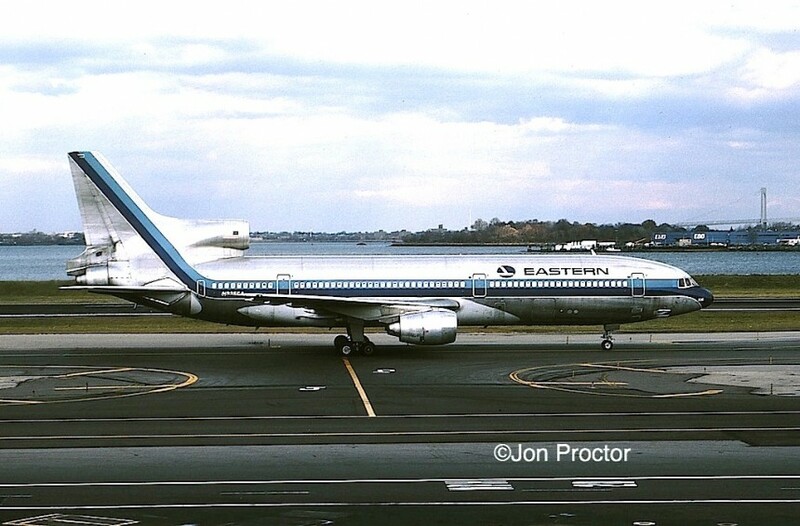 I had deadheaded from BOS on August 30, 1980 aboard N291EA and caught its sister, A300B2K-203 N292EA parked off to the side at the Shuttle terminal. Unable to gain sufficient utilization without DCA authority, Eastern later reconfigured the two and assigned them to regular mainline service. 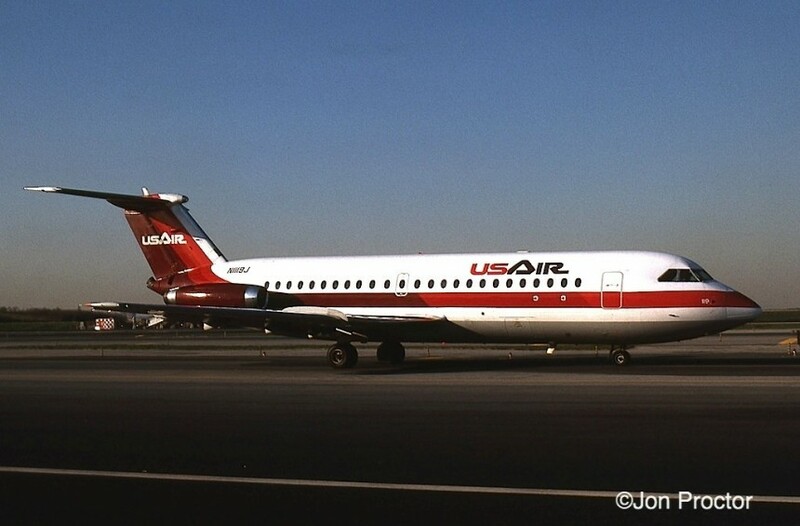 USAir inherited a fleet of BAC 1-11s while still flying under the Allegheny banner, after merging with Mohawk Airlines in 1972. N1135J, originally N1552 with Braniff, was easy to photograph, standing under the wing of a TWA 727 opposite the adjacent concourse at La Guardia Airport. 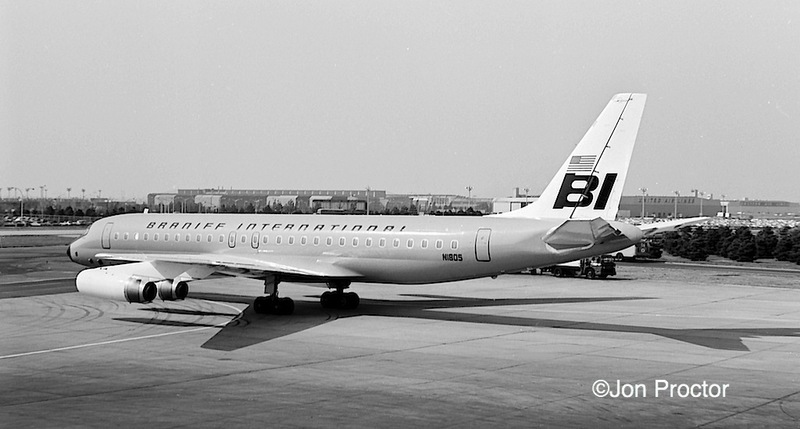 This airplane went on to fly for Florida Express and “Braniff II.” It was retired in December 1992 and met the cutter’s torch at Hondo, Texas. Out on a taxiway, N1119J posed for me as it headed for the departure runway. A Mohawk original, it was retired in 1989 and eventually broken up for spare parts in Bournemouth, England. One of Delta’s late-delivery L-1011s, N730DA features the “Frisbee fairing” ridge between the No. 2 engine inlet and fuselage crown. 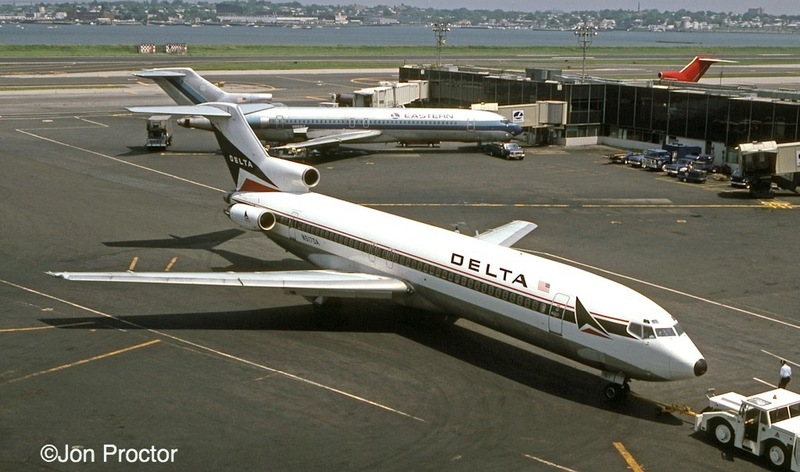 Unlike TWA, Delta did not retrofit its early arrivals. I loved shooting at LGA in the late-afternoon, low sun. Sharing a concourse with TWA, Delta’s gates were close to the adjacent Eastern gates and required towing in and out. 727-232 N517DA is pushed out, seen before the black anti-glare paint was added to the area around the cockpit windows. At JFK, TWA 747-131 N53110 has been pushed back from the terminal to be serviced for a later departure. Also off the gates, N57203 was one of three 747SP-31s TWA acquired for anticipated nonstop routes from New York to Saudi Arabia. When approvals failed to materialize, the SPs were deployed on various segments, including Los Angeles-London briefly, the only one that even remotely justified the type’s range. 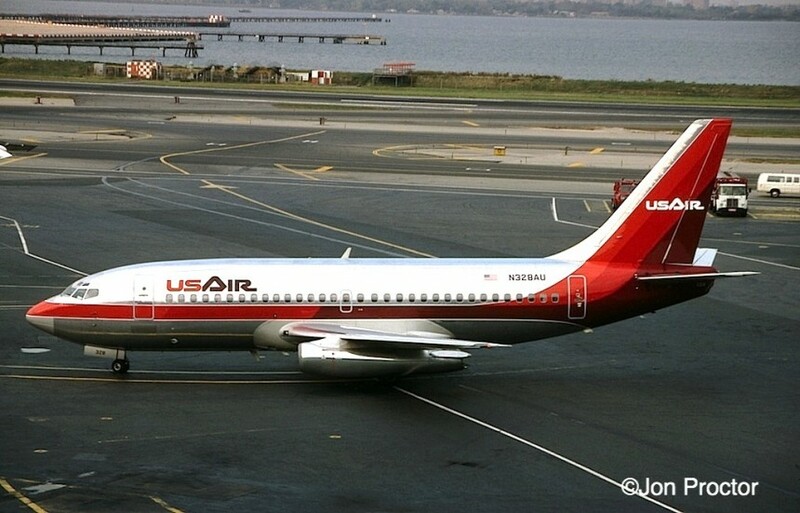 USAir leased gates at the TWA Flight Center around this time, as evidenced by BAC 1-11 N1114J. Finnair DC-10-30 OH-LHB taxis past the TWA domestic terminal after arrival from Helsinki. I obtained roof access at the TWA Commissary building, thanks to my old friend, Commissary Manager Teddy Grundman, and was able to get unobstructed shots of airplanes arriving on Runway 31-Right on a crystal-clear October day. Here’s a series of pictures from that location. TWA 747-131 N93104 caught just as it touches down, producing plenty of tire smoke. N93104 taxis back to its assigned gate at Flight Wing One. Along for the photo shoot were my Ausie friends, Geoff Thomas and Laurie Baker. 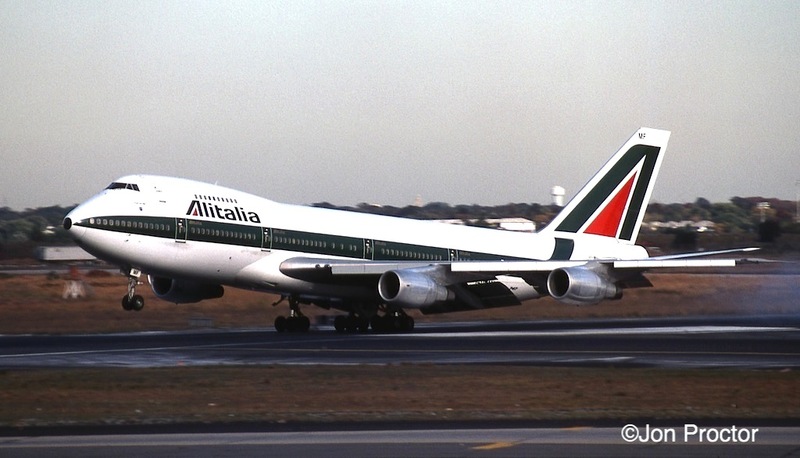 Four-year-old Alitalia 747-243 I-DEMF, named Portofino, arrives gracefully from Roma. Converted to freighter specifications in 1995, it flew for Atlas Air and was finally retired in 2011. 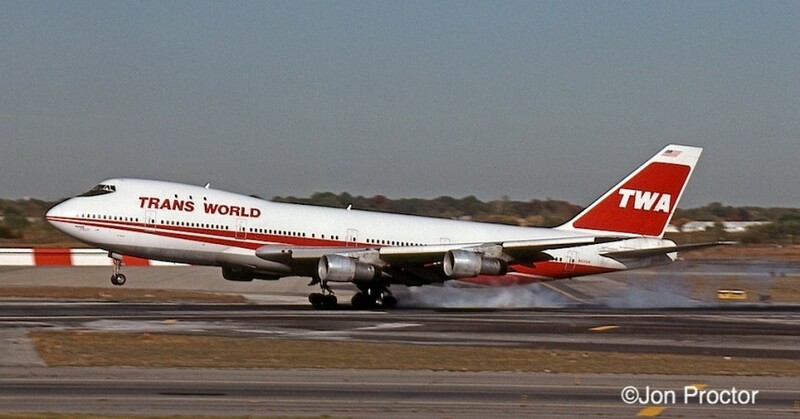 Rolling out with engines in reverse thrust is 747-282B N301TW, one of five model 200s TWA acquired used in the 1980s for added lift and better long-range performance. 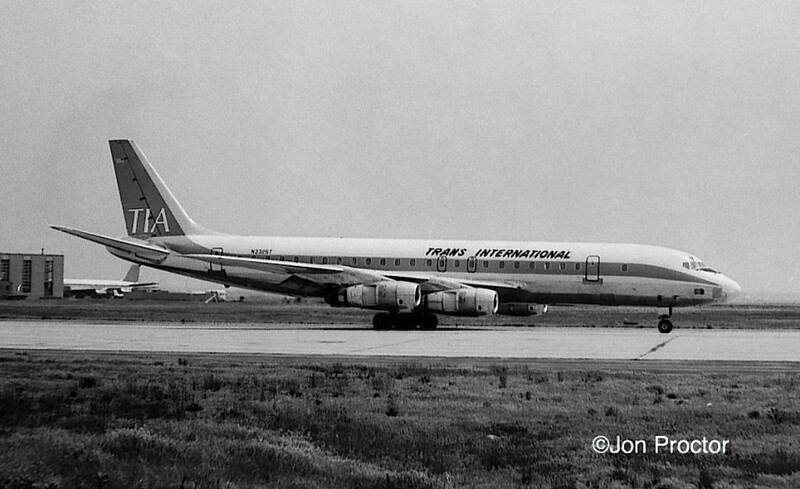 Three, including this ex-TAP Air Portugal jumbo, were easily identifiable by six additional upper deck windows. Inbound from Copenhagen, SAS 747-283B Combi N4501Q, Dan Viking, kisses Runway 31-Right wearing a U.S. registration, probably the result of a lease arrangement. Twenty-four years later, she was serving as a freighter for UPS as N523UP. Another Scandinavian example, named Dag Viking, DC-10-30 SE-DFD heads for the IAB. Behold: a Herky Bird! The famous Lockheed Hercules was also produced in limited numbers for use by commercial freight operators. N12ST, a L-100-30 stretched variant, first flew for Saturn Airways, which merged with Trans International and was later renamed Transamerica. 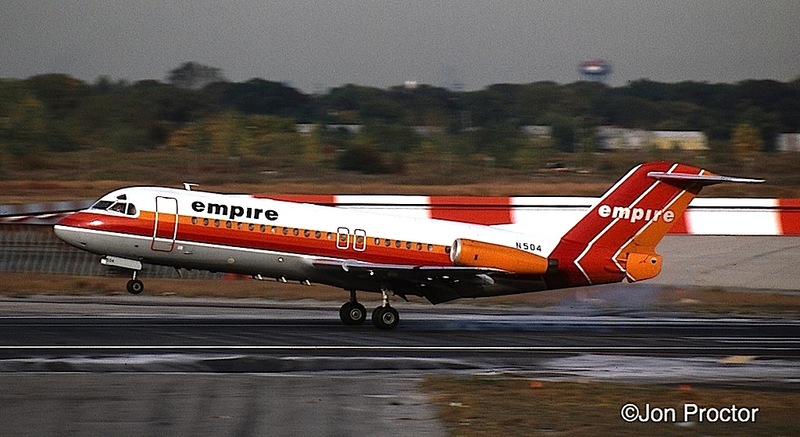 Among the smaller types operating into JFK was this Empire F.28 Mk 4000. N504 went first to Altair Airlines and migrated to Piedmont when it acquired Empire in 1986. The Fokker flew out its career with Horizon Air as N490US in the Pacific Northwest, where I got several rides on her. With daylight fading, I got my final pictures. TWA 727-231 N54336 has just turned off the active runway. 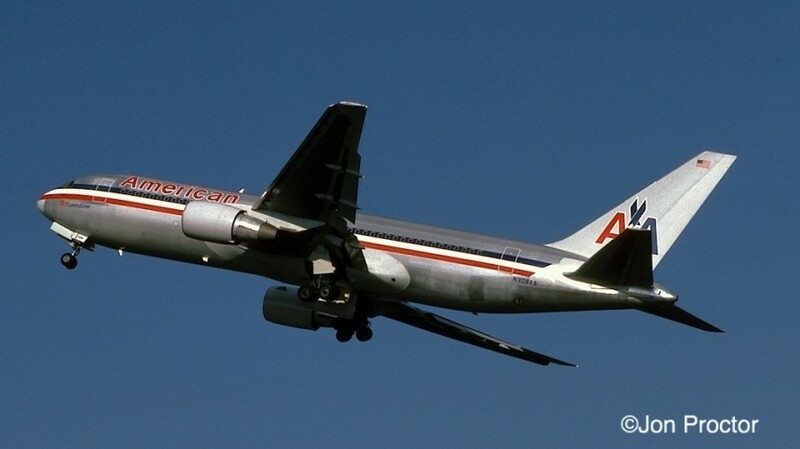 DC-10-10 N146AA was first flown by National as N61NA and came to American from Pan Am four months before I shot it. Midway Airlines initiated Metrolink service with DC-9s and MD-80s in June 1983, featuring four-across seating and upgraded inflight service aimed at increasing business traveler allegiance. The plan was popular but highly unprofitable, and discontinued two years later. 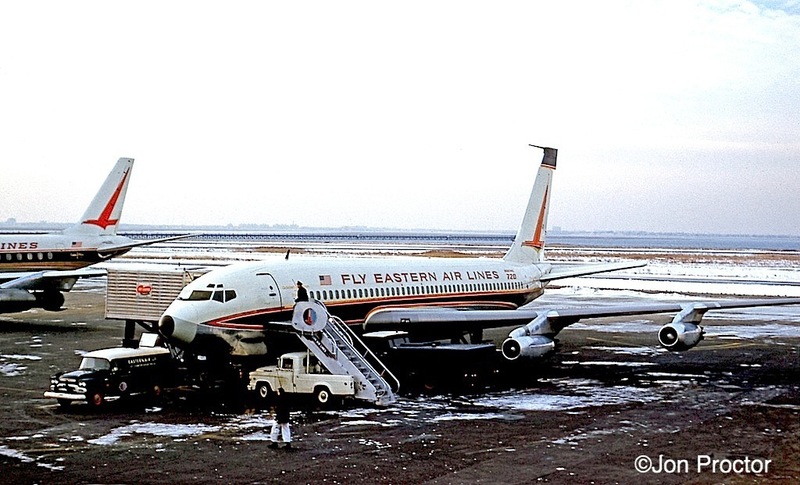 Here DC-9-15 N1064T is pushed back at Newark. 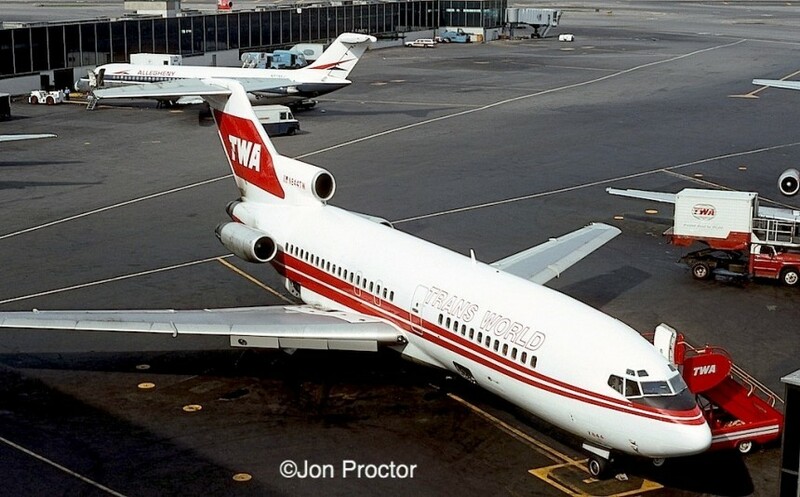 Perhaps ironically, TWA did the ground handling for Midway at EWR, utilizing one of its gates, and the pictured airplane was indirectly acquired from the same source. The rest of 1984’s photos are at La Guardia, where I was flying most of my trips from. 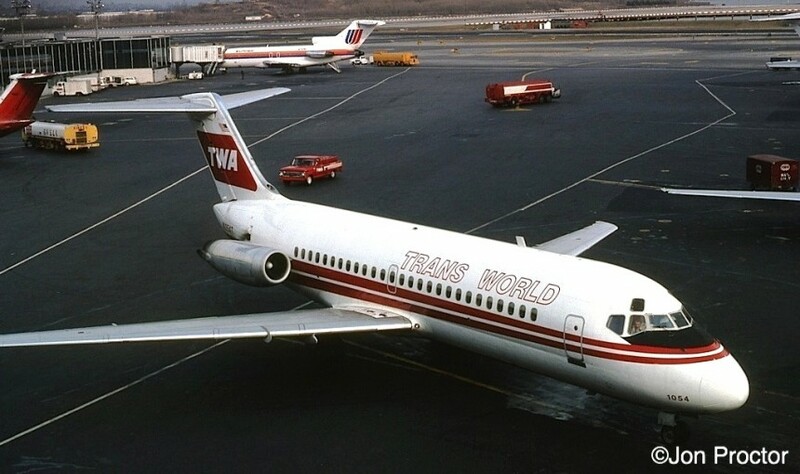 With both TWA and LGA Airport ID badges I had nearly unlimited access at the airport, although the Port Authority Police occasionally chased me off the ramp. 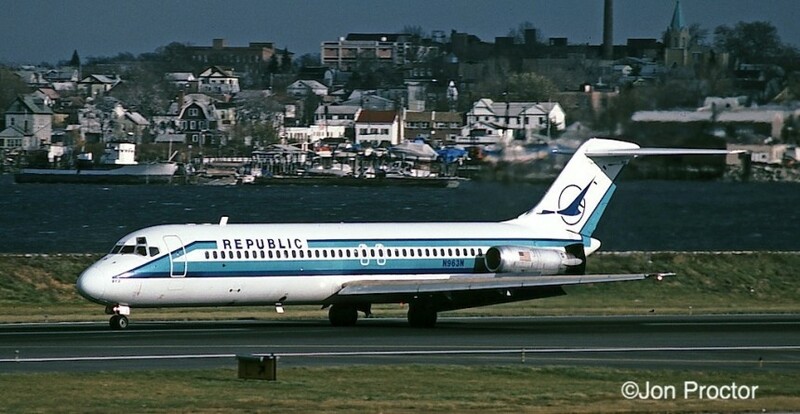 But I took photos like this one of Republic DC-9-31 N963N by standing in a blind spot in front of the ramp tower atop the TWA concourse. Standing in the same spot and framing with a bit more telephoto, I got some nice takeoff shots as well. 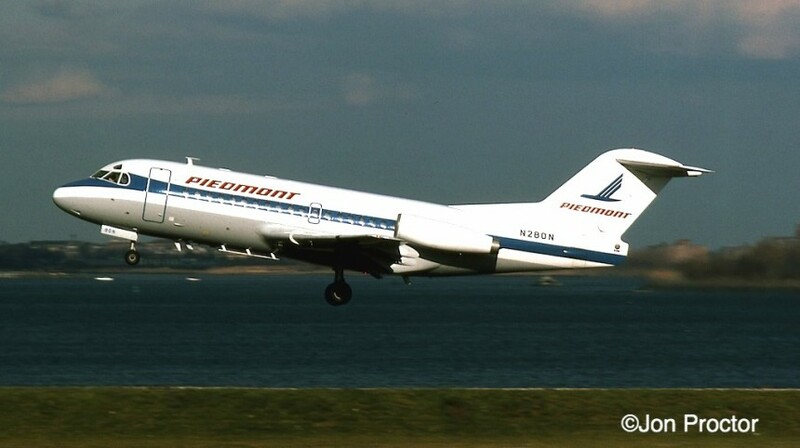 Piedmont F.28 Mk 1000 N280N had been acquired only a few months earlier from Garuda Indonesian Airways. 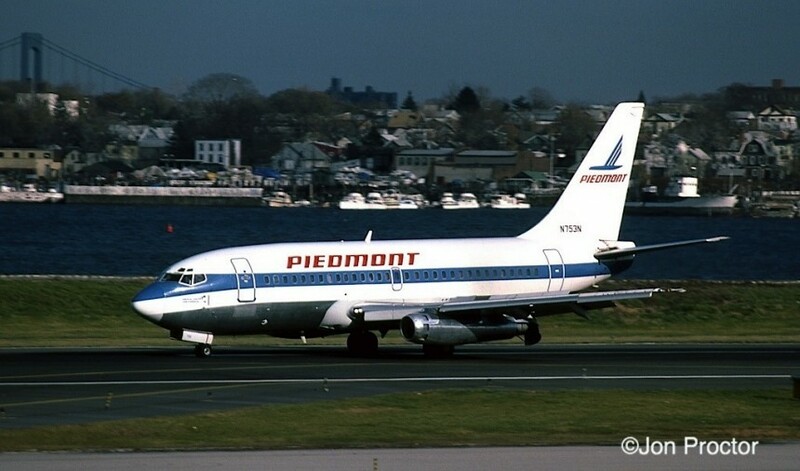 Piedmont Boeing twin-jets were more commonly seen at LGA. 737-201 N753N, Yadin Valley Pacemaker, rolls out on Runway 31 with the Whitestone Bridge visible in the background. 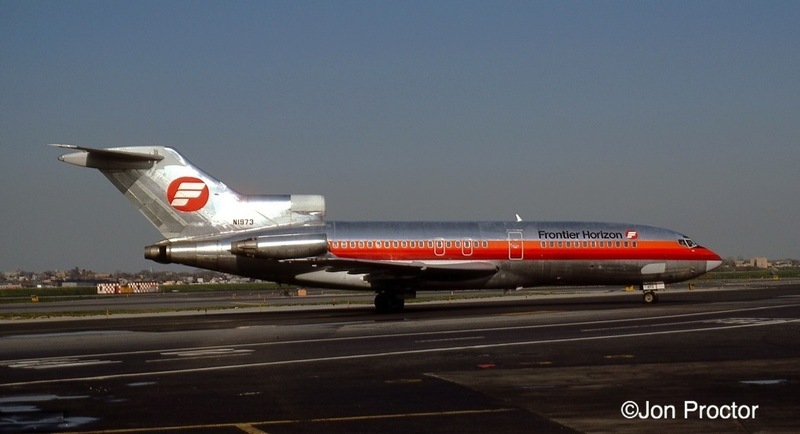 Frontier Horizon was a short-lived non-union subsidiary of Frontier Airlines. Former American 727-23 N1973 has just arrived nonstop from Denver. Fresh out of overhaul, TWA 727-31 N858TW taxis in while above, it appears a 757 has executed a missed approach. One of TWA’s factory delivered 767-231s, N605TW awaits last-minute bags before heading to St Louis. American 767-223 N308AA must have been carrying a light load as it climbed sharply from Runway 31, above, and turned away. 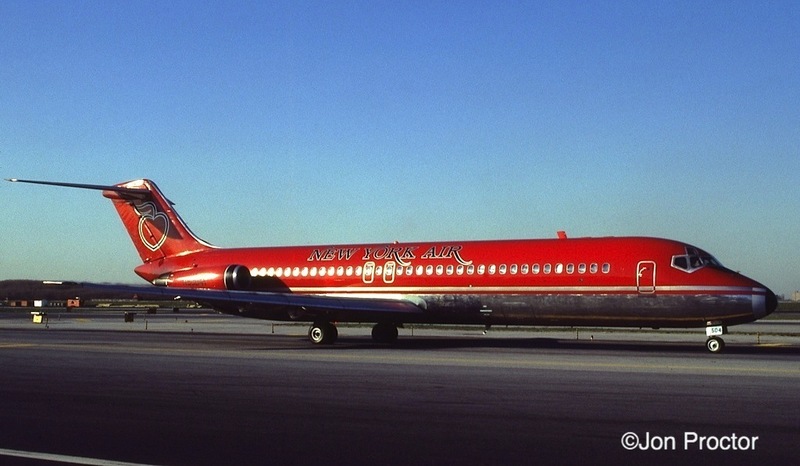 Another “child of Deregulation,” La Guardia-based New York Air appealed to Big Apple residents with its tail logo. DC-9-31 N3504T poses in the late-day sun. DC-9-31 N523NY climbs out wearing the more-common white company titles. 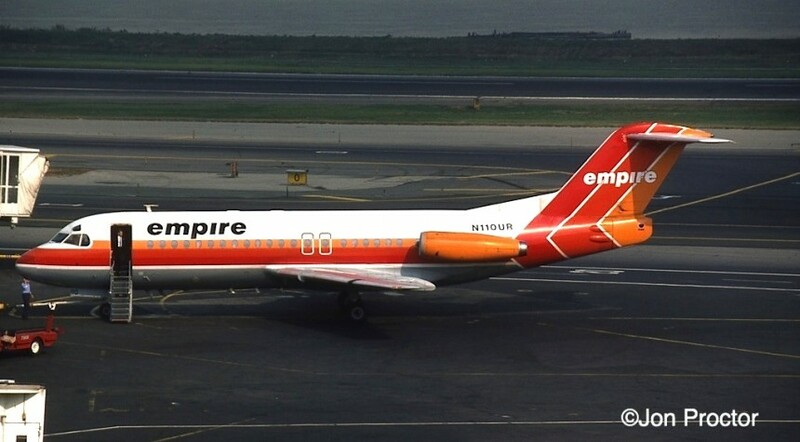 New York Air also operated a dozen DC-9-81 “Super 80s” including N805NY, before the company was merged into Continental Airlines in 1987. Immaculate Continental Golden Jet 727-224 N79743 heads for the active runway while a mechanic sprints away. 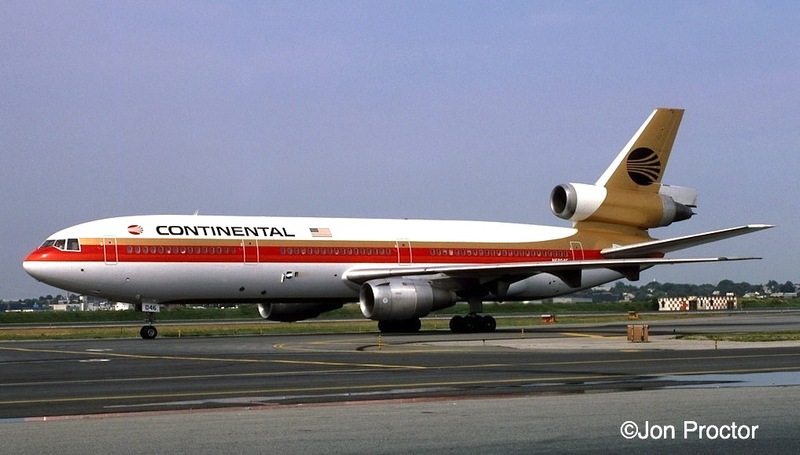 Widebody tri-jets were frequent visitors at LGA through the 1970s and ’80s, including Continental DC-10-10 N68046. 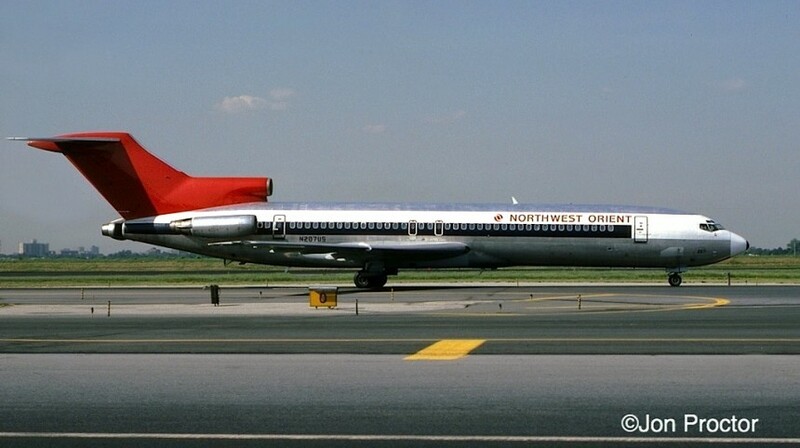 A long-time La Guardia resident, Northwest Orient operated mostly 727s here, including 727-2B7 N207US. Pan Am returned to La Guardia with its acquisition of National Airlines in 1980. 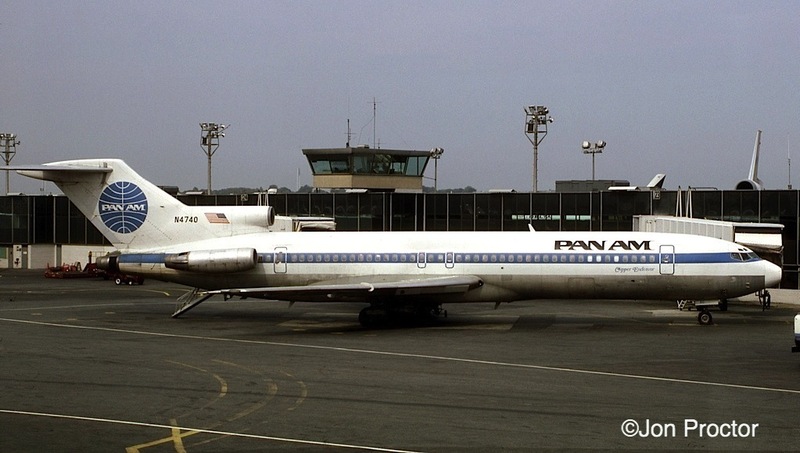 Ex-NA 727-35 N4622 became Clipper Templar with its new owner. 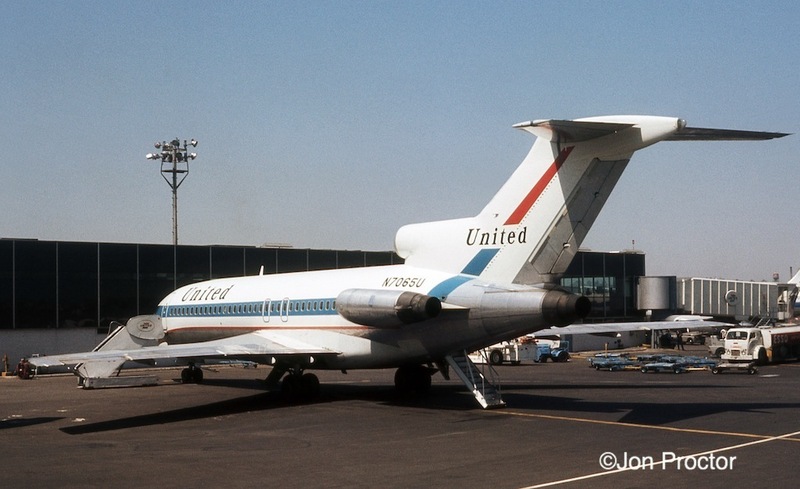 I photographed another ex-National tri-jet, 727-235 N4740, Clipper Endeavor, from the adjacent concourse. 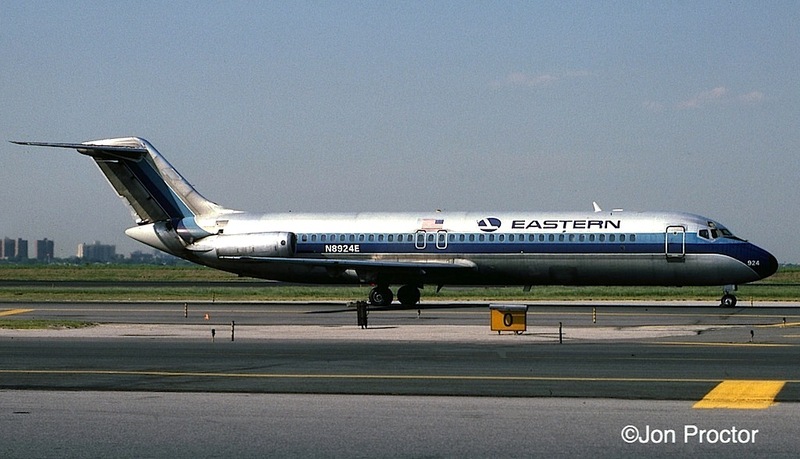 Eastern was a major operator at La Guardia, in part because of its Air-Shuttle operation. Shuttle 727-254 N548PS was originally built for Mohawk Airlines but not taken up. Instead it went to PSA, hence the registration. 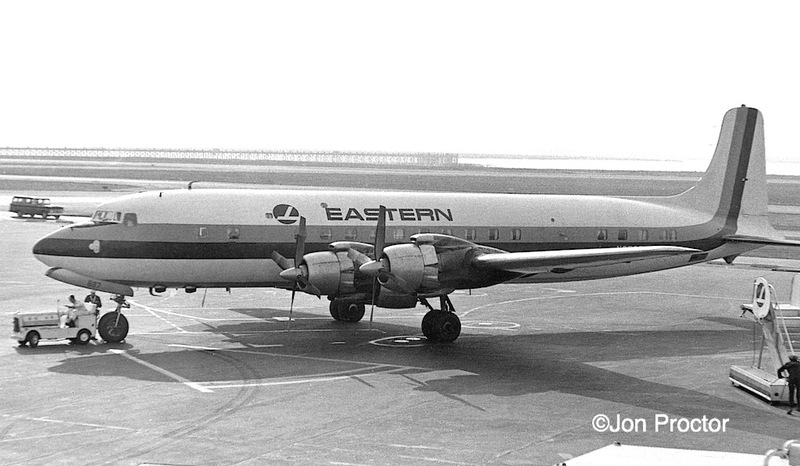 Acquired by Eastern in 1981, it was later re-registered N548EA. 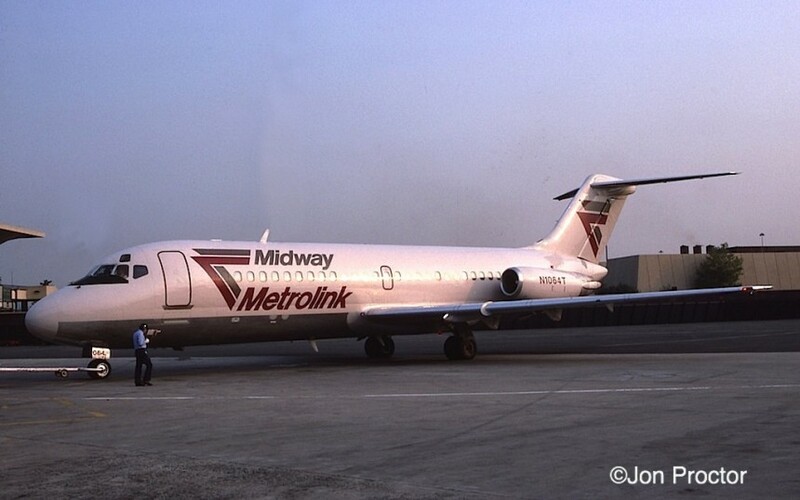 Another 727-254, N536PS wears the more-traditional bare-metal livery. Repeated Jetway rubbing against the fuselage is apparent around the forward boarding door. It’s hard to believe that Delta’s 767-200 fleet has been long-since retired; N115DL looks brand new in this June picture. DC-9-32 N1268L was part of Delta’s factory-delivered fleet, also long gone, but with its Northwest merger the type returned. 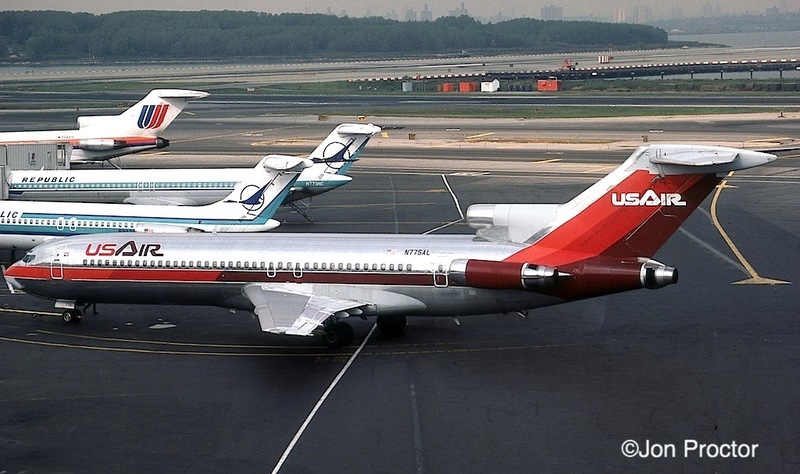 All but a handful of DC-9-51s remained for awhile and have since been disposed of. 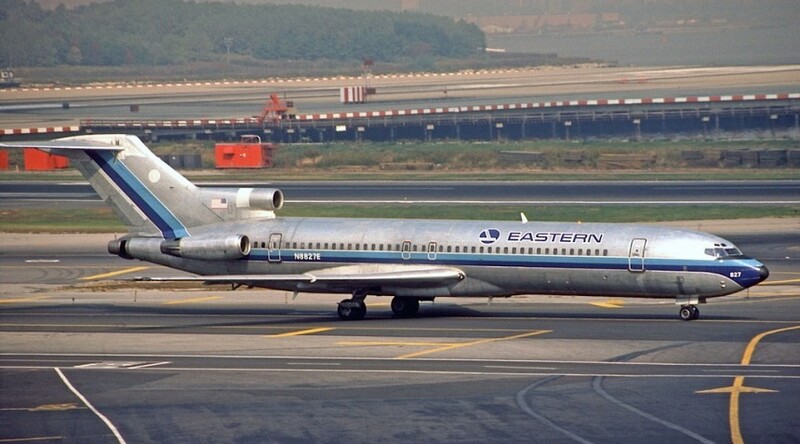 Eastern also operated a large DC-9 fleet. N8924E, a model -31, wears a bare-metal scheme. 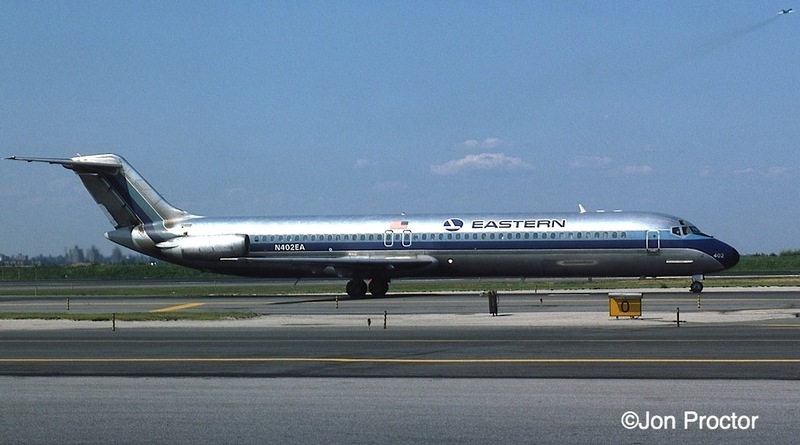 Although Swissair was the DC-9-51 launch customer, Eastern became the largest operator of the variant, which was 13 feet longer than the -31 and fitted with more powerful engines and stabilizing “strakes,” visible on N402EA’s forward fuselage. 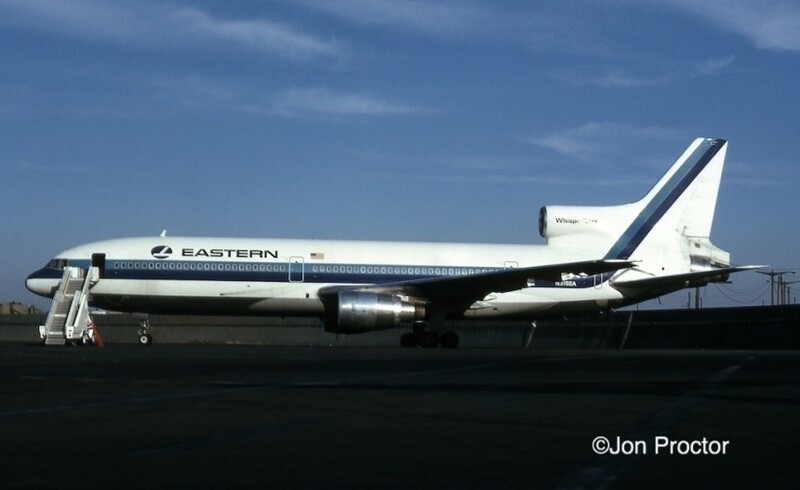 L-1011 N335EA, one of Eastern’s later TriStar deliveries, flew from La Guardia to Atlanta and Florida destinations. 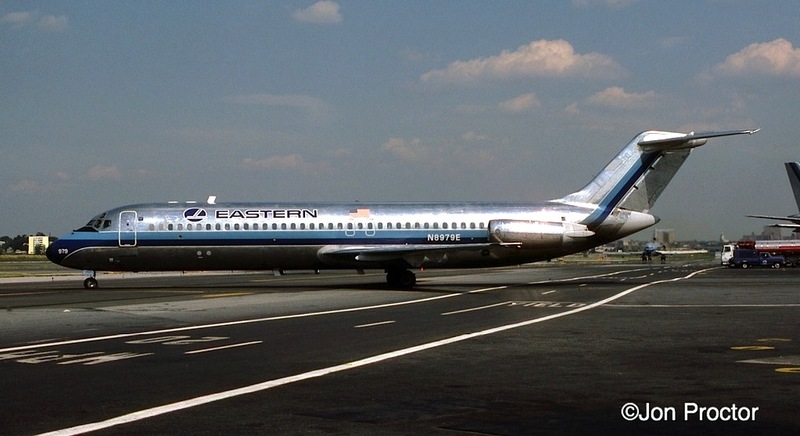 Eastern’s later liveries – perhaps the last – were modified by running the dual cheatline below the passenger windows, as can be seen on DC-9-31 N8979E, above, and 727-225 N8827E, below. Doing so eliminated the time-consuming task of masking off individual windows during repaint. 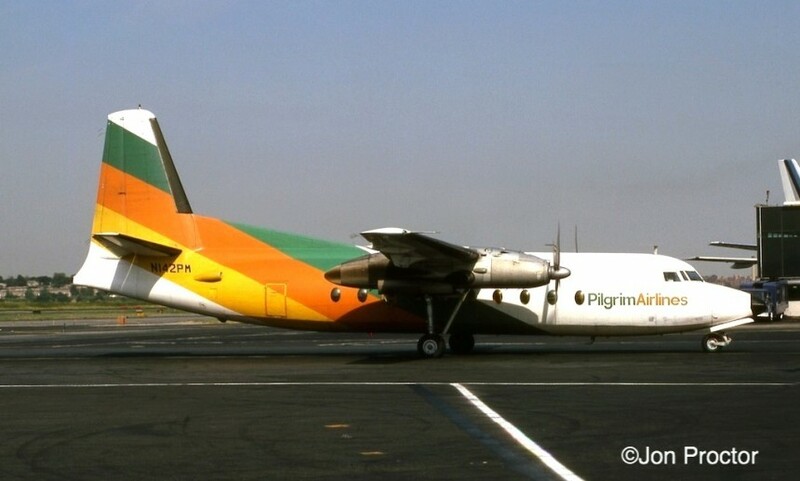 New London, Connecticut-based Pilgrim Airlines was the first U.S. operator to operate the Dutch-built Fokker F.27. N142PM taxis to its assigned gate in this June 12 photo. The company was acquired by Business Express two years later. Originally named Northern Airways, Burlington, Vermont-based Air North acquired three Fokker-built F.27 from defunct Swift Aire in 1982, including N421SA, and retained that carrier’s livery. Air North and regional operator Clinton Aero were combined only a few months after this picture was taken, operating as Brockway Air, which retained the F.27s for another three years. 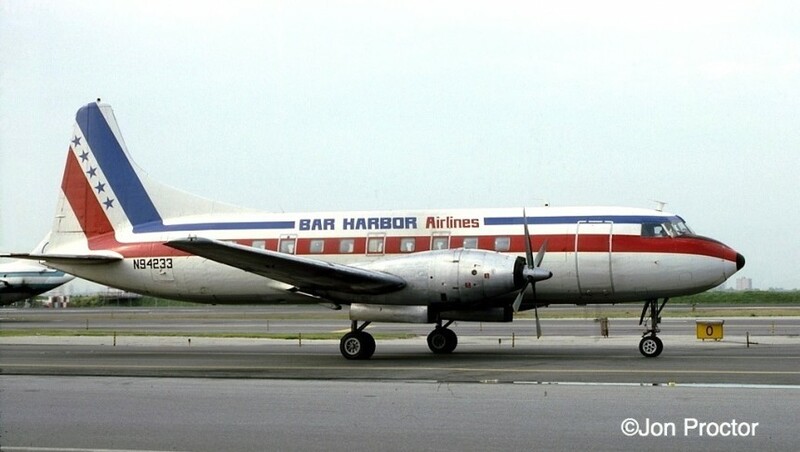 Maine-based Bar Harbor Airlines began scheduled service in 1971 and flew a variety of aircraft including Convair 600 N94233, which was more than 35 years old when I photographed her, taxiing on one engine and still wearing the same registration assigned when it was delivered to American Airlines as a Convair 240. That ridge over the cockpit windows center post was called a “duck cutter,” designed to deflect bird strikes. 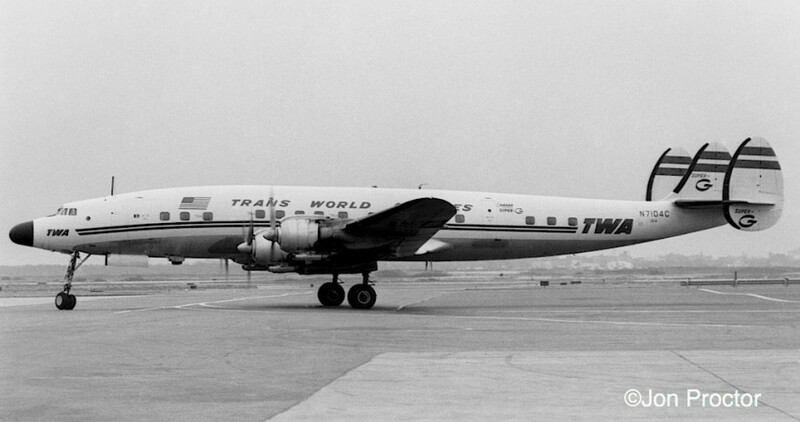 Another old-timer, Martin 404 N40424 began its career with TWA in 1952. 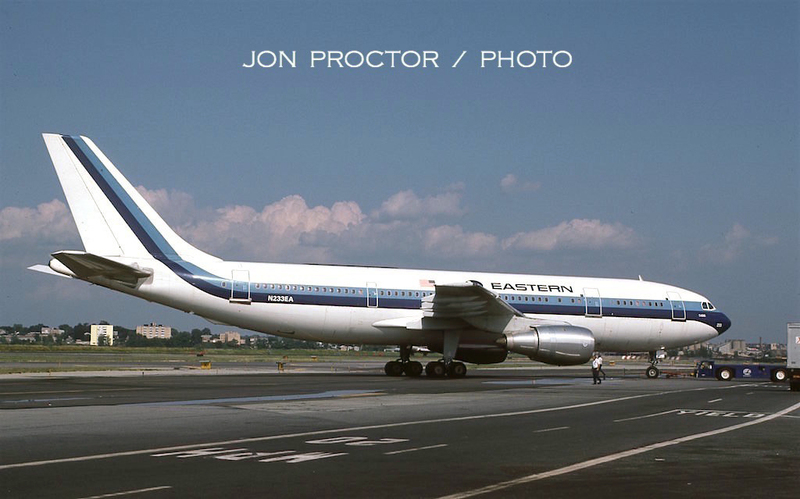 Thirty-two years thereafter, it was still soldiering on, with PBA, Provincetown-Boston Airlines, another New England carrier that sent much of its fleet to Florida in the winter months for warmer-weather flying. The carrier was bought out of bankruptcy by PeoplExpress in 1986 and consolidated with Bar Harbor two years later. Empire served both JFK and LGA. 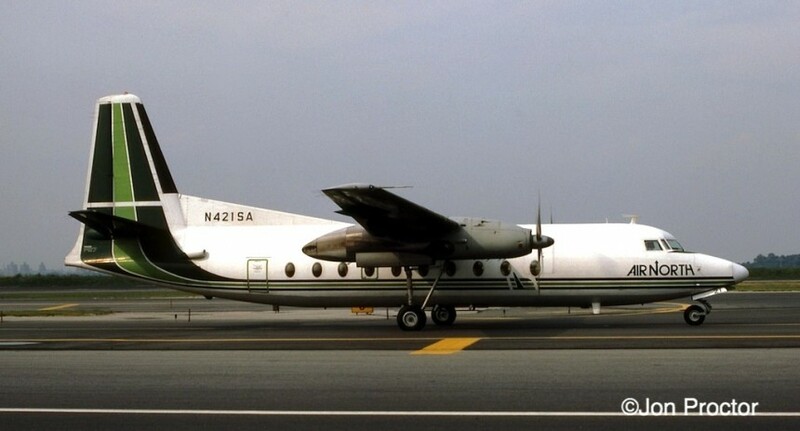 F.28 Mk 4000 N110UR was factory delivered to the airline in 1982. 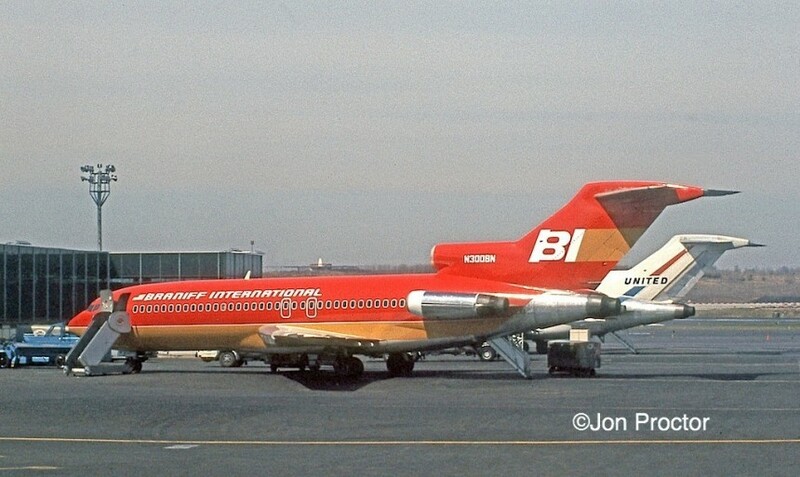 Reborn from the original Braniff International, Braniff Airways began flying March 1, 1984 with Boeing 727-200s in a new livery, including 727-227 N471BN. After struggling to survive and changing owners, the carrier closed its doors in 1989. Two more Midway aircraft. Above: DC-9-31 N931ML heads to its assigned gate. 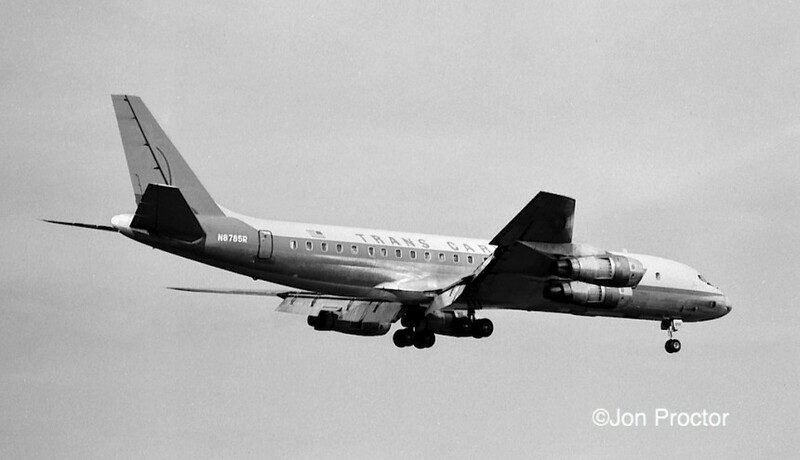 Below: DC-9-81 N10029 poses on its way to the departure runway. On a crowded ramp 727-264 N775AL is towed gingerly into its gate. Second from the last 727 built, it was originally intended for Mexicana, and instead went to US Air; it was only two years old and yet to be re-registered N765US. The tri-jet was with American Trans Air from 1993, before a cargo conversion took it to South America, flying for Rio Linhas Aéreas as PR-IOD, where it was still in service as late as July 2014. Here’s a comparison of two different types, both captured on October 17. Above: 4-month-old 737-2B7 N328AU, which later became N284AU, taxis into its gate, while below, BAC 1-11 N211J is pushed out from the same concourse. 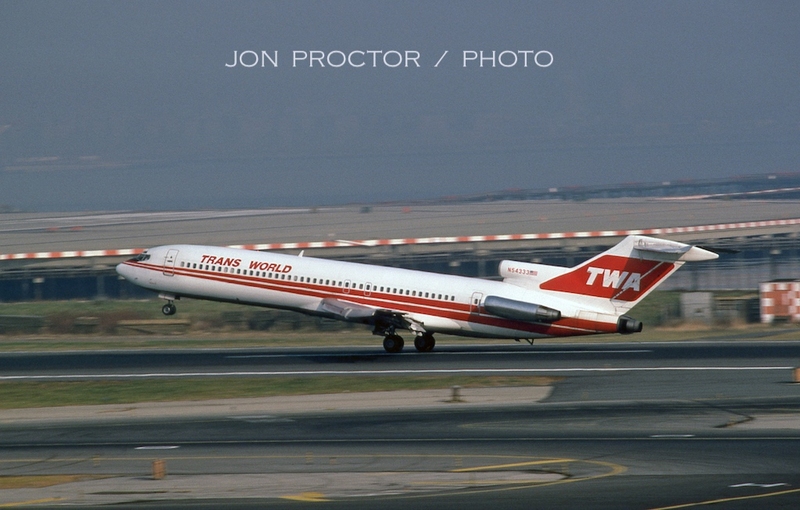 TWA 727-231 N54333 lifts off in this December 13 photo. The LGA ramp could be plenty cold in the wintertime. I shot this picture on the morning of February 7, framing Delta L-1011 N729DA. At the tail end of Eastern’s A300 deliveries, N233EA was only two years old when I photographed her on March 13. After migrating to Continental in 1990, it served many masters before being converted to carry freight only in 2000 for TNT Express. Hiding beneath a TWA 727 at JFK a few days later, I found an unobstructed spot for shooting, and caught these four aircraft. 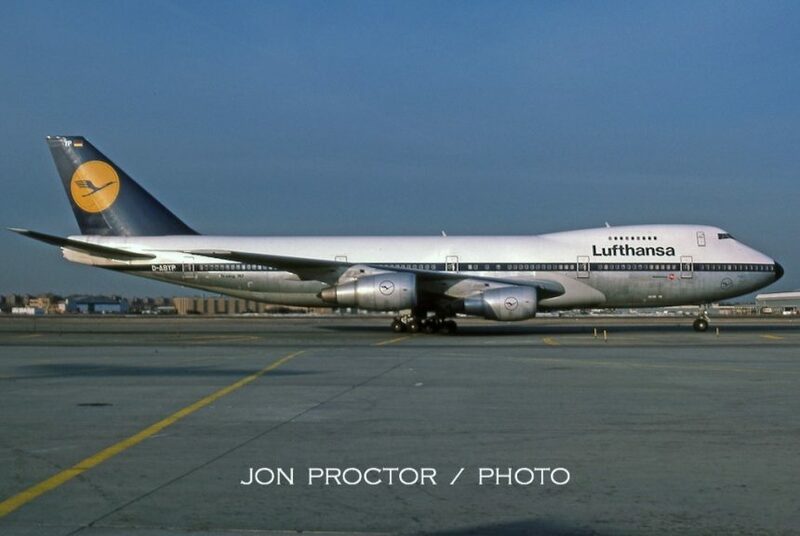 GE-powered 747-230B D-ABYP, Niedersachsen, flew its 22-year career exclusively for Lufthansa, retiring in 2001. 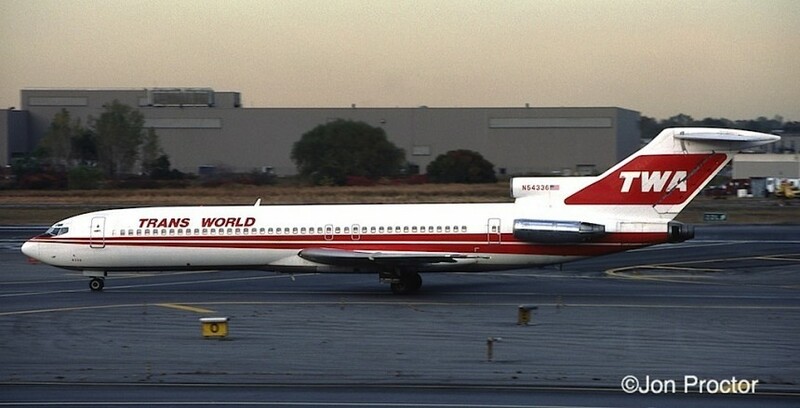 Dominicana 727-173C HI-312, named Sanchez, was originally delivered to World Airways as N691WA. Barely a month before the fall of Saigon, a rescue mission was reportedly flown with this airplane. On March 29, 1975, it carried more than 300 Vietnamese from Da Nang to Saigon, including 268 in passenger cabin and the rest in the cargo holds. Safe to say, it set a record for the 727 that will never be broken. 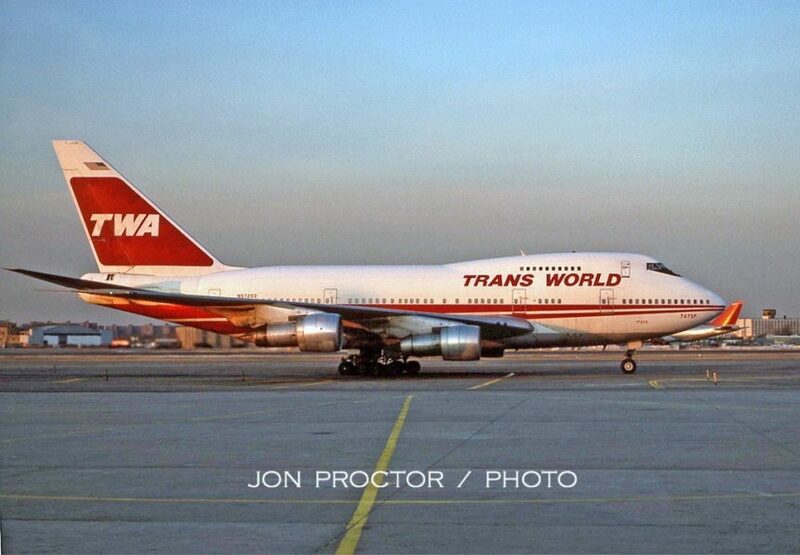 Right behind Dominicana, ill-fated TWA 747-131 N93119 poses following a trans-Atlantic flight. It went into the water shortly after takeoff from JFK on July 17, 1996, killing all 230 aboard and breaking the hearts of all TWAers. All my photos for the year were taken at JFK on March 1. Unobstructed views from the Pan Am Worldport rooftop parking lot made for an ideal photography spot until it was restricted by security concerns; what a pity. Pan Am 747-121 N740PA, Clipper Ocean Pearl turns into its assigned gate. Just above the roof line, an Air France Concorde sits on the IAB tarmac. Ex-Singapore 747-212B N723PA initially carried the name Clipper Fleetwing, but was re-branded China Clipper II for a November 1985, 50-year anniversary reenactment of the first Pan Am flight from San Francisco to Manila in 1935, operated by a Martin 130 that wore the original China Clipper name. On the 747 flight, the same four stops were made along the way, at Honolulu, Midway, Wake and Guam. 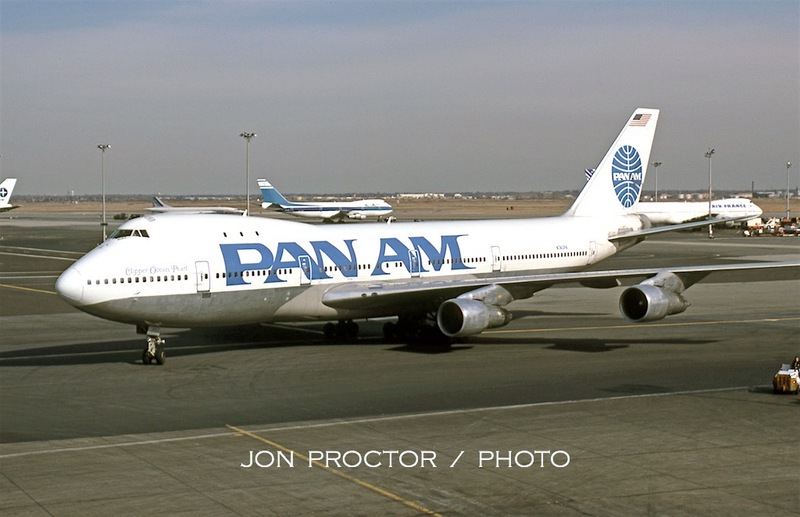 In 1986, the $750-million sale of Pan Am’s Pacific routes to United Airlines was completed. Behind Alitalia 747-243B I-DEMS Monte Argentario, a variety of aircraft occupy the adjacent IAB ramp, including LanChile, Pointe Mulhouse (a French charter carrier), Varig, Air France and El Al. 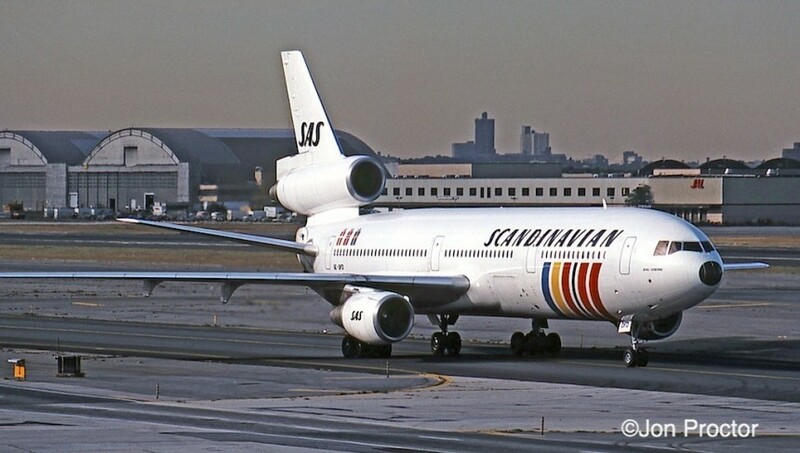 Records indicate DC-10-30 SE-DFE was named Sverker Viking, although it appears to have been changed in this picture. 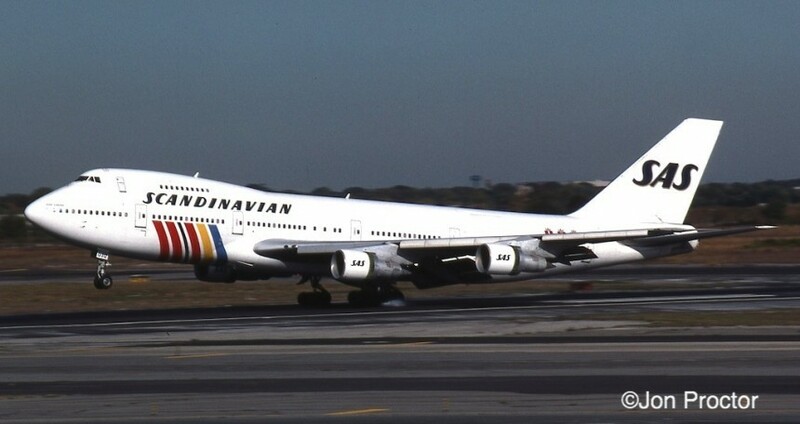 Scandinavian operated the type until 1990. 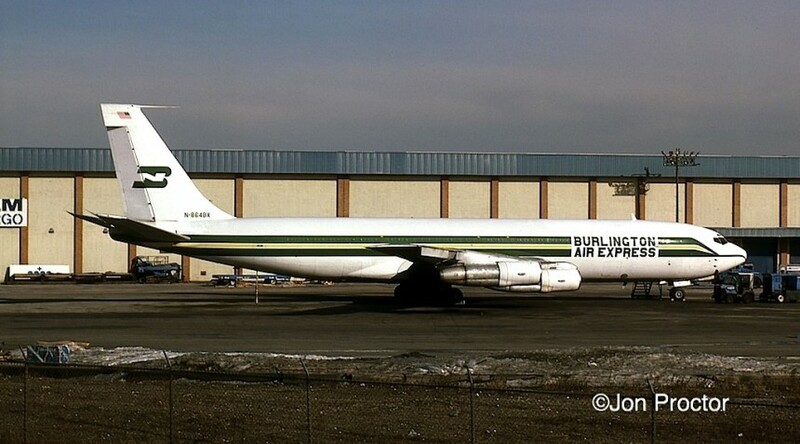 Over at Cargo City, hush-kitted Burlington Air Express 707-321C N-864BX awaits its next load of cargo. 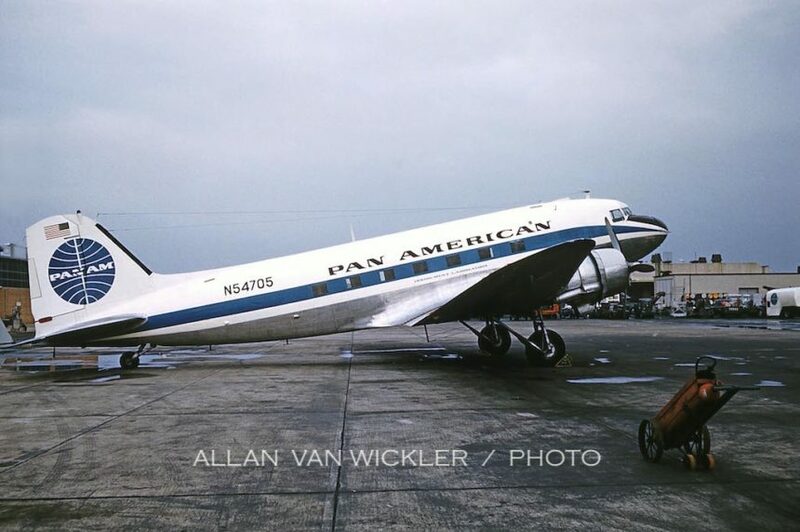 An original Pan Am delivery, the freighter flew eight years with BAX. 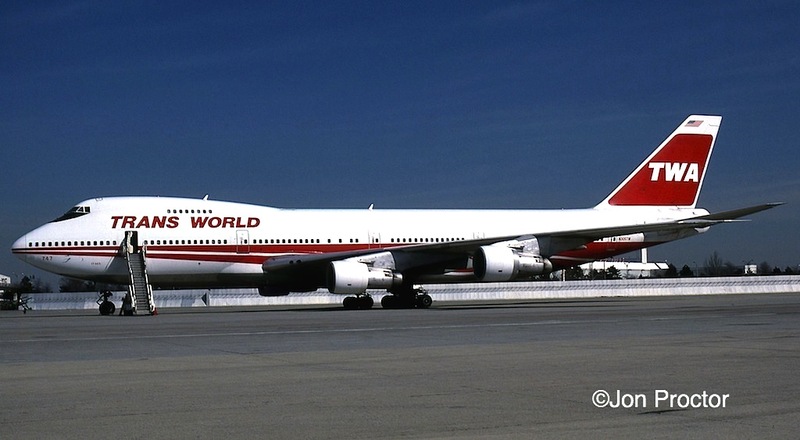 Former Olympic 747-284B N305TW sits on the ramp at TWA’s hangar. It looks ready for another flight assignment. 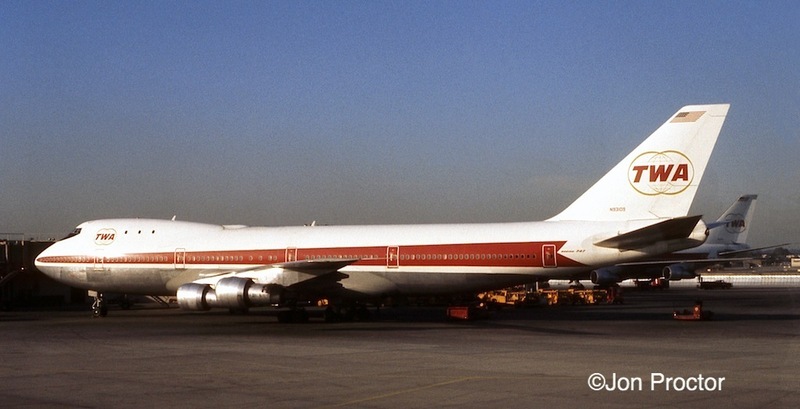 This 747-2B4B Combi served many masters. It was delivered to Middle East Airlines in August 1975 as OD-AGJ and frequently leased out. 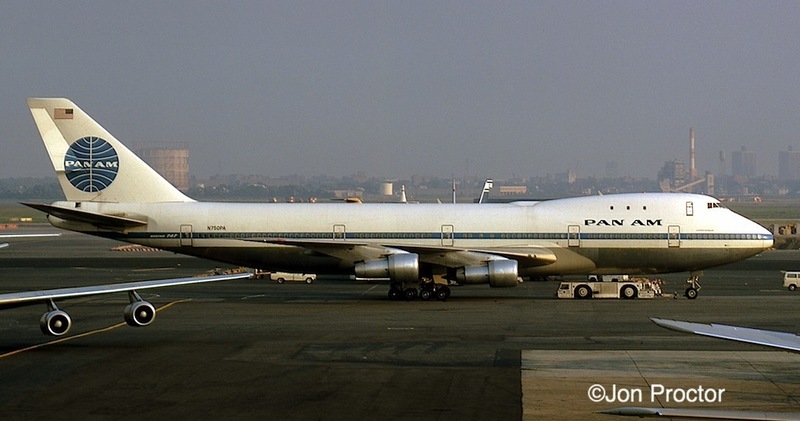 Shown about to taxi from Pan Am’s Hangar 14 ramp, it had been wearing full Egyptair colors and the name Cleopatra since 1985 and by then was owned by US company Carter Leasing. 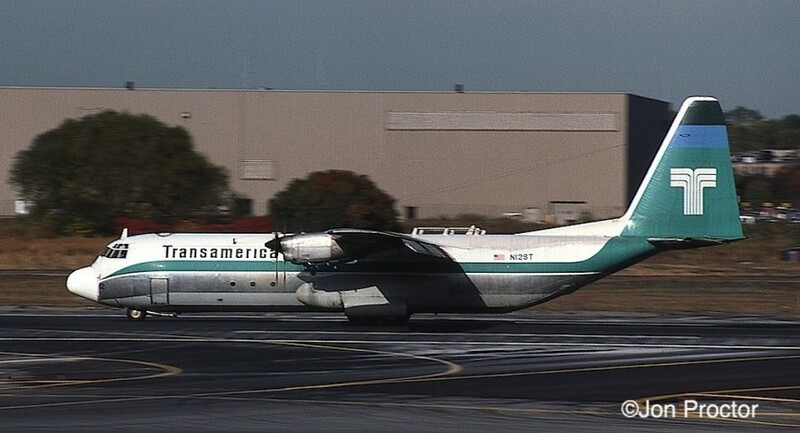 A combi model, it became N713CK with American International in 1998 and finished out its flying days as a pure freighter. I walked back to a vantage point beyond Hangar 12 to catch United 747SP-21 N540PA lifting off for a nonstop flight to Tokyo. It was still in basic Pan Am colors with small United titles following the sale of the The World’s Most Experienced Airline’s sale of its Pacific routes to The Friendly Skies. 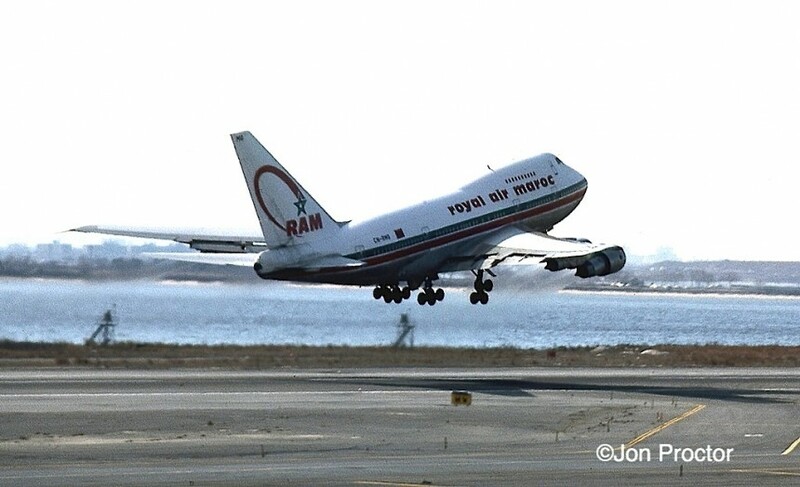 Right behind it Royal Air Maroc’s sole 747SP-44, CN-RMS used up just about all of Runway 31-Left on its takeoff roll, headed nonstop for Casablanca. Leased, then purchased from South African Airways, it was sold to Corsair in 1994. Photographed from the adjacent TWA domestic terminal ramp, 767-231 N606TW is about to be towed into a close-in gate at the Flight Center. 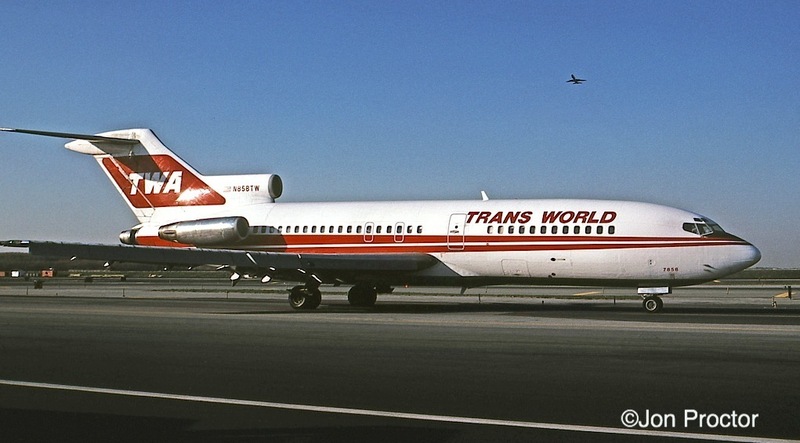 Small twin stripes and TWA lettering on the engine nacelle was an add-on to the original TRANS WORLD livery, reminiscent of the company’s Super G Constellation wingtip tanks. Photography opportunities at both JFK and LGA became more challenging with increased ramp access restrictions and I left TWA in 1991, moving to Idaho two years later. So ended many memorable days of picture taking at these airports that were such a significant part of my life. Special thanks to Phil Brooks, Dave Kaufman and Mike Machat for help with the photo captions, and to Tom Norwood; his definitive books, Deregulation Knockouts, Round One & Round Two, provided information for several of my photo captions. Jon, really like this page, espically the older stuff. I arrived in Noo Yawk only a few years before you decamped to Idaho and miss the easy shooting which was winding down by the late 1980s. Jon, thanks for the trip down memory lane. These are some fantastic photos, and great commentary. An amazing collection of NY airport images. Brilliant and so glad you did it. Many thanks for taking the time and effort to share. Thank you for another fantastic collection of images. Although I grew up in the Detroit area, I “discovered” the airline industry on a visit to JFK in Dec 1975, when I was seven years old. I stood at the windows of the then-Northwest / Delta terminal at JFK, entranced by all of the colorful airplanes from all over the world. These images bring back many happy memories, and make me wish I’d been born a few years earlier so I could experience DC-7s and Constellations in all their glory. 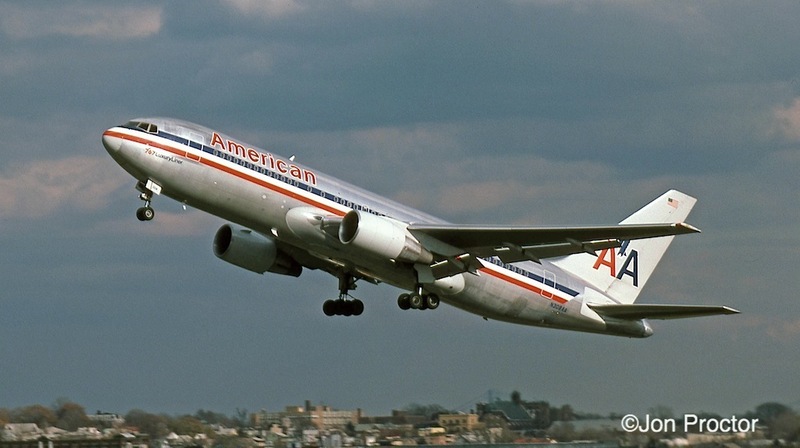 Just a note on the photo of American Airlines’ 767, N308AA. In 2004 that aircraft was pulled from long-term storage at Mojave, CA and used as the test bed for a congressionally mandated feasibility study to determine if civilian aircraft could be protected from shoulder-fired missiles. AA, working with BAE Systems, adapted military hardware to this aircraft and successfully defeated simulated and live missiles. On this project I was the Operations & Support Engineer for American Airlines. Our system was named JetEye. 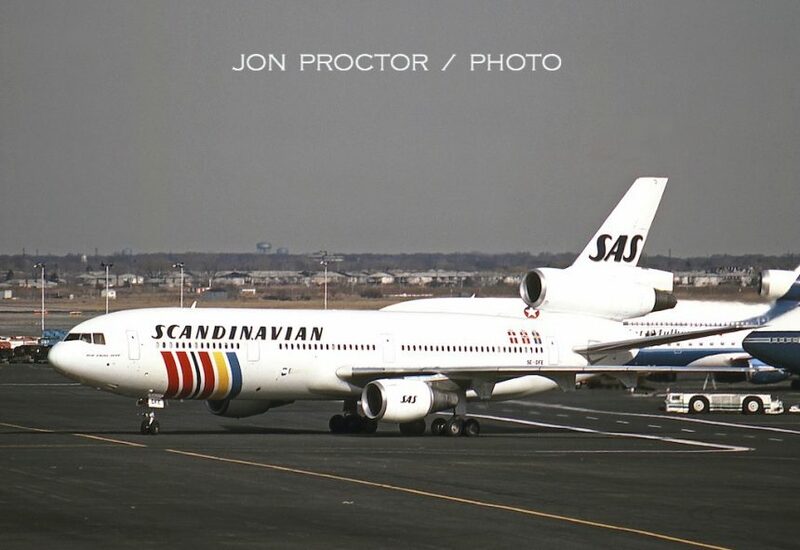 It was later installed on three in service 767s (N327AA, N328AA, and N336AA) and was flown for 2 years to test how this type equipment would integrate into a commercial airline environment. The aircraft were de-modified at the end of the study. Thanks for the memories. Started with TWA at MKC in 67 and worked MCI,CVG,STL,ORD,and back to STL. Finished up with AA in 2010.Great work in these pictures. Thank you,Jon. I started training with PAA out of Miami December 1957 and left the airline December 1967. 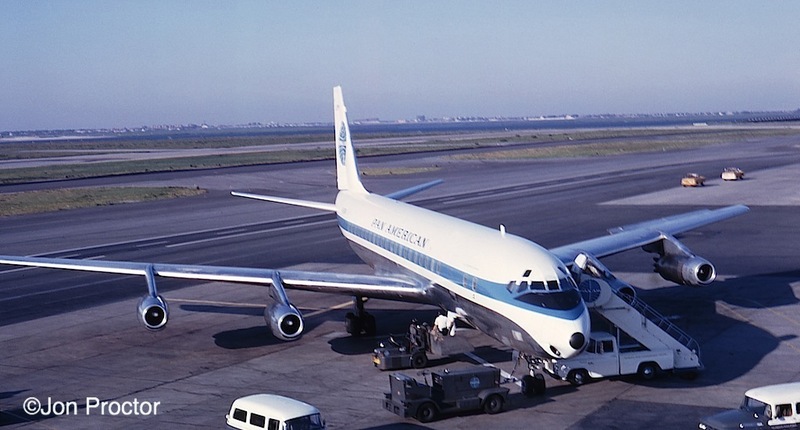 During those years I flew out of New York to Europe, Africa and the orient, was based for a while in Lisbon, started on DC4s and ended on DC8s and loved every minute of it. Your superb photos brought back wonderful memories. That was perhaps my fondest decade. Many thanks. 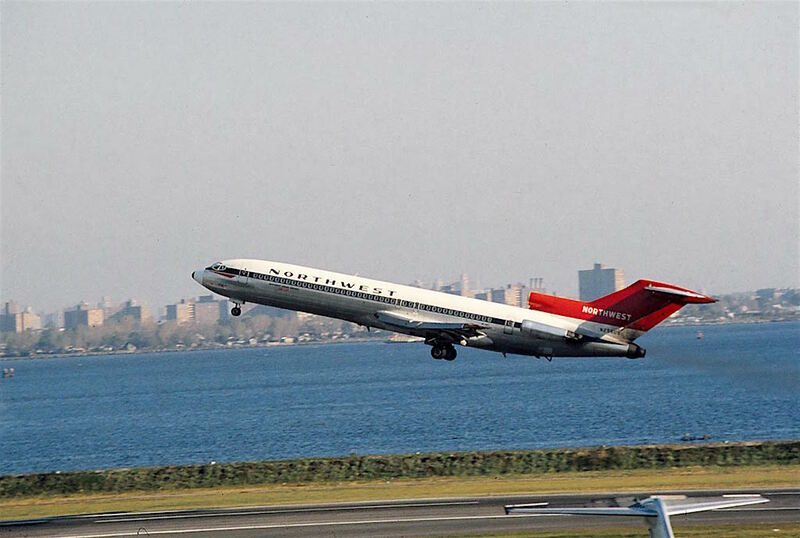 I was fortunate enough to have lived on the 2 mile final to 31R @ JFK from 1966 – 1979. I was just a kid who couldn’t keep his eyes out of the sky. I’d drive my bike down to Rockaway Blvd near the numbers for 22L and sit there for hours. I became so addicted to airplanes that I was able to ID them by sound. I remember seeing almost every airplane in this fabulous montage. Needless to say, in 1977 I soloed at age 16…got my Private at 17…and have flown and owned many different types of aircraft ever since. Had it not been for the fact that I grew up near JFK and catching the flying bug early…I doubt I’d be a pilot today. I chose to run my family business instead of flying for the airlines…but flying is flying. Anyway,these fantastic photos bring back amazing memories of those happy old days of yesteryear. Boy do I miss them!Great job!!! A fantastic collection. 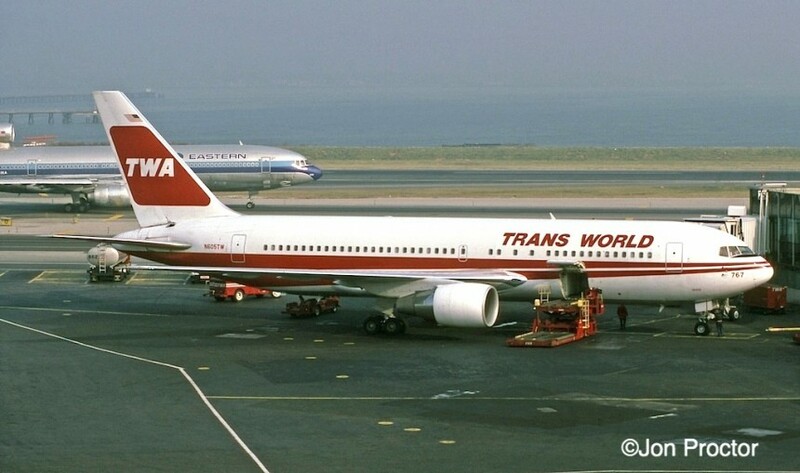 What memories they bring back as a TWA Supv. Don’t forget the CONCORDE!!!!!! The AIR FRANCE’one had his first commercial flight from Paris (France) on november 1977 22nd!!!!!!! THis “bird” also had the Branniff colors when he flew to Dallas!!!! !Tks for all those pictures. Great pictures from aviations golden years. 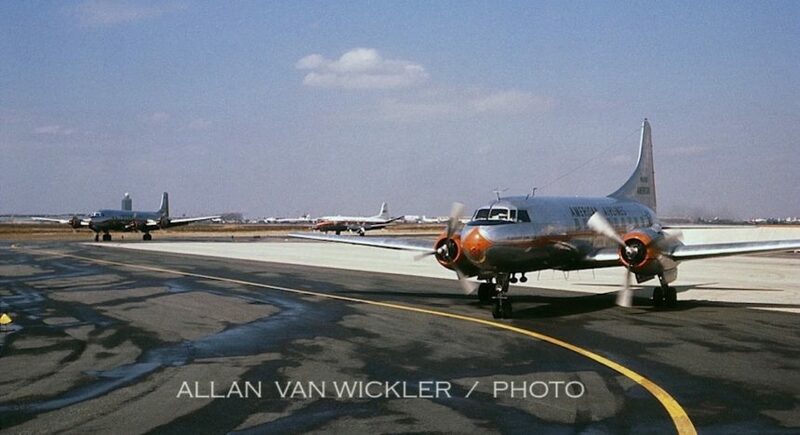 I enjoyed the picture of the AFA Lockheed Electra. I piloted this same aircraft for Holiday Airlines out of Oakland California in the late 60’s. Charter and gambling junkets to Lake Tahoe. Wow!!!! Thanks so very much for preserving and perpetuating the memories that could have been lost over the years. The pix are priceless to all us aviation lovers. That must be some kind of record, all those photos but not one United Airlines plane. Outstanding quality. What a pleasure you have bought to so many by putting this together! 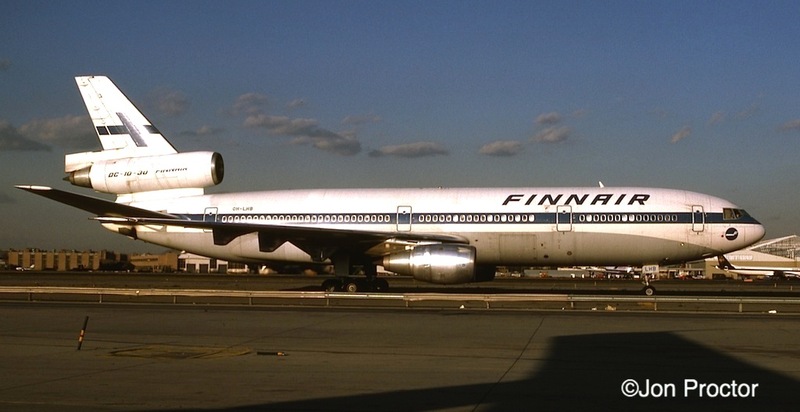 Some great airlines that are no longer with us yet our memories of them will NEVER diminish! I flew for Qantas from 1972-2006 as a Flight Steward/Attendant. Funny we had 5 men and 1 lady on the 707’s and 13 men and 3 ladies on the 747’s. People thought we were a football team checking into hotels around the World! Once again THANKS for the memories. Knew your family and of course worked with you. I will happily share these with many. Arabia making it’s way around the world in 1976. 18,500 hours total on 707 and 747 Classic 300. Just quit this year didn’t want to but they sold my plane and how I miss it. Real airplanes real aviation.Had a fly of the A380 sim before I left it was great technology and it took all of ten minutes to get the flying bit together enough to do an excellent landing but I love the Classic always did always will If I could turn back time I would be a young guy on the 747 Classic and 707 having fun and getting paid for it.Great photos thanks. The emotions get stirred looking at these. What incredible photos. Brought back some great memories. 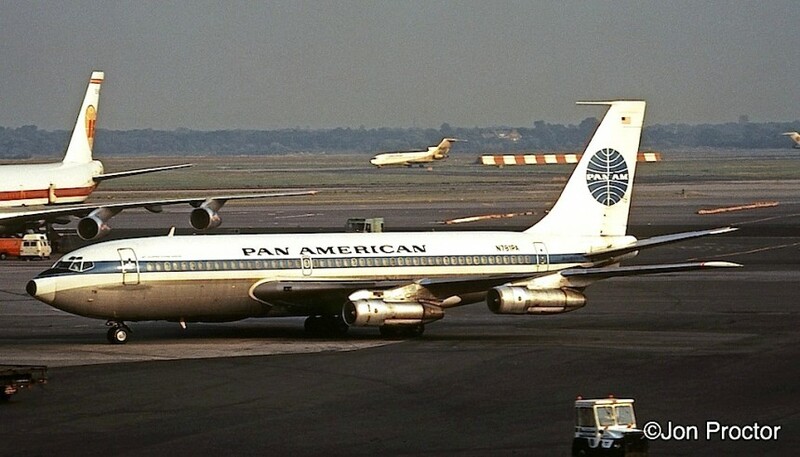 I was a pilot with Pan Am from 1964 until I moved to United with the Pacific route sale in 1986. Many thanks for all your good work. Sweet nostalgia! Of the TW 727s, 707s and 747s I have everyone of them in my log books except one. Brought back a lot of memories. You did a great job of putting this all together and we thank you! Fabulous collection of photos! I know it took a lot of hard work but we all appreciate it. The DC-9-14s, N1051T and N1054T, are a couple I remember well at Texas International Airlines. Worked these and N3504T, DC-9-32, many times. Great planes. Thanks! Good point about IDL, Dan; I’ve amended the introduction to be technically correct. amd I remember everyday this was my life time job and Im produd and I remember PanAm everyday, after, I worked for Continental arlines in Mxico,also with graet times of which Im also proud. Great website. 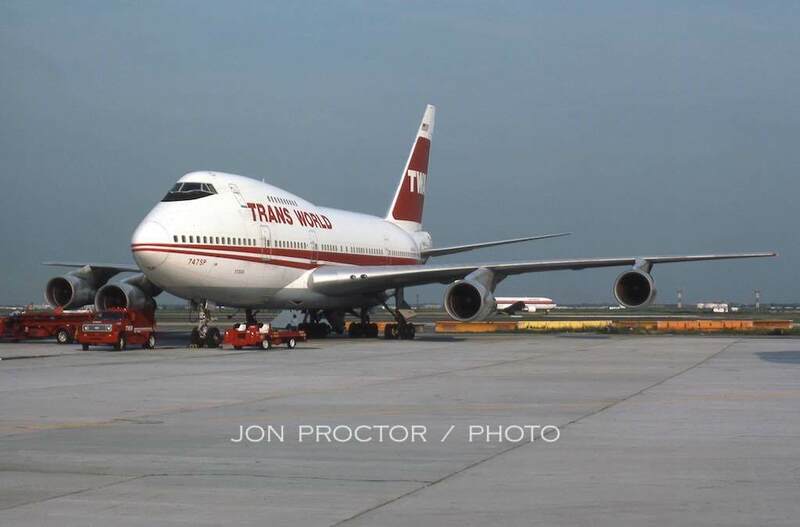 I worked for TWA as an A&P mechanic for 27 years from 1974 until 2001. Most of my time was spent at JFK and I worked at LGA for about two years. I started greasing landing gears on 747s when I was nineteen years old. 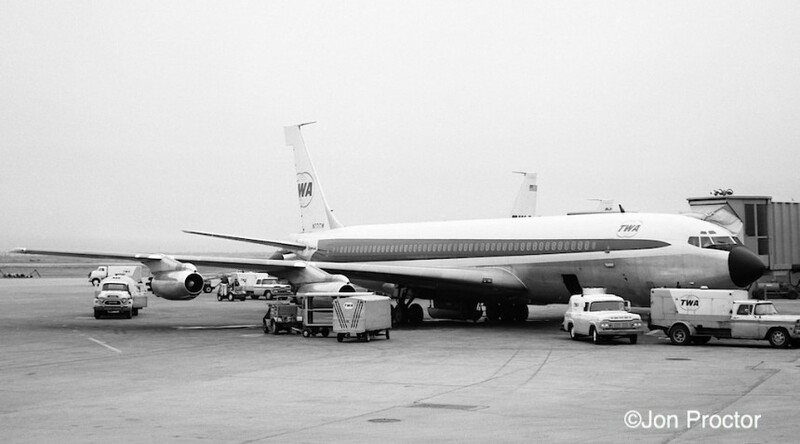 The mystery of Convair 880 N808TW alongside a 747 LD-3 baggage container would date this picture between 1970 and 1974. I remember seeing a Convair 880 at Hangar #12 when I first started in April 1974. The 880 wasn’t there long and I never got a chance to work on one, but heard a lot of stories about them. It was fun job in the beginning, but times got harder later on. However I’m still glad I worked there. 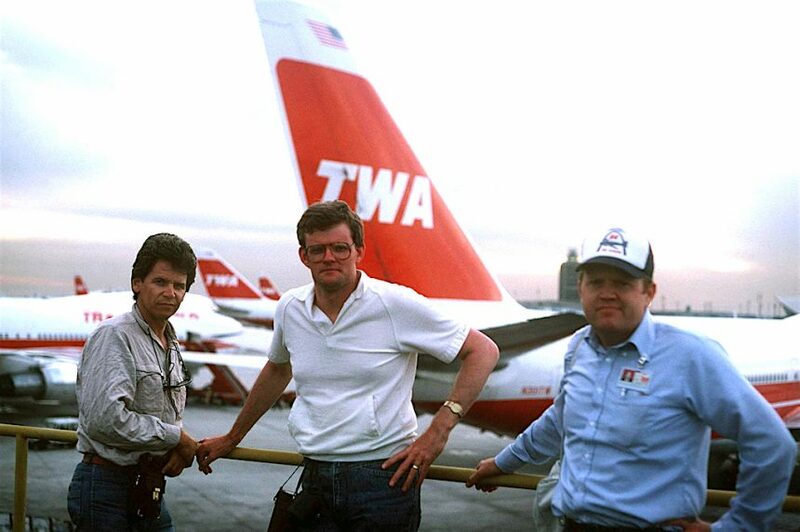 I have a lot of memories and good friends from TWA. What wonderful memories. 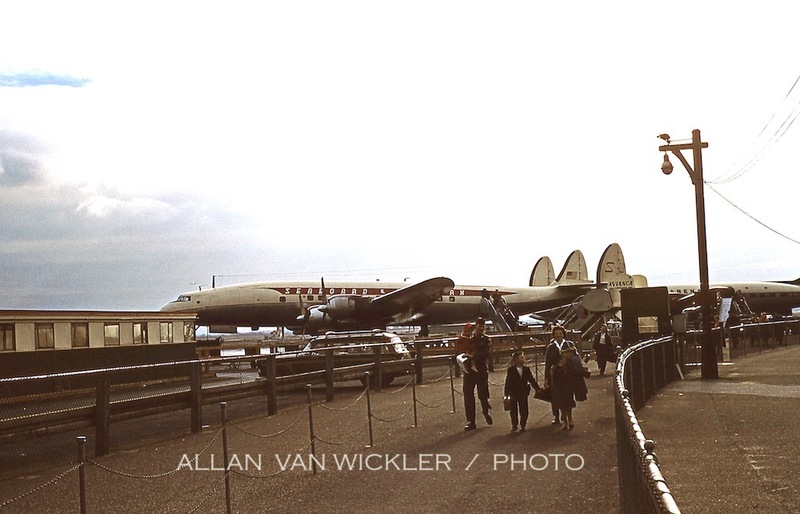 When I was a kid growing up in Brooklyn, Noo Yawk, my Dad often took me to Idlewild Airport on Sunday mornings. We’d watch the airplanes take off, AND we were allowed to go into the planes and walk around. Oh, how I loved sitting in the pilot’s seat, looking at all the intricate dials, mesmerized. Security was not needed back then. One memory still stands out, fifty years later…One Sunday I was wearing a full skirt (no jeans back then), and a nearby airplane started its engines. My skirt blew up and around, and people in the area saw my underwear. I was soooo embarrassed! I’ll never forget that moment. I worked 40 years as a customer service agent for NWA. I saw many changes. I have fond memories of many of the aircraft pictured. The one I miss the most is the 727. WHAT A MAGNIFICANT AIRSHIP. 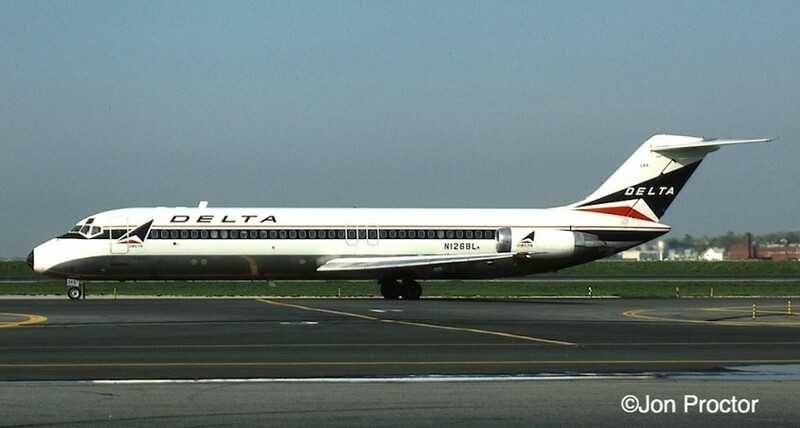 At one time our entire non widebody aircraft consisted of 727s. Thank you for this fine presentation. Always a pleasure to visit your aviation websites, Mr. Proctor. To Mary who said she missed the days of pre-noise efficient aircraft. 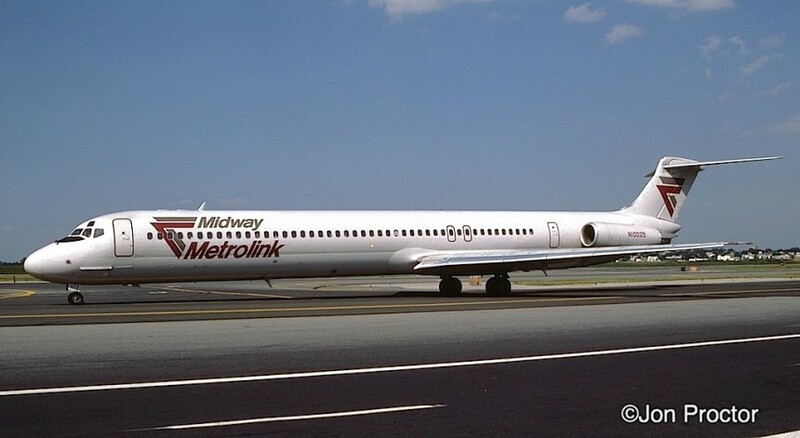 LOL-nothing like sitting astride the runway when the early 727’s took off. I’d have to say they were the loudest commercial jets of all (at the time). I had the pleasure of passing through the TWA Flight Center in the late 60’s…..what a terminal. Thanks again for the great piccies. Wow what an effort. I am sure glad someone had enough sense to take and save these photos. All these collections of airlines have evolved into what we have today as a handful of carriers. I flew for BOAC and BA 1948-80. 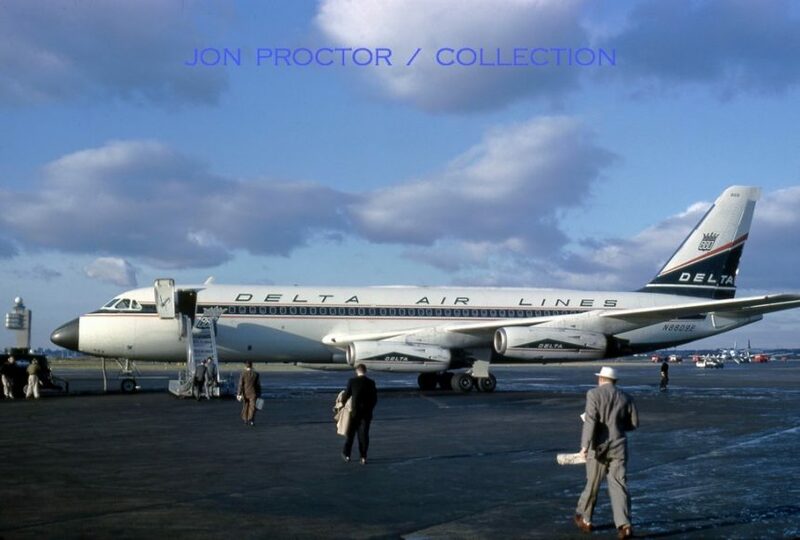 First time into KIDL in a B377 Stratocruiser in 1952, then DC7C in 1956 (first BOAC service), then 707s 300 & 400s. The Concorde 1977 to 1980. Lots of IDL/JFK time. In April1943 saw a BOAC Boeing 314 arrive and depart when on the beach aty Shediac Bay Canada. Was waiting to go to flight training in Calgary. Its all great nostalgia. How lucky we were to be in this era. What fun, and so many good folk. Thanks for the grat pictures Jon. I was a passenger on Seaboard. Congratulations Jon! What a wonderful display of glorious classics. Going through this gallery was like going through a time machine. Thank you so much for preserving aviation history through your awesome pictures and sharing them with all of us. Best wishes! Jon and all his fellow photographers; I B-I-G THANK YOU for giving us a panoramic view into the past glory days of commercial airline history. When I was a kid, my dad would take us to Idlewild to watch the big iron depart for then mysterious foreign destinations. This mosaic means so much to me. Hey Jon, this is a really remarkable website. Its great to see so many good pictures of former times and its fascinating that you were still able to recollect so many facts. Truly, great work! I’m only 32 years old and my first airplane memories are from the early 1990s, but I still consider these old pictures to show the golden age of aviation, they show the time when the world got a lot smaller. Thank you for putting in the effort! Great history, Jon — many thanx to you. I joined PAA fresh out of U of F engineering college in 1956. The DC-3 spent a lot of time in MIA where it occasionally served as a “test bed” for new and innovative electronics — so the “laboratory” tag actually did have some merit. Sperry, Collins, and COMCO (former Pan Am designers in Coral Gables) equipment got thoroughly “rung out” before being ordered and installed in then main fleet. As you know, Boeing 707 #707PA was the 707 prototype, and not the first aircraft delivered to Pan Am. When it finally did arrive, nothing about it was common with the rest of the fleet. It had it’s own unique and highly modified maintenance and wiring manuals, and proved to be a nightmare for servicing and maintenance of all kinds. Love your photographs, they are wonderful! 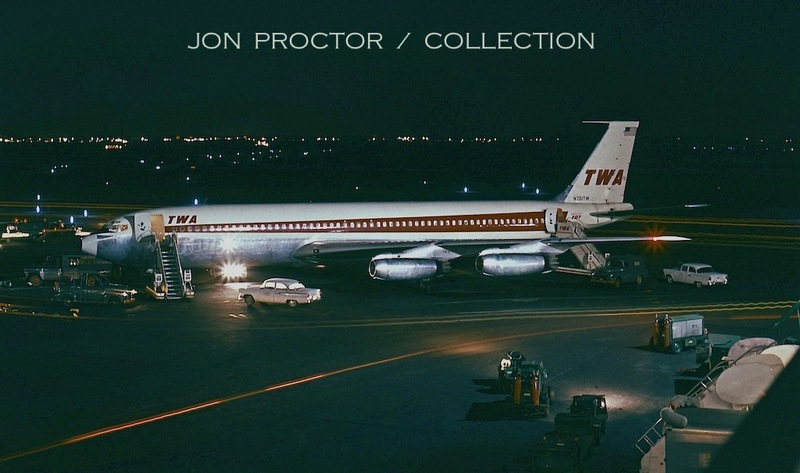 So many memories of these airplanes, what a great collection Jon Proctor! Well done. I was a stewardess on UAL in the early 1960s, and it was a wonderful job. I flew during the years when passenger comfort and “extra care” was so important! Also, we had to quit when we married! Awesome collection, loved every one! Thank you for sharing!!! I lived 29 years with Eastern. Hired on as copilot on Martin 404, furloughed and worked on JFK ticket counter, recalled as pilot. Engineers strike sent me to work at Mohawk, then recall to Eastern famed 262 group. 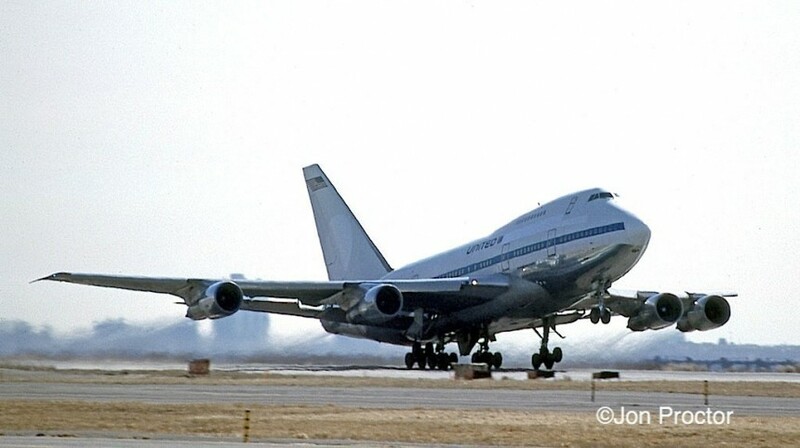 Chased flying best equipment until August 1988 and retired flying L1011. Thanks to a year contract with Lockheed, flying members of the Saudi Royal family, I finally went to work for Gulf Air out of Bahrain. I just wish I had pictures of all the planes I flew and saw around the world. Jon, your pictures and comments have made my day. The end of my aviation career got a B777 rating on my ticket and did the simpilot duty with American Airlines. Again “Thanks for the Memories”. At many European airports the observation decks are still active. Spectators go through security checks, just as passengers do. The expense can be offset with admission fees. It’s a shame that this procedure is not adopted at all USA airports. So many aviation enthusiasts and “spotters” are relegated to viewing and taking photos through perimeter fences. My father Mark “Mike” worked on the first DC-2 and 3 at Santa Monica and ended his career on the Hughes flying boat. My first look inside an airliner was at the old Pan Pacific auditorium where TWA had a new Douglas Mainliner on display. While I spent my time on military aircraft at NAA have tried to keep up with all types of aircraft and still subscribe to Aviation Week. I really appreciated reviewing your beautiful and meticulous collection. Thanks for sending. Enjoyed this very much. 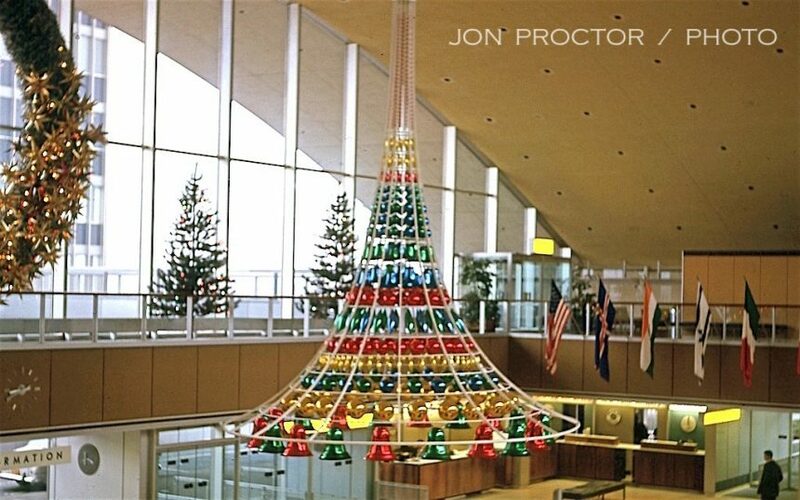 This was a great trip down memory lane, many thanks Jon. I worked for TIA at JFK from 1971-1973 when the North Passenger Terminal (NPT/Hangar 11) was designated for use by all the charter airlines. Never brought a camera to work, wish I had now. In 1972 the post office took over the terminal building (former Lockheed facility) located at the NPT so TIA moved it’s operations over to NWA located on the west side of terminal 2. 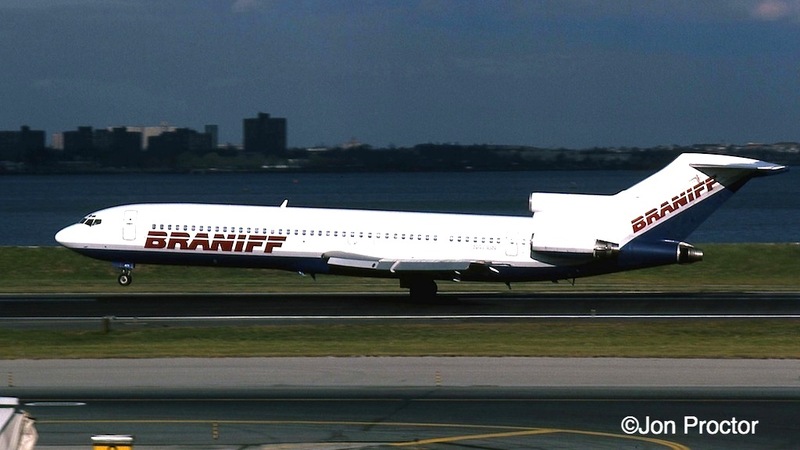 The east side was occupied by Braniff. In 1973 TIA moved its operations again over to the AFR terminal located in the IAB. Thank you for a job well done. This brought back memories of my days from 1970-1982 when I made 3-5 flights per week for my Company. I shuttled between Chicago, New Yok, Indianapolis, Cleveland, Cincinnati, Columbus, Louisville and ocassionally Atlant and Florida. About 1973 I took a 707 out of Cleveland for Louisville. It was on a Sunday evening and there were only a few people on the plane, (not like today) The Captain even apoligized for the lack of passengers. Anyway, when he throttled up the plane to go, It went! It was the fastest movement from a dead stop that I have ever experienced on an airplane. Of course as we all know everything changed after that. But thank you for the memories. I was an air traffic controller in the Golden Age (or at least the tail end of it), controlling traffic in four decades (’60s, ’70s, ’80s’ 90s). While I don’t have quite the CV of some of the posters, there was something at every turn in this history with which I could identify–fallen flags (some of which I’d forgotten), long gone (and missed) airplanes, reminders of how my work was done and how we interacted at some level or another. I’m interested in hearing any stories ex EAL folks may have of Herman Wilhelmi and Slim Cockes. If you knew them, you know why I’m asking. Sir. I m a boy of 18 from India aspiring to be a pilot and I am an airplane lover. Your collection is one of the best I have ever laid eyes upon. Thank you for sharing them with us. Thanks for the kind words, Vicki! Superb! 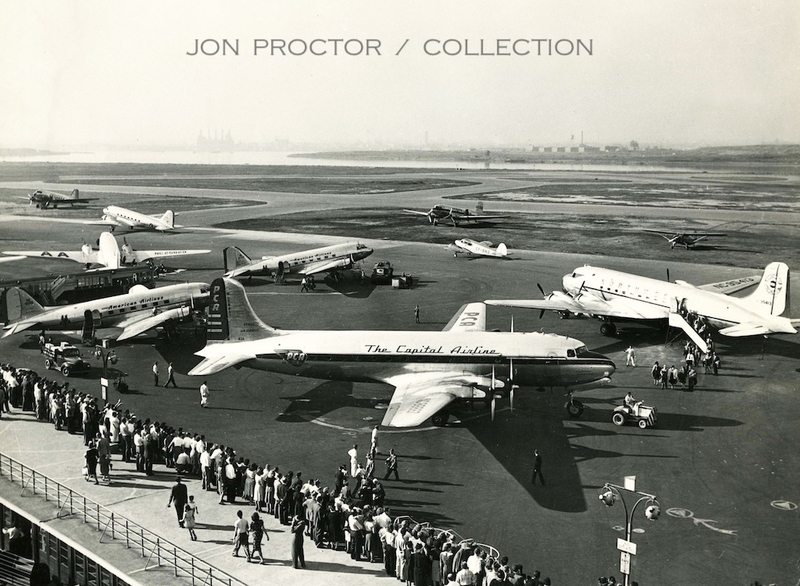 Loved them all including smaller northeastern carriers PBA,Bar Harbor Airlines,Pilgrim ,Air North and Empire .. the very best collection I have ever seen. Bravo Jon! What can I say Jon…you are the man! It is a pleasure to know you and nobody does aviation photography better! Thx for the memories…!!!!! 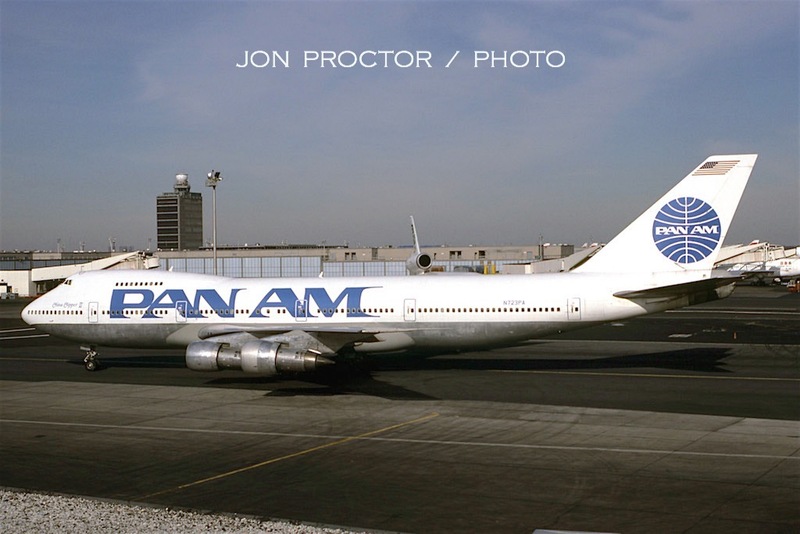 Seeing Clipper Maria parked at the Pan Am Worldport brought tears to my eyes….now both are gone. Thank you for all the wonderful memories. 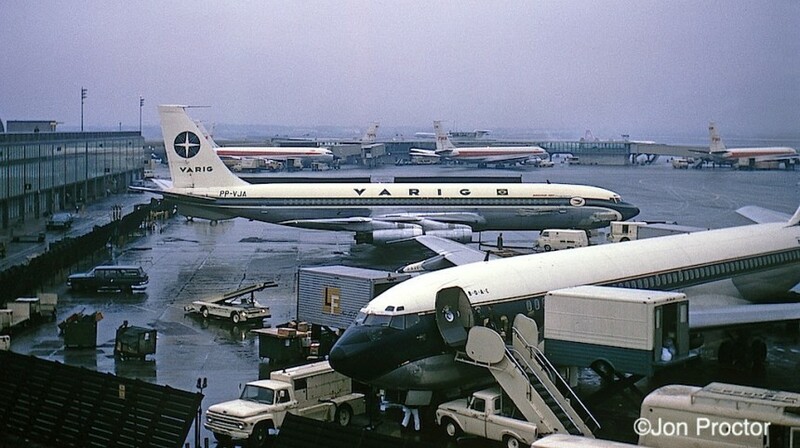 I started in the airline industry back in 1972 with VARIG and stayed on until its demise. 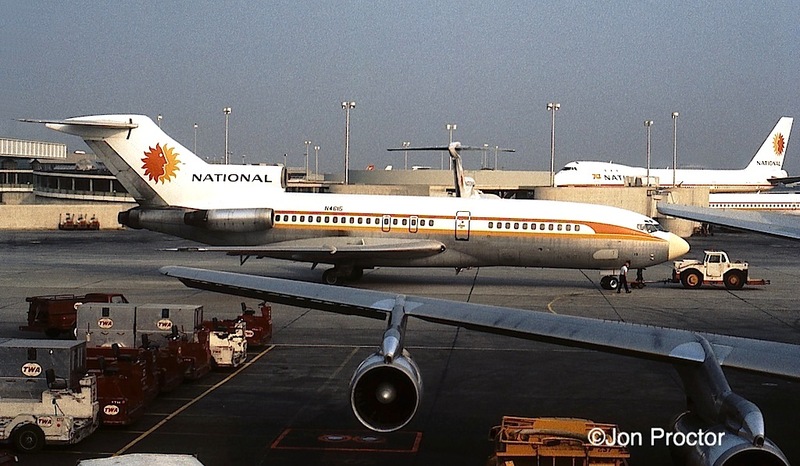 Seeing so many aircraft from the “old times”, specially RG’s B707, PP-VJA (at one time the B707 with more flying hours) brought back many happy memories. Thanks for the pictures. Great trip back in time. AAl Flight Engineer for 40 years. DC 4 to DC 10, and everything in between.Had it to do all over again….I shure as hell would. What a fantastic group of photos. 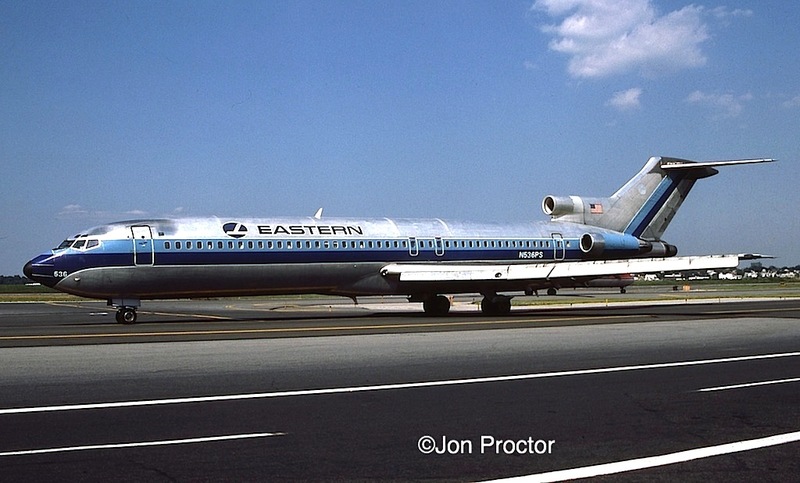 I got hooked on commercial aviation in the early seventies after flying Eastern Airlines from LGA to Daytona Beach via Atlanta several times with my family. Most of your photos ring true of what I was seeing on approach above the house in Wayne, NJ, back then. Now I recently relocated about a mile south of LGA with many approaches just a few hundred feet from the roof of my building. HEAVEN….but sure do miss seeing widebodies use the airport. I do remember seeing DC-10’s and L-1011’s at LGA way back when, and saw the last TWA 1011 service. DL used to fly 767-300s more recently, but now they’ve gone too. In the meantime, it’s still great to have the aircraft in view on a regular basis. Thanks again for all the great photos and history of your experiences. I enjoyed your photographic walk down memory lane. It is sad that the security concerns have made most airports into armed camps instead of airports. It is strange that banks are now more accessible than airports or even FAA offices. 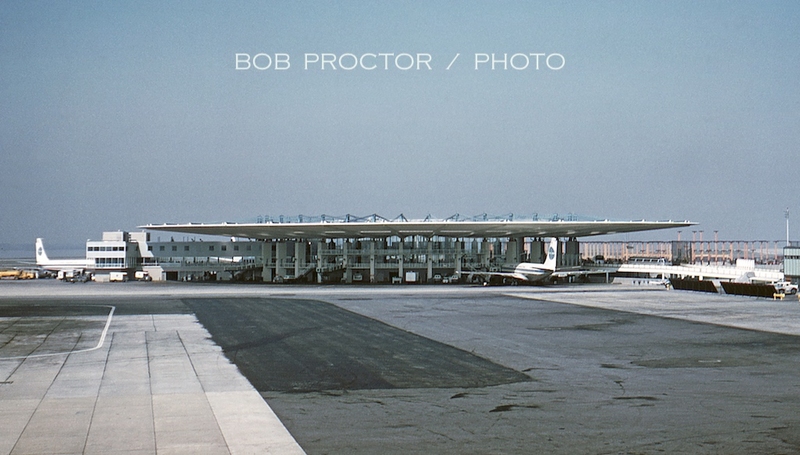 I remember waiting for my grandfather to arrive at the old terminal on the south side of LAX in the mid 1950’s. He came in a DC-6, I believe. I stood behind the fence and marveled at all the activity on that spring evening. When he got off, my mother walked right out onto the ramp with me and my two sisters to greet him. 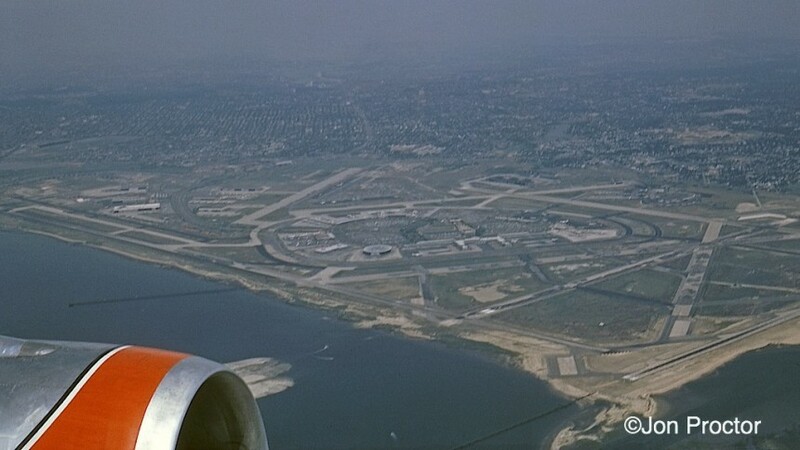 Then there is an incident I remember when I was flying back into the McCulloch facility in Long Beach, CA. My wife and toddler son were waiting for me to arrive at he McCulloch Ramp. When my son saw my face in the left seat as I pulled in front of the hanger to park, he pulled away from his mother and started to run toward the Electra. One of the mechanics, quicker than my wife, scooped him up as my son pointed toward the cockpit and hollered “Daddy” at the top of his lungs. I waited until everyone was off the airplane and my toddler son started up the ladder under the supervision of my wife and one of the mechanics. We got off and when home shortly after, but my son kept stealing my uniform cap and running around making what he thought were Electa noises for months after that. Loved to scroll through history with you on this site. Great historical pictures and brought back many memories to me as well. Keep up the good work. Please note that Mayor LaGuardia in first photo is wearing his QB wings on his left lapel (although a bit crooked). I have never seen a photo or film clip of him without them. Thanks for these magnificent pictures! Sure does being back memories. Appreciated them! Appreciating the dedication you put intoo your blog and detailed information you present. It’s nice to come across a blog every once in a while hat isn’t the same out of date rehashed material. What memories of aviation. I started with Airlift International in 1975 in MCO and went to MIA. I finished with Arrow air in Dec. 1999. I also did a stint overhauling landing gear in Miami. I miss the airport. Thanks for the memories. A wonderful collection, especially those nostalgic shots taken in the 1950s, ’60s and ’70s. 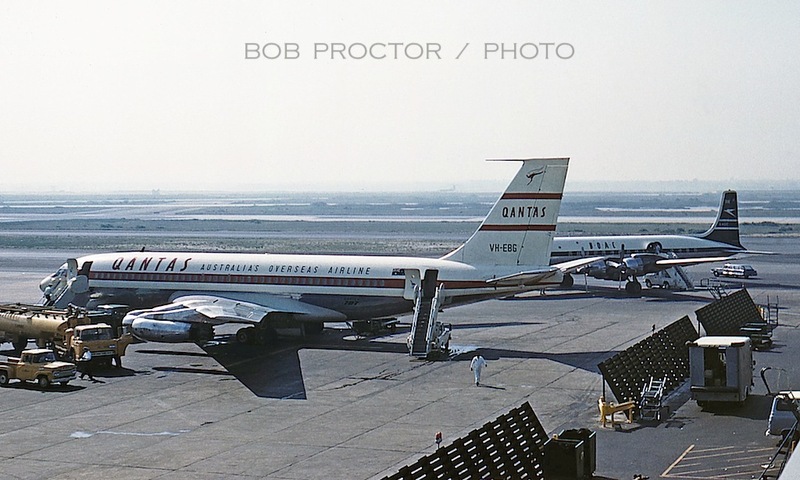 One small comment, the Qantas Boeing 707-138Bs, and later 707-338Cs, were not called “V-Jets” due to their having power equivalent to five engines, but from the Latin term “vannus” meaning “fan,” a reference to the turbofan power plants. I have a 1960s Qantas in flight magazine that explains it thus. Thank you for the correction I’m scratching my head, trying to remember the airline that advertised the fifth-engine advantage of turbofan power, but it wasn’t QANTAS! Jon; These photos remind me of my childhood and adolescence! I’ve enjoyed a career in Aviation that has spanned 35 years (thus far). Many of the photos are from the forgotten past. Thanks for sharing! Great stuff – I was a Military Policeman detailed to the FAA as a Sky Marshal in 71-72. 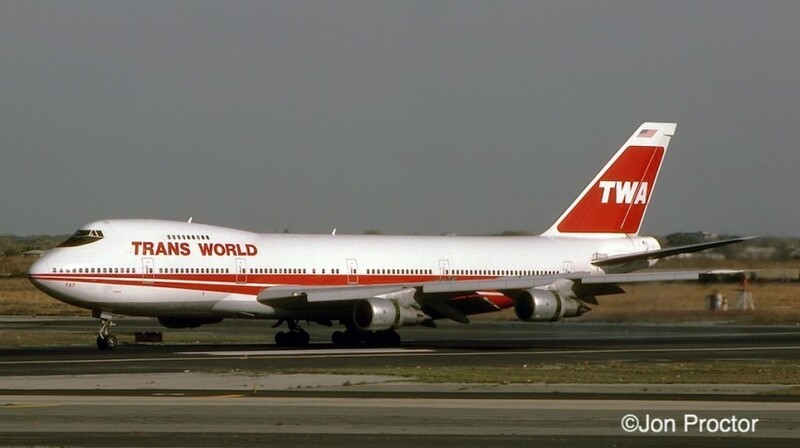 Flew exclusively on TWA international routes. The old 707s and 747s brought back all the memories. A great credit to the outstanding summary of Aviation History. 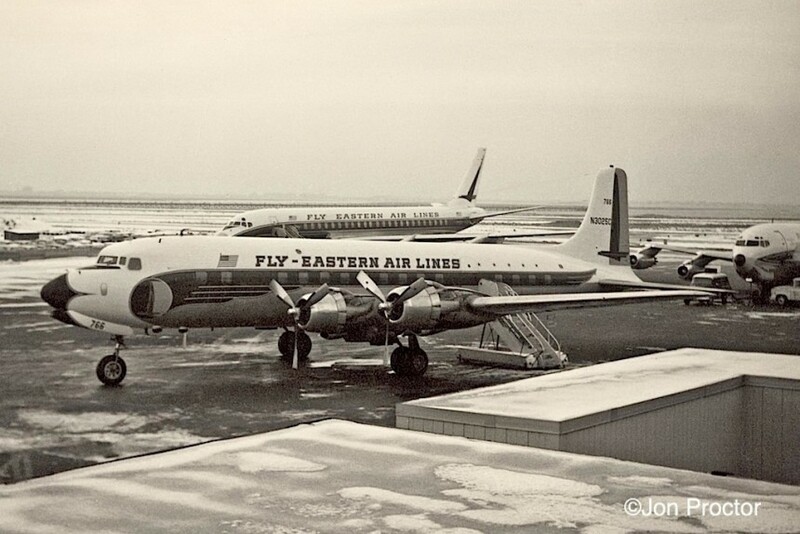 first trip across the Atlantic was on a DC-6B into the old terminal at Idlewild. from JFK to Scandinavia, Germany /FRA / BER /VIE and Eastern Europe. Thanks and Keep the Aviation Community together for a Long time. ! Great pictures. So many memories from growing up in Arverne, Rockaways. My buddy and I could identify both plane and carrier from miles away, spent many a weekend day at Idlewild/JFK walking around the airport, through the terminals and onto many planes. Working summers during college days for Allied Aviation loading bags (by hand) onto planes at the IAB. Thanks for memories! Yea us Rockaway guys did spend some time at the ‘Big’ airport….We didn’t fly in…We biked in…..
Later some of got to fly out of the place in various aircraft that are resting out in Arizona…. I see I join the group of people who worked there….. 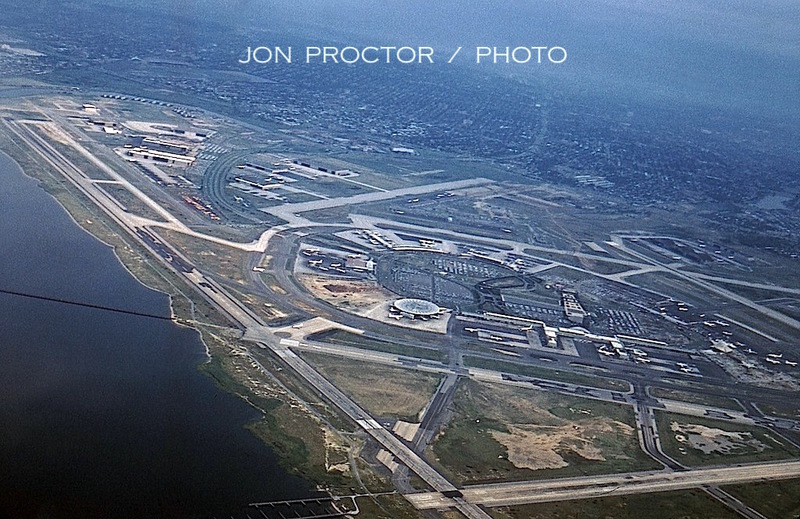 Most probbaly wouldn’t reconize JFK anymore and LGA is just …Well…. LGA…..
Jon, I stumbled across your wonderful pages filled with airline memories while searching the internet to find a former roommate of mine in NYC. Sharon Murhy and I were classmates at Breech Academy/TWA in the summer of 1970. We both flew internationally for TWA and were based out of JFK in New York. Of course, we lived in stew zoo–Kew Gardens! We were all layed off that October and Sharon went home to Texas. I stayed in NY (originally from Iowa) and in a few short months was hired by Pan American (Frank Lennon). I flew for only 3 1/2 years but the memories are vivid and incredibly special. I married Brent Mechler, who, like you, was a DCS for TWA. We have been married 42 years, have four grown children and 7 grandchildren. Life is good, but it’s always fun to reminisce about the good ol’ days! Jon, really enjoy all your photos and stories. Having been in the airline business at this point about 47 years with PA, EA,CO and now UA, I have either been on or seen many of these aircraft. As a kid in NY were Dad work for PA at IDL spent many hours on the observation deck taking pictures, and am just now locating and trying to get them scanned. The best shots of the group are the PA planes, and those at the hanger at IDL of N709PA in September 1958, we were there that day, and have some pictures taken there someplace. On my Photobucket site there are a few of the old shots that might be interesting. Thanks for taking the time to chronicle all of your travels and shots. Many thanks for your kind words, Jim. I was unable to find your Photobucket site; would have enjoyed seeing it. Jon, A friend sent me this website on Christmas Eve, so I consider it a present from you and him. Your collection of photos and comments is a great chronicle of ‘back in the day’ memories. Thank you for doing that! I worked for TWA between 1969 and 1973 as an International Hostess, Supervisor, DCS and training instructor in Kansas City. Later adventures led me to be an aviation consultant and aircraft appraiser in NY and then ATL. Many fond memories are in your collection. Thanks for sharing the evolution of aviation history in the USA. It is amazing to see the first aircraft and their evolution ’40s to the 1990s. Now now we need to update our present airports and architectural innovation for the new century. But this report has been the most complete that shows from propeller to the jet age in detail. I enjoy it very much and learned a lot. Thank you for sharing. May I add my thanks also. Spent many years with the airlines, beginning in the late 50s, with PI, TWA, AF, AZ, Capt. Intl, and finally with Big Blue, PA, spanning the world with assignments and flying most of the airplanes shown in your evolution. Fond memories. I learned about “short snorters” when I read GLACIER PILOT by Bob Reeves who was he owner of Reeves Alutian Airline. I had the good fortune to meet him while stationed in Alaska and he gave me a short-snorter. In his book he described it as a bill($1) signed by someone for whom you had bought a beer. If you were ever caught without it, you were required to buy that person a beer. Then if anyone else bought you a beer you would have to sign their short-snorter and buy them one so they could sign yours and so on. If ever caught w/o it you owed whoever caught yo a beer on the spot. Never knew that they had something to do with an ocean crossing. Thank s for the pix. Thank you Jon Proctor for documenting history as you captured these iconic Airplanes.I was a line mechanic at LGA for AA from ’67-’83 and worked on these 727, BAC 111,L188 Electra’s as well as the DC10.Great memories of those times as well as growing up near LGA and spending lots of time watching those great machine of that era.After leaving maintenance, I had the great pleasure of flying the 727 & 737.Ultimately retiring as Captain on the 757/767 on international routes.Thanks for the memories. Fun stuff! That Delta DC-10 may have been on her way to MSY as Delta was running a daily round trip LGA-MSY. 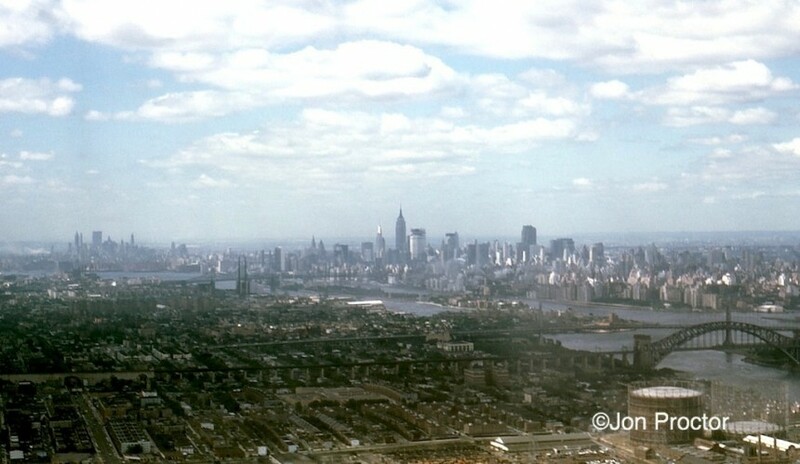 Three months later in April 1973 I flew the same aircraft LGA-MSY. Wide bodies were(and still are) fun to board via stairs. . .even though I don’t have the knees of a 13 year old as back then! I discovered your site just recently while researching a book project on the history of the airliner. 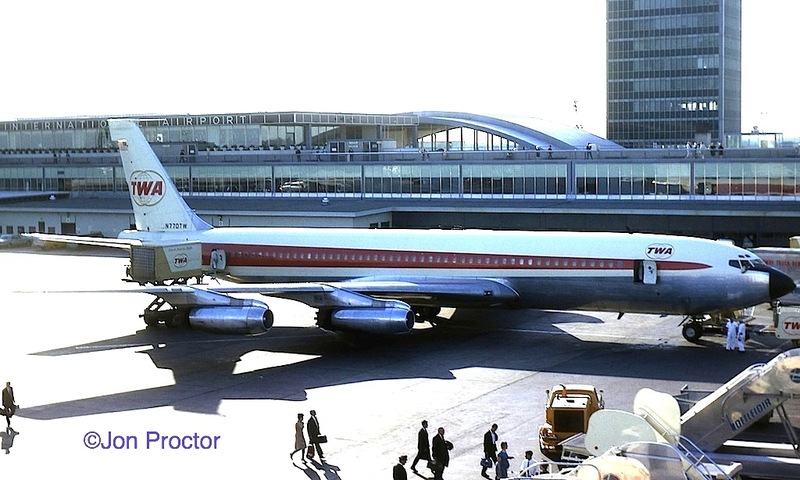 Your photographic archives are a wonderful visual presentation on the rich history of the airline industry. Thank you for sharing these great photos. Many thanks for your kind words, Ted; much appreciated. Thanks for the memories! My lifelong “love affair” with JFK began in February of 1965, when my mom took a job with Air India in the West Wing of the IAB. She worked there until her retirement in 1984. 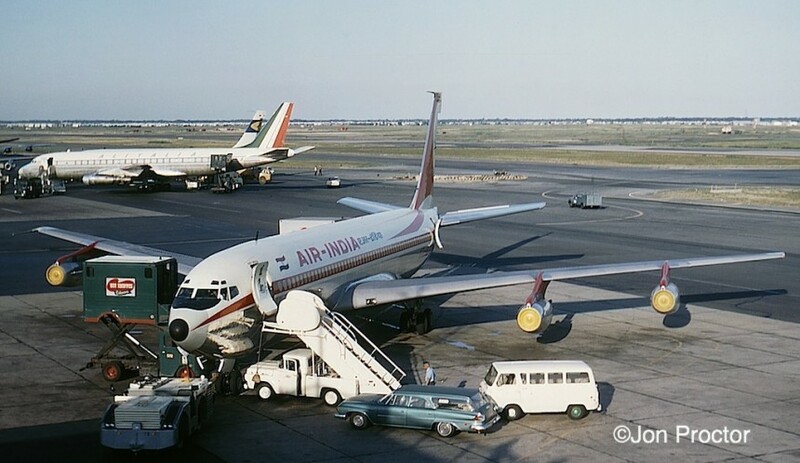 I enjoyed seeing the photo of the Air India 707 on the ramp with what looked like a 1963 dodge station wagon parked underneath. I also worked summers during my college years for the Parking Lot provider at the time, Kinney Parking. I enjoyed your comments about being able to get out onto the ramp with nearly unlimited access, if you knew where to go. When I was at Kinney, we had a ticket storage facility in Hangar 5. It was a long drive via the regular roadways, so if we had to go during times when the airport wasn’t busy, we took a “shortcut” (“wink”). Needless to say, the Port Authority Administrator, a fellow named Ed Sullivan (no relation to the TV personality) was not happy with us when we did that. But he would always be kind of laughing when he chewed us out. And then there were lunches you could buy at the Pan American catering facility near the 150 Street exit to the airport. Cheap and delicious! Great memories, Leonard; thanks for sharing. I enjoyed looking at your photographs. 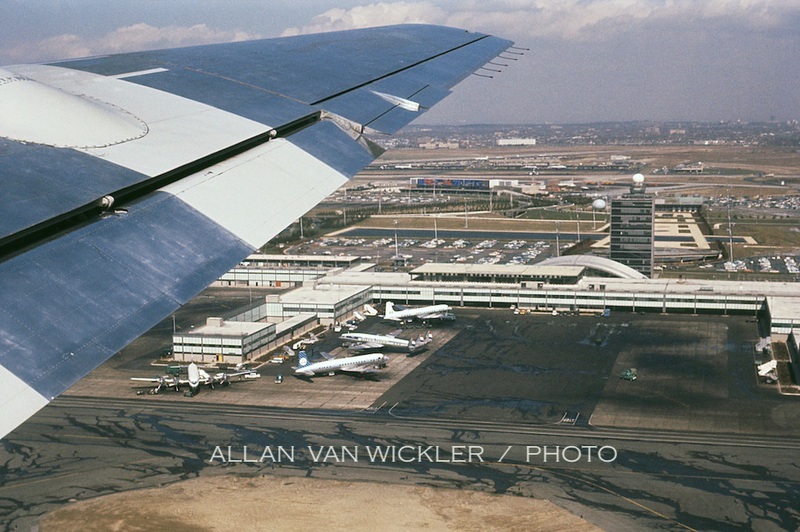 Would you know how to find out which airport (La Guardia or Idlewild) KLM used in late 1958? And would they have been flying DC-4s or DC-6s (or both?) at that time? Thanks! 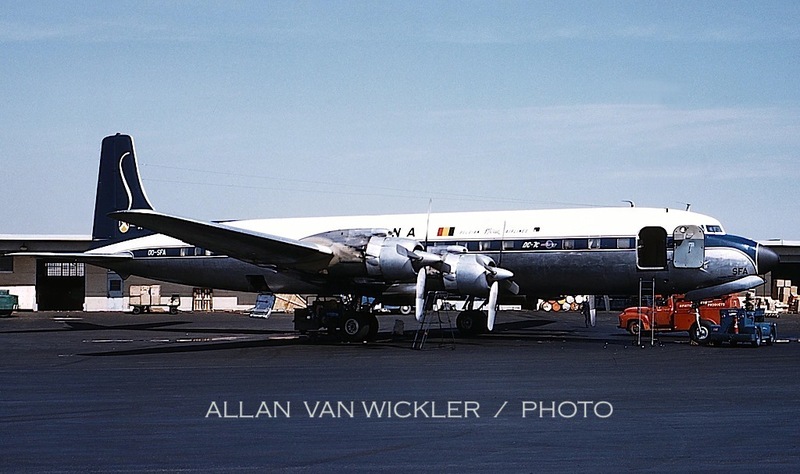 By late 1958 KLM was operating exclusively from Idlewild Airport, with DC-7Cs and perhaps 1049G Constellations. DC-6A freighters were seen there as well.